A couple of years ago, when I went to the NASSP Conference (National Association of Secondary School Principals), there were these principals from all over the country, who I could say I sort of knew through Twitter. I followed them and they followed me. 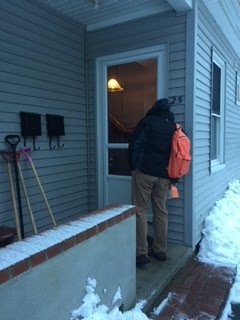 There were a few specifically from Ohio, who were handing out postcards talking about the idea of #ShadowAStudent Day. 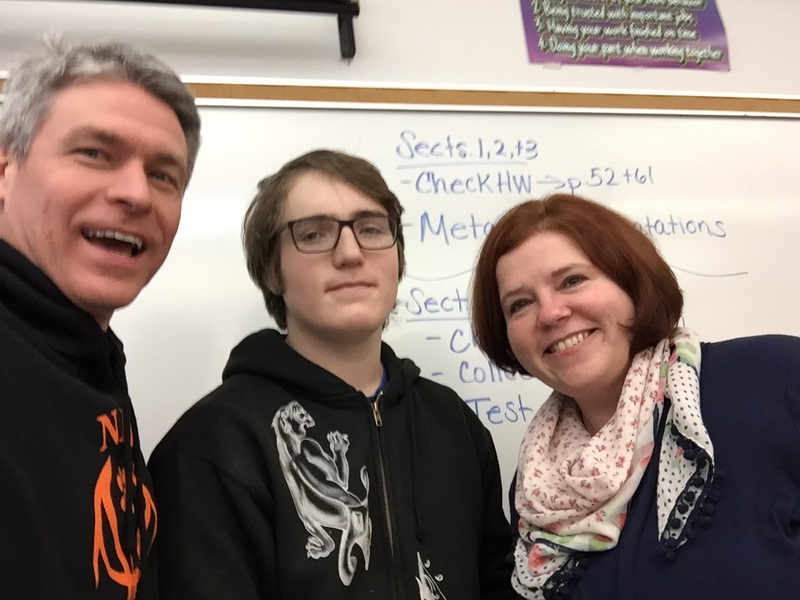 As the website shadowastudent.org says, in their section “In a Nutshell”: The Shadow a Student Challenge is a fun, illuminating, and supportive journey where school leaders come together to empathize with their students and take new kinds of action at their school. Educators and researchers have long known that shadowing can lead to powerful observations and insights to drive change. 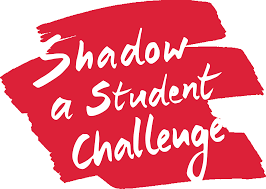 The Shadow a Student Challenge provides methods to help school leaders achieve Deeper Learning for all students. 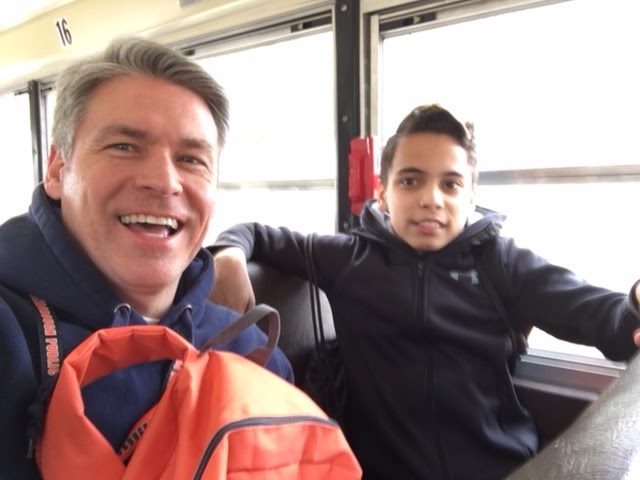 This year, like the last two, I kept looking forward to participating in the #ShadowAStudent Day. 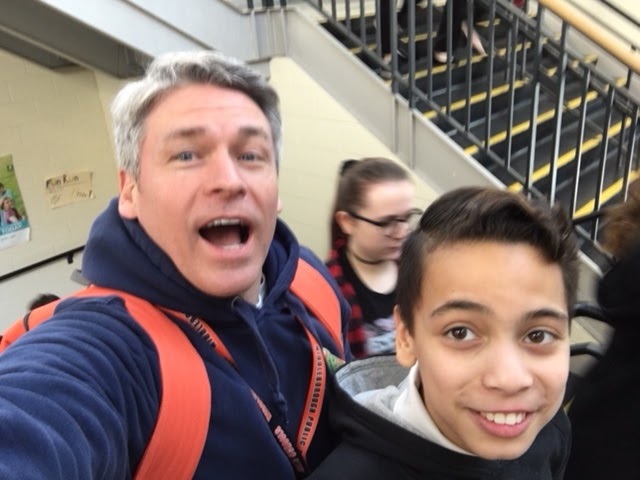 I worked with the faculty to decide which grade and team I would shadow, and it was decided that I would be an 8th Grade Apollo for the day this year with Mike on Thursday, March 1. 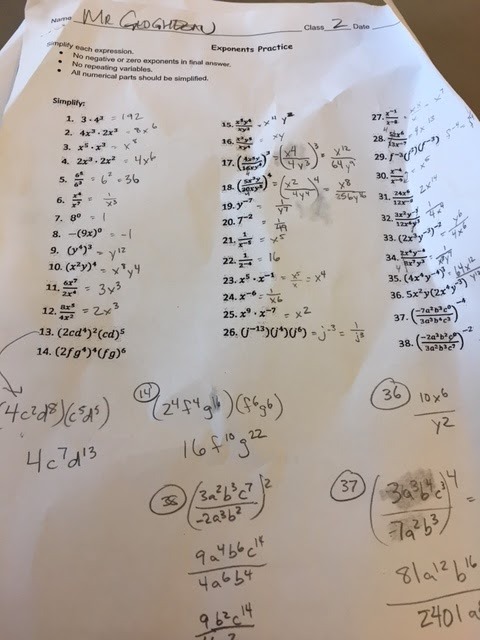 With the teachers knowing what to expect from having me in their classes before for a Shadow Day, they gave me the homework to do before I came to class. Well, I guess I played my part as a “student” for I didn’t get to the work until the night before. 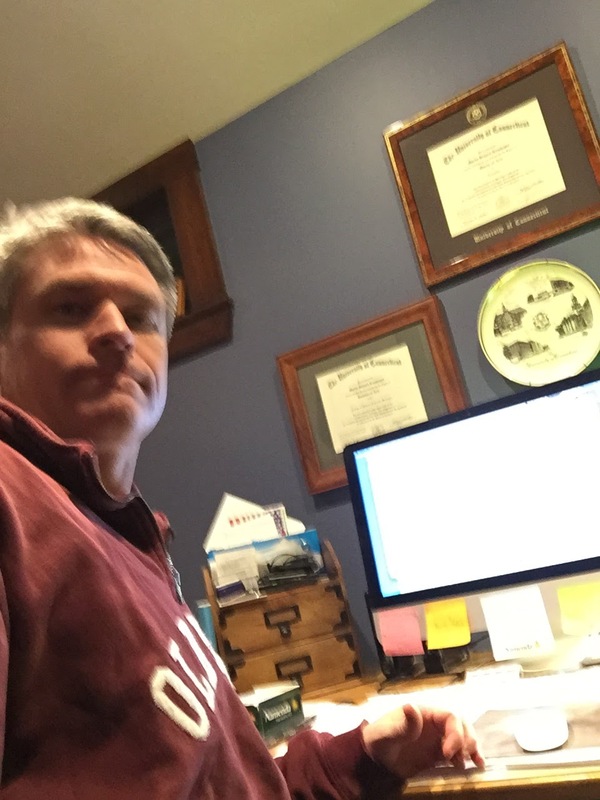 My own two sons in high school cracked up seeing me doing my “homework” at the kitchen table. 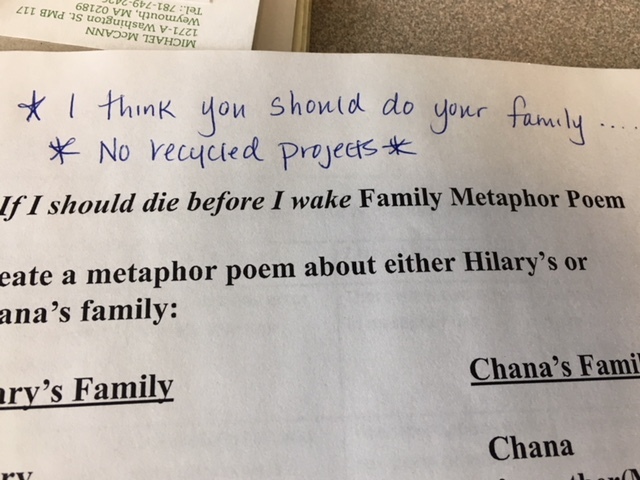 Ms. Flaherty, Apollo ELA Teacher, made a special note atop my project direction sheet to emphasize, “No Recycled Projects” so I had to start from scratch. 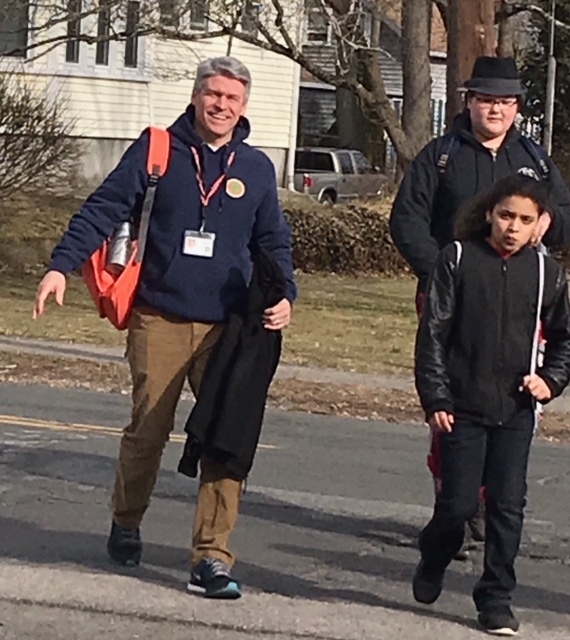 I got all of my Homework done, got my hoodie and Nikes on, and set out to experience my day as a Nichols Middle School 8th Grader on Thursday, March 1. 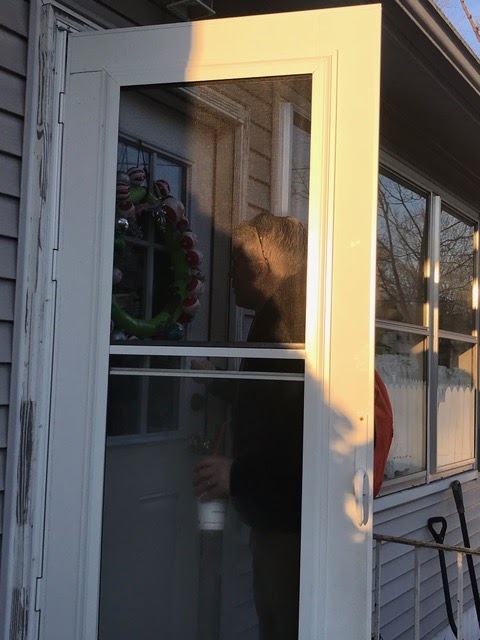 As I have done the last couple of years, I met my student, Mike, at his home to head to the bus stop. Mr. Thomas picked me up at the school and brought me to Mike’s house. This has been a similar reflection as the last couple years shadowing in that a household with students is a busy morning for all. Mike and his brothers were involved in trying to get ready to go, as their mom shuffled in and out of rooms trying to make sure everyone had everything they needed for the day. 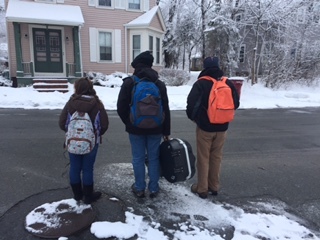 Mike, his brother, and I then packed everything up and headed towards the bus stop at about 7 AM. 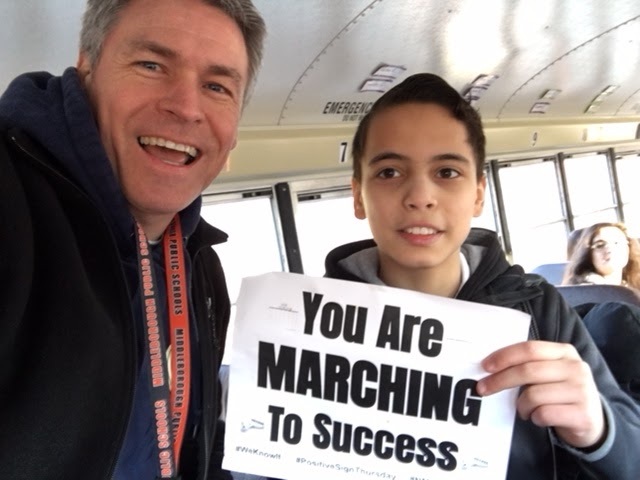 This was definitely a special day, for not only was it #ShadowAStudent day for me and Mike, but it was also #PositiveSignThursday, so at the bus stop, we decided to take some Positive Sign selfies that connected to it being the first day of March. 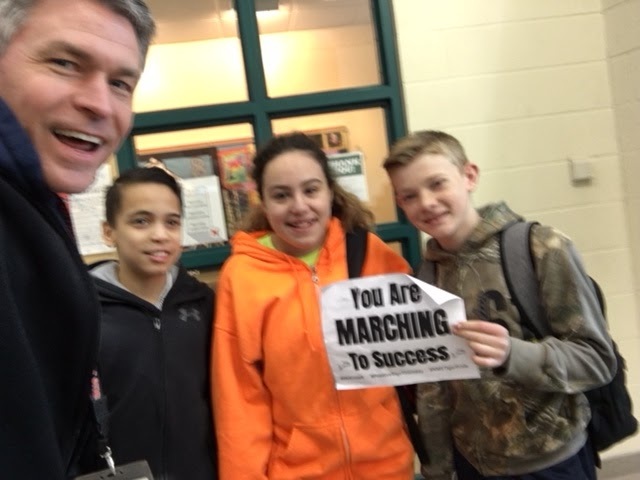 With our signs, we try to connect to something going on and with it being the start of March, we decided to remind our NMS students that they are continuing to March along to a successful year. Our bus stop and bus ride experiences were also fun. Mike’s bus stop had about 25 students at it, so they enjoyed seeing me and wondering what I was doing. 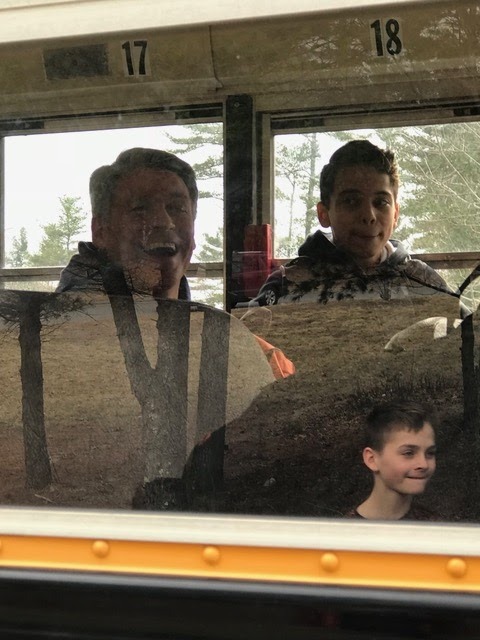 The seventh and eighth graders had an inkling but the sixth graders were definitely confused, especially when they came on the bus and spotted me in the back. 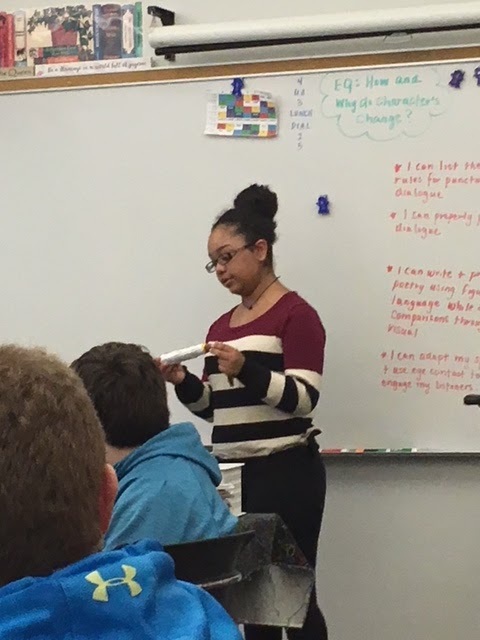 Students on the bus were talking about their homework, how they did on it, and how they were a little nervous about presenting their metaphor poems in English. 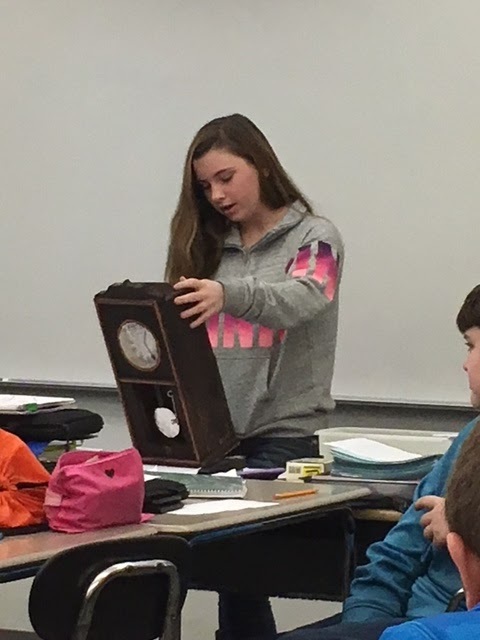 With a little encouragement, I was able to remind them that they have been doing presentations their whole middle school careers. 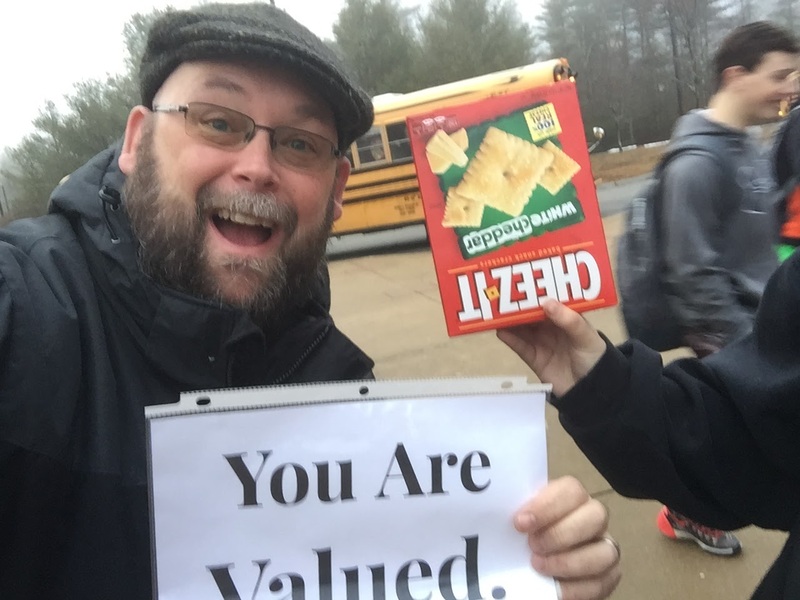 When we got to school, I could see from the perspective of a student how cool it is that our two Assistant Principals, Ms. Rae and Mr. Thomas, were at their normal spot greeting students as they got off the bus, taking their #PositiveSignThursday selfies. Again, building those relationships is such an amazing thing. 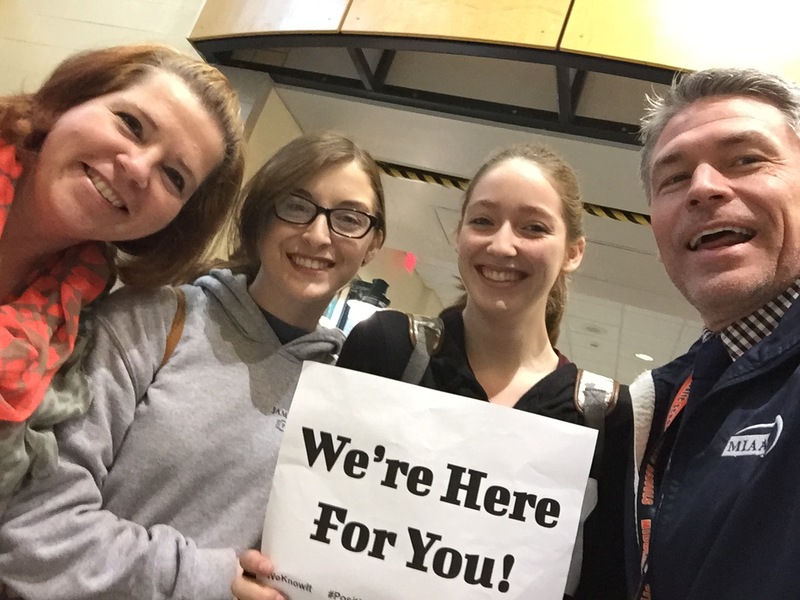 It shows our students we care, and more importantly, we care about them. 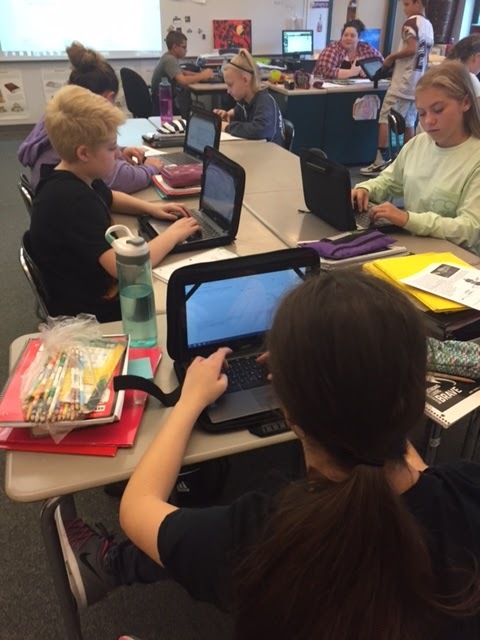 In Ms. Flaherty’s Homeroom, students grabbed their Chromebook for the day. Mike talked with some of his friends about homework, the day, and how he probably wished I would stop taking pictures. The kids were all very funny in wanting to call me “New Kid” or Marty. They were definitely having a great time with the whole event. I mentioned this each and every year of doing the Shadow experience, but it is such a positive element to our school and our school culture. A common theme, which happened in Homeroom and every single period after, was how our teachers greet our students at the door of each class. Again, #RelationshipsFirst are happening multiple times a day and through multiple means. 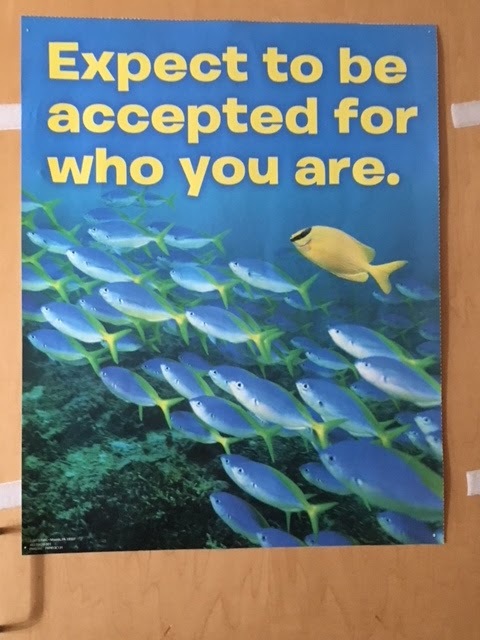 Our students, I believe, appreciate this and notice, as I did. 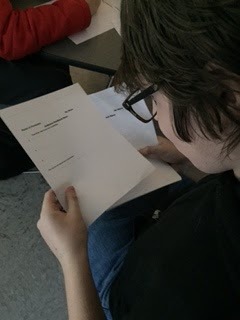 We stuck in Room A106 for first block, for Ms. Flaherty’s ELA class was our first academic class of the day. 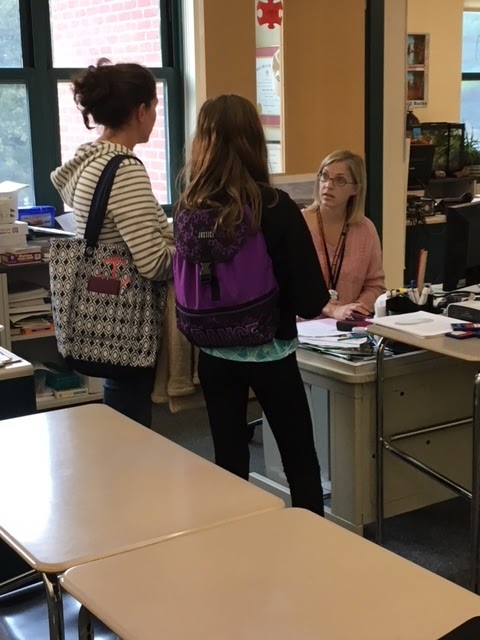 She started the period by walking around and talking one-on-one with each student. She was checking homework but she was also checking in with them for the day. 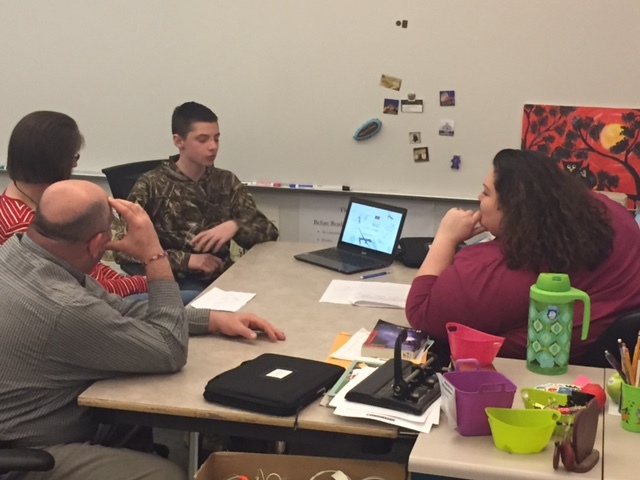 The project presentations by the students, and myself, were established on student’s choice and student voice came through loud and clear. 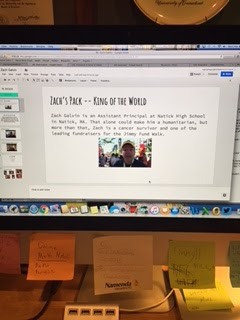 Students could show what they learned from the story and how they wanted to personally display it. This voice and choice in showing learning will not be the only time I will say this as I move through the school day. 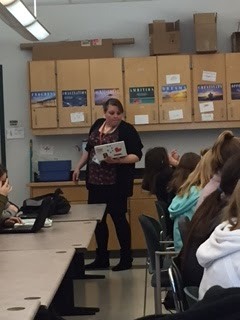 Ms. Flaherty emphasized to her students that everyone could do well in making their presentation. 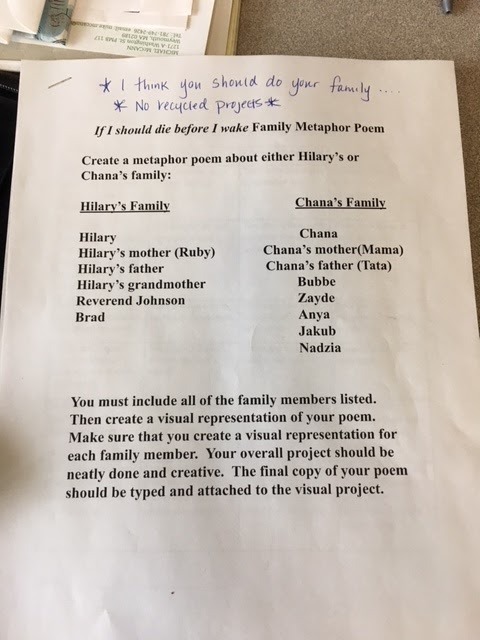 She reviewed the Learning Target of the Day which read that “I Can … meet the expectation of presenting my metaphor poem to the class.” Ms. Flaherty, again, said that she knew they could do it, and that they could do it well. She talked about how impressed she was already with those who had presented prior. She was doing a tremendous job building up their confidence. 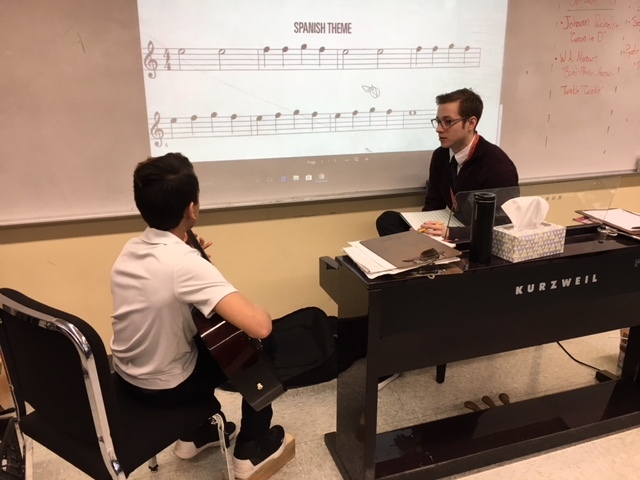 Our next class was a Unified Art of General Music with Mr. Converse, so Mike and I had to get moving to head to the Music wing. 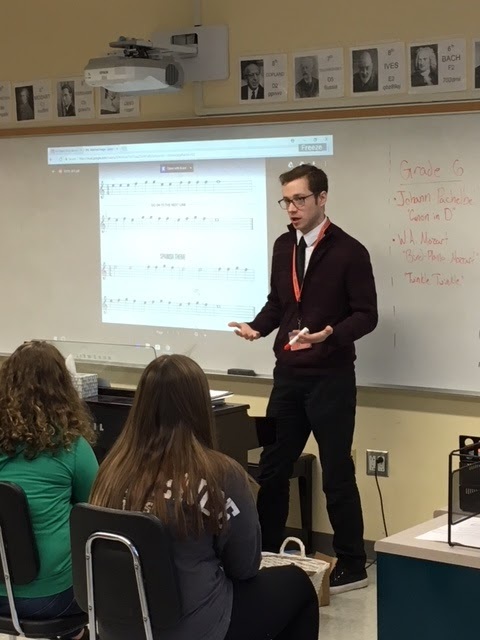 In Music, again, Mr. Converse gave students the chance to decide what they wanted to do. If they didn’t want to “perform” on the guitar, they could do a chosen research project on a guitarist/band from a certain decade, based on the roll of a dice. 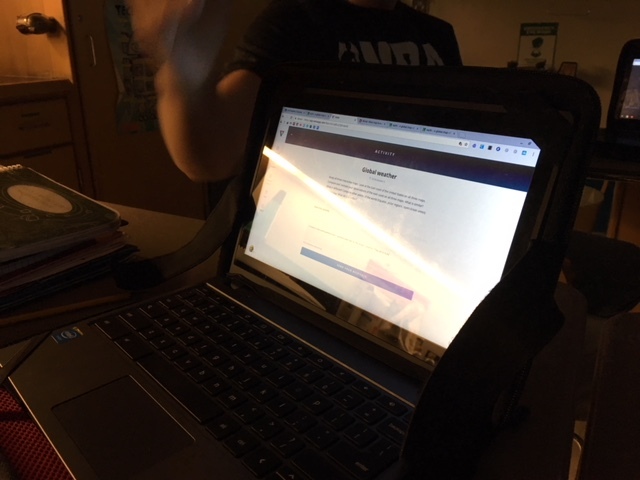 This definitely helped students, who may not want to “perform” and was an excellent use of the Chromebooks for students. 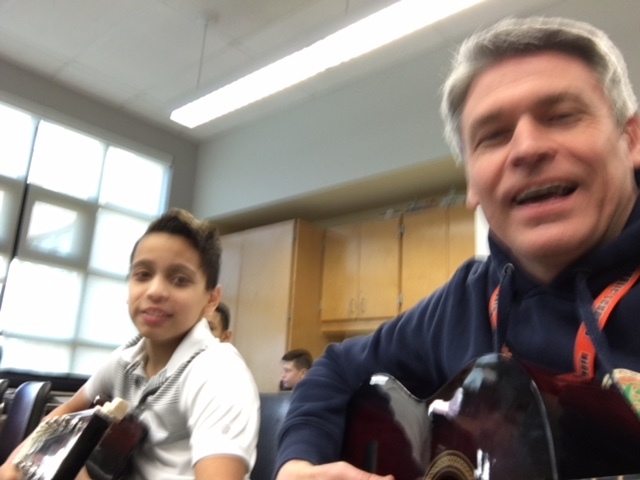 I, though, like Mike, grabbed a guitar and tried to follow along with the notes. 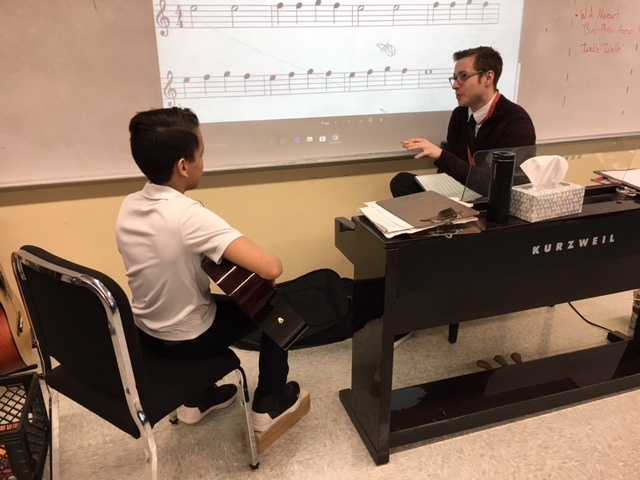 I am not the most musical person, but I do love music and do enjoy how Mr. Converse was making the playing of these notes very easy and simple after the practices we engaged in. Mike was very good and was strumming along to the song. 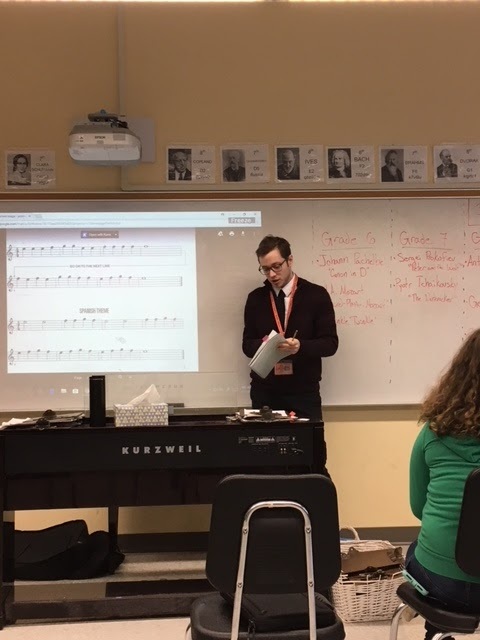 Mr. Converse then had a quick assessment of students coming up and playing the notes. 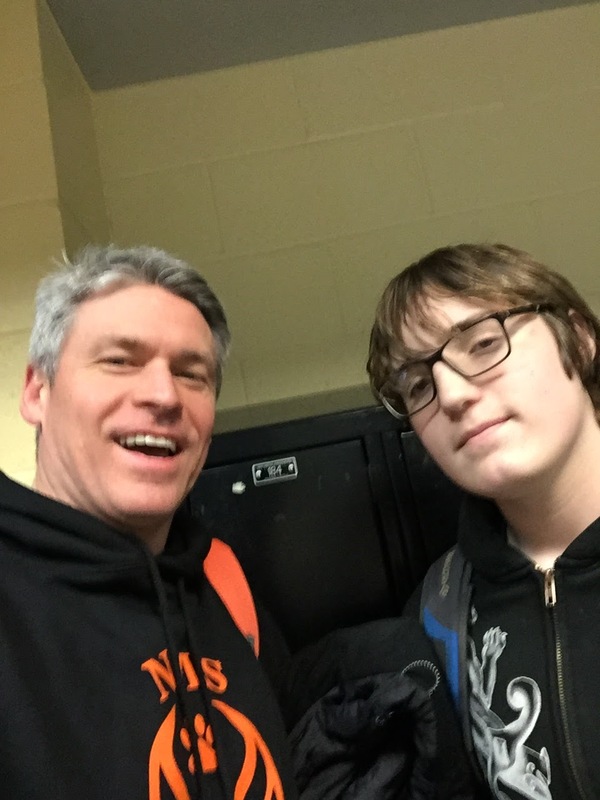 Mike did an excellent job for Mr. Converse as he gave instant feedback to Mike for him to continue to work on. It was a great, interactive lesson. 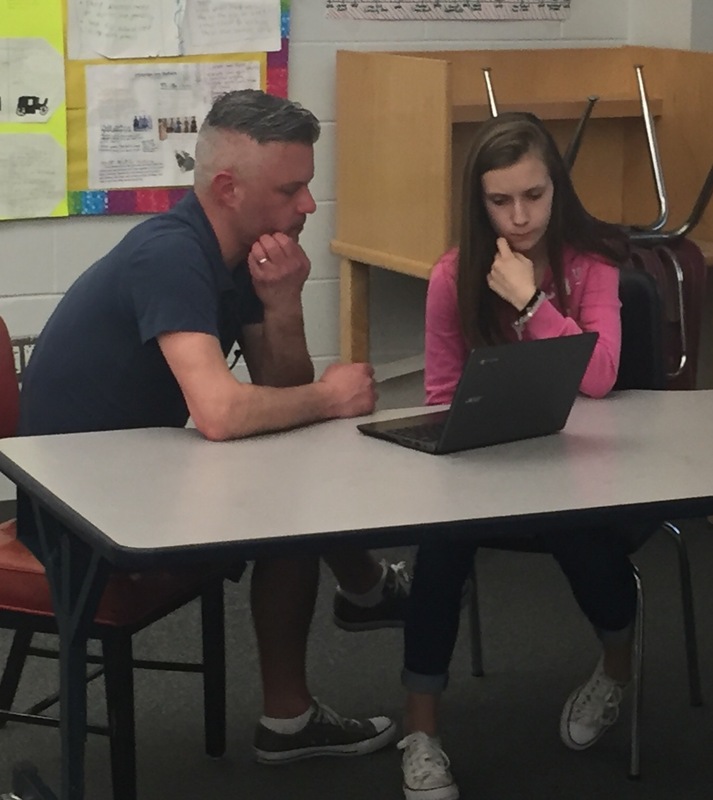 Mr. Converse was always there to reassure, support, and help each student to take a risk and try new things. 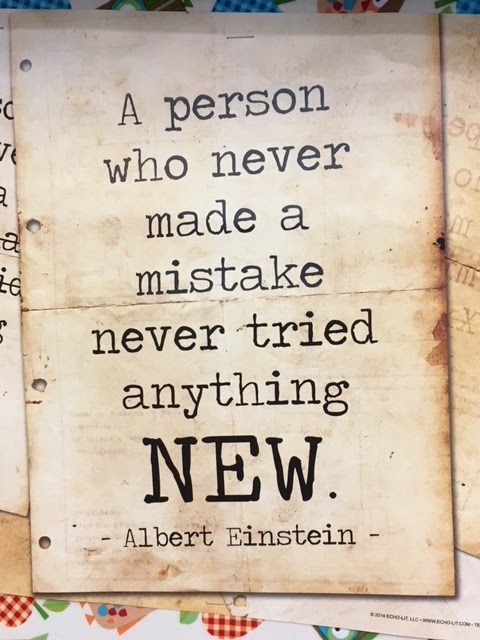 This is exactly what we want our middle school students to be able to do. 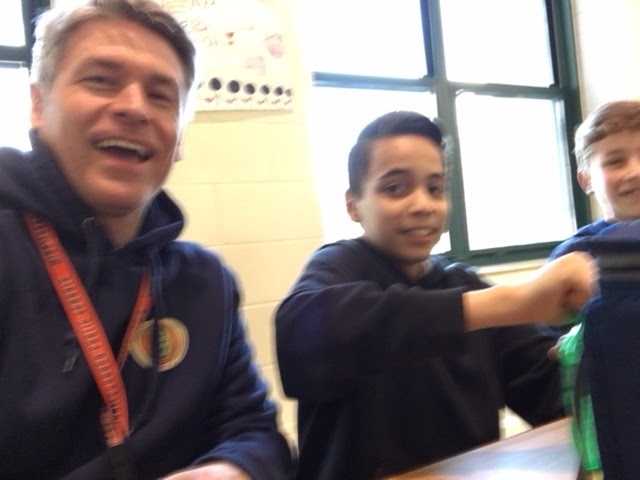 Our third block was Mike’s 8th Grade Social Studies class with Ms. Gowan-Chung. I can tell you that, just after two classes I was starting to get tired. 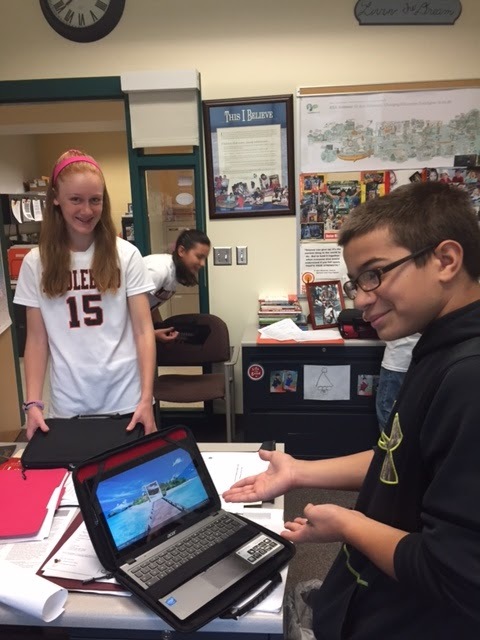 Preparing, presenting, and then watching and listening to presentations first block was very powerful. 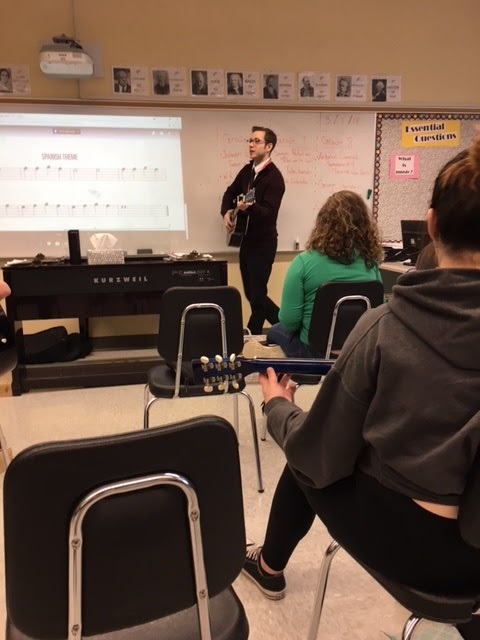 Then playing and learning the guitar second block was also a whirlwind. Now, third block in Social Studies was intense. 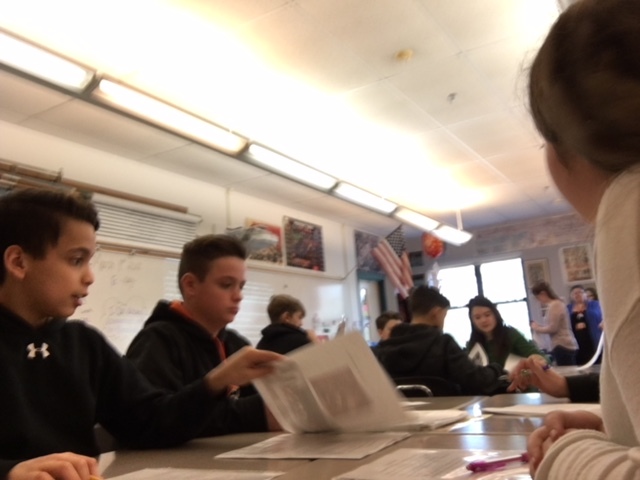 Ms. Gowan-Chung had the class doing stations. 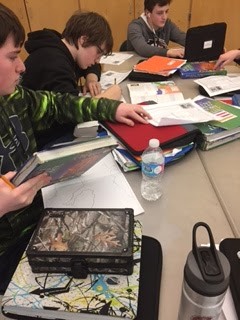 We talk all the time about how stations can be such an excellent learning activity, and today while being involved for the whole period I totally experienced why we say that. It was awesome. Each and every student was involved. Each and every student participated. Each and every student had a voice to share. It was incredible. 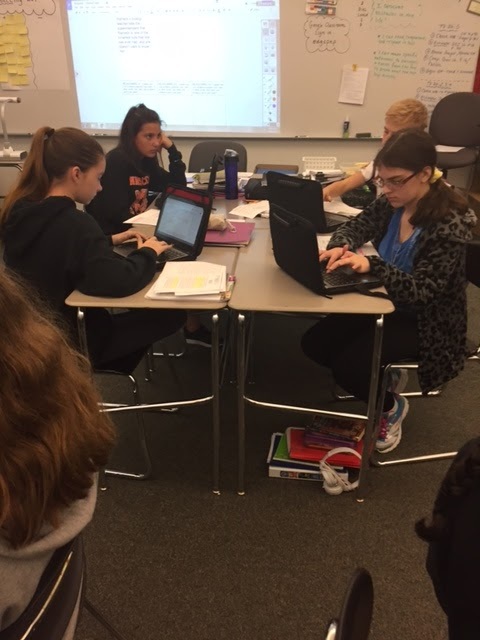 I was most impressed with how the students were engaged in the lesson. I Tweeted this out. 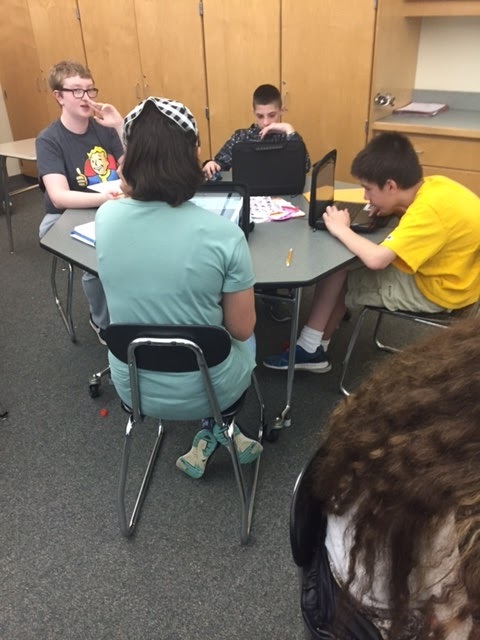 Students were having a role, playing a role, communicating, critically thinking, arguing, debating, problem-solving, collaborating, consensus building, and discussing. It was awesome. 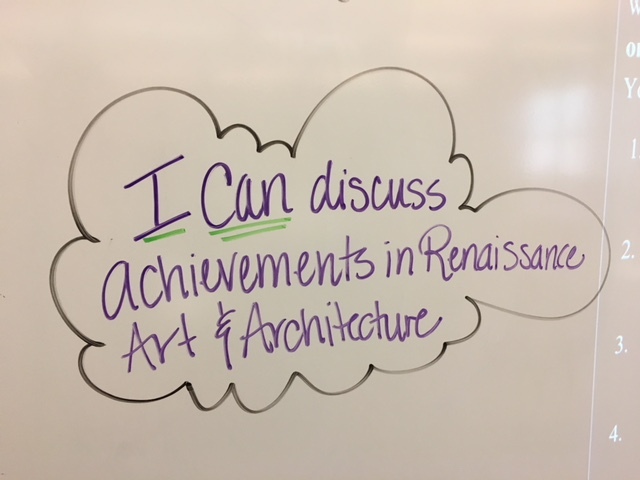 These are all the skills we want our students to know and be able to do, and we were doing in such a frenetic pace for we needed to get around to five stations. 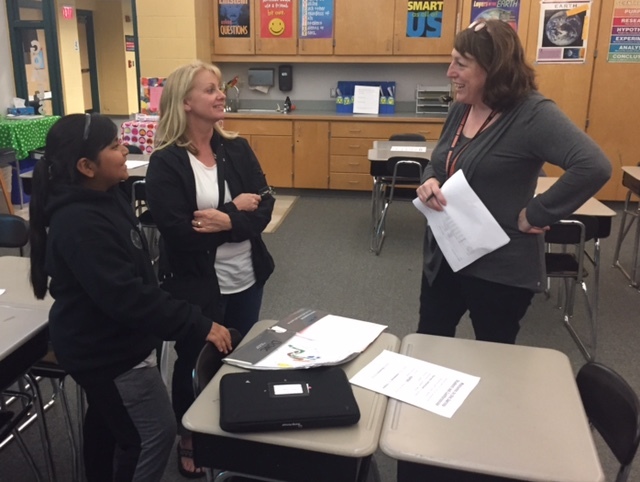 The discussions were awesome, and you could hear multiple times, “What do you think?” Ms. Gowan-Chung was there for support and to help, but this was student-centered learning. It was great. But, the period ended, and we still had work to do, so Ms. Gowan-Chung said there would be time the next time they met. But all I could think about was how next for Michael and me was lunch, and for me, I was starving. First lunch. 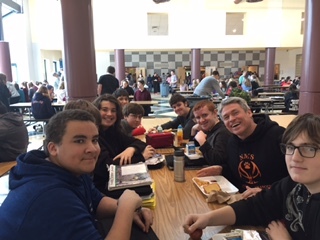 The conversations of the students during lunch were excellent. They enjoyed my being there, but they did not let it take away from their time to be with their friends. Our cafeteria has become something of a “dance party” this year with the added privileges for student positive behavior. 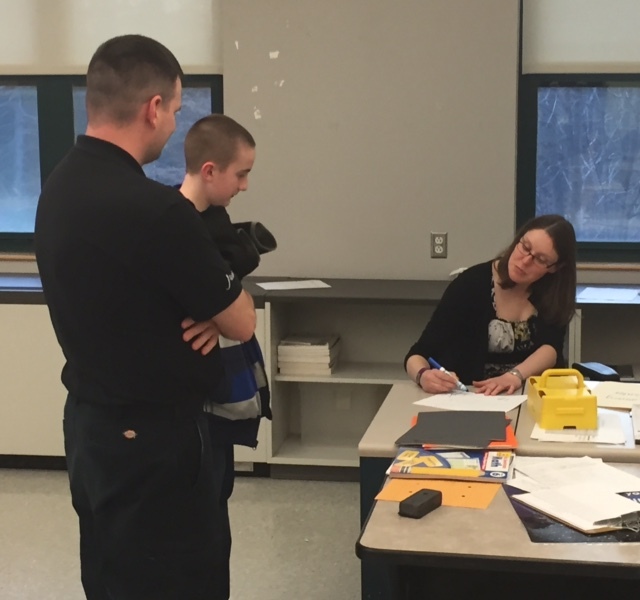 The 8th Grade students have been tremendous all year, so they keep getting privileges added. 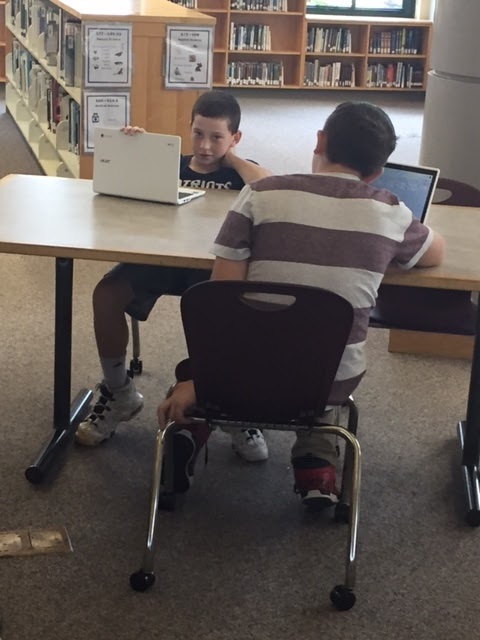 Students could sit, talk, listen to music, play on a device/phone, and definitely eat lunch. I was delighted in this “free” time with Mike and his friends as they could relax and take a break from the work of the day. I enjoyed the 30 minutes. 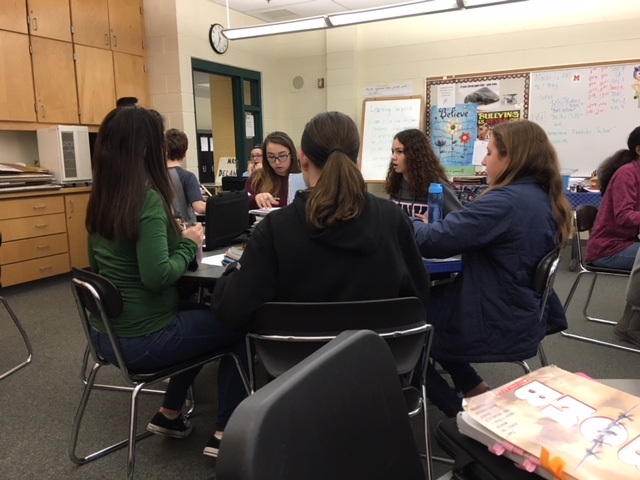 Post lunch, Block Four was DIAL with Ms. Delano. 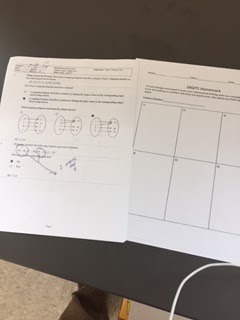 The way the 8th Grade Teachers have DIAL set up is exactly as how I have been trying to describe it to parents, visitors, and other administrators when we talk about our “Support/Intervention Time.” Students had the choice of where they “needed” to go. Some went to specific teachers for specific help or they went to a classroom for some enrichment of a subject. Or they might need just a quiet place to get something done. 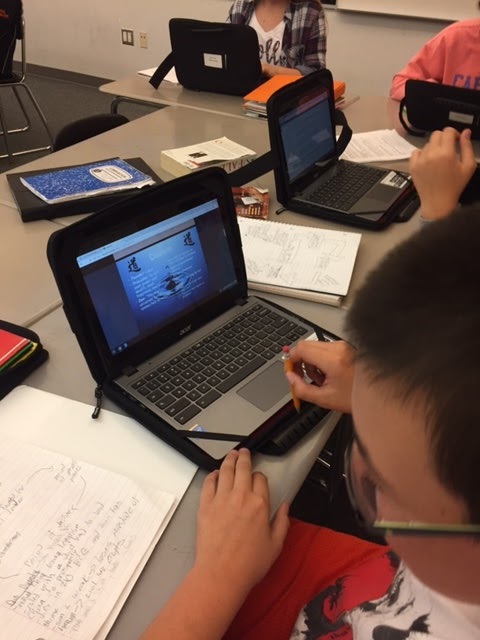 This is what DIAL was built for: more personalized, differentiated learning. 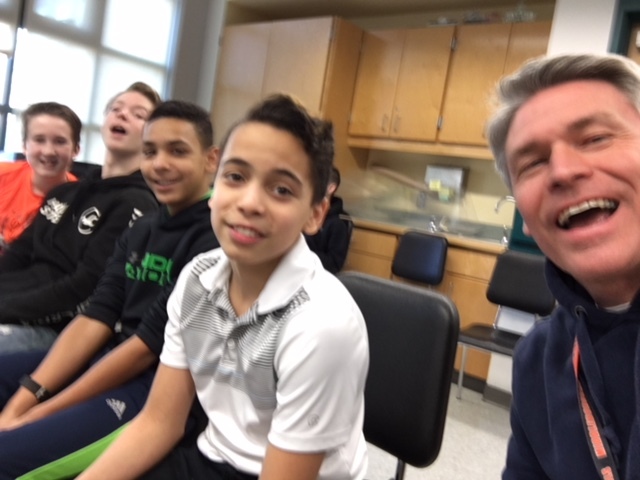 Michael and a few other students needed some general math support. They turned to each other or, since I was there, I could give them just that little bit of help. It was mainly some confidence-building for them to know that they were doing the math correctly. 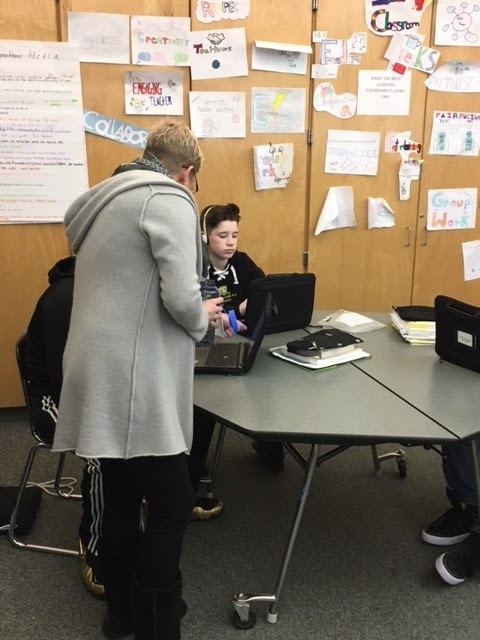 All the while, Ms. Delano kept walking around, checking in on students, and making sure they were OK with their learning. 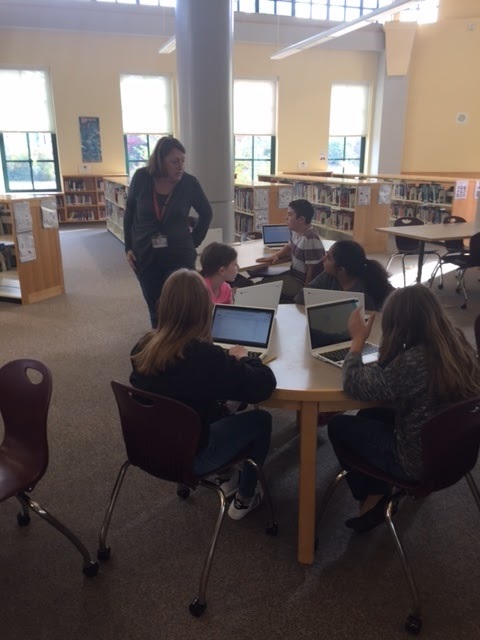 As I noted above, Ms. Macquarrie was there to help our students with their confidence. 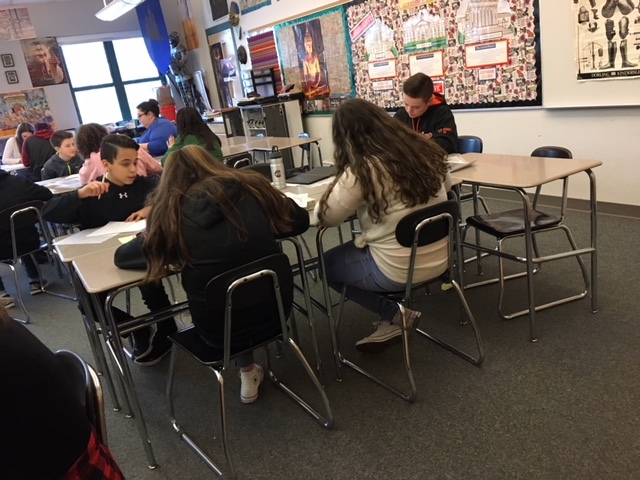 A lot of mathematical knowledge is being confident, and even though these students are in Algebra, they too needed that extra boost of “Yes, you can do it. You know this” more than a few times during the period. 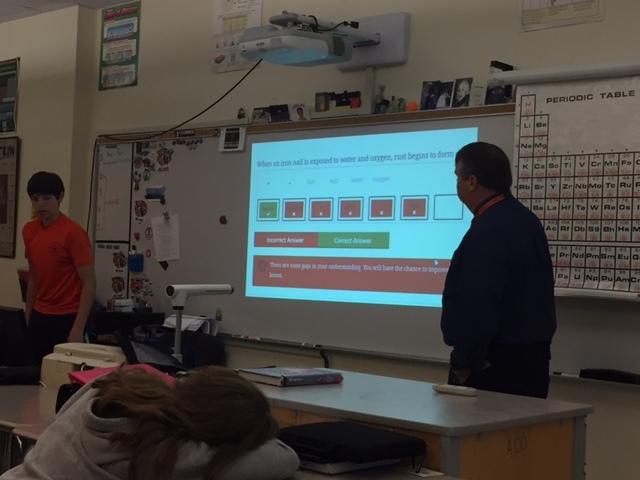 Our final class of the day was 8th Grade Science with Mr. Redpath. This was awesome. Mr. Redpath told me that we were starting a new unit on this day, and it was weather. Oh, how relevant to what was going on in our world. 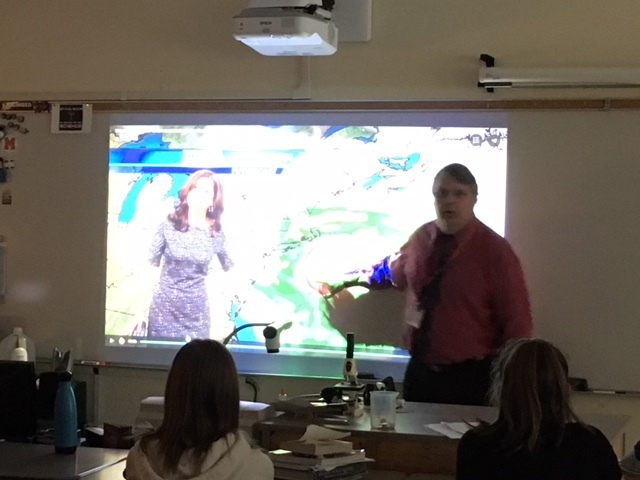 Mr. Redpath had us going into our Google Classroom to view our assignment and he also introduced everything by pulling up a video from Channel 5’s Cindy Fitzgibbons, the meteorologist. 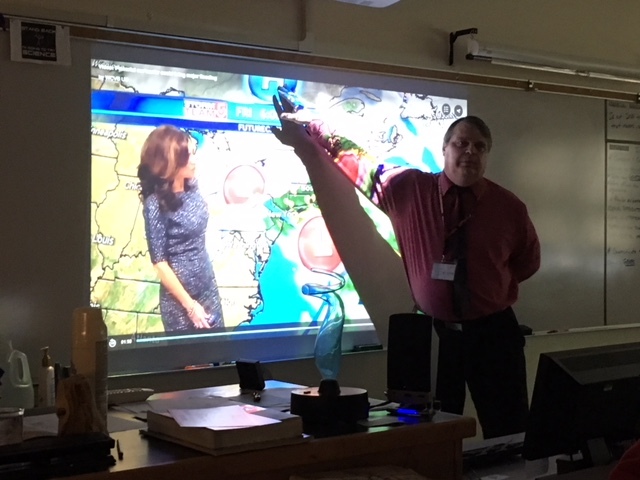 It was so great to be able to understand what Mr. Redpath was teaching us to what Cindy was telling us what was about to happen in Massachusetts on Friday afternoon/evening. 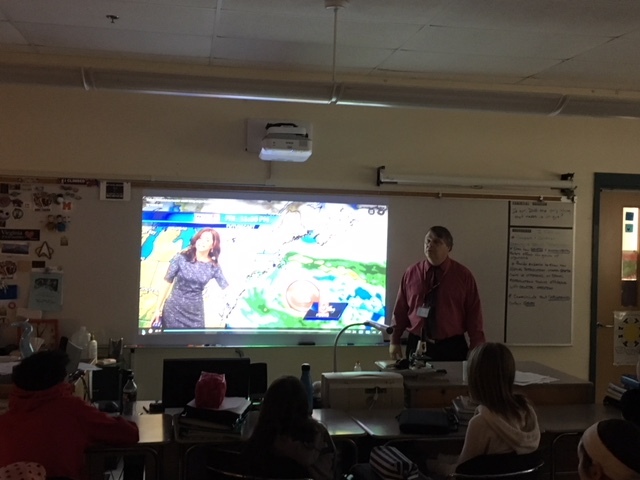 Mr. Redpath then had us between two different online programs checking out weather patterns to try to understand and predict what we were seeing from what we had just learned from Mr. Redpath and Meteorologist Fitzgibbons. 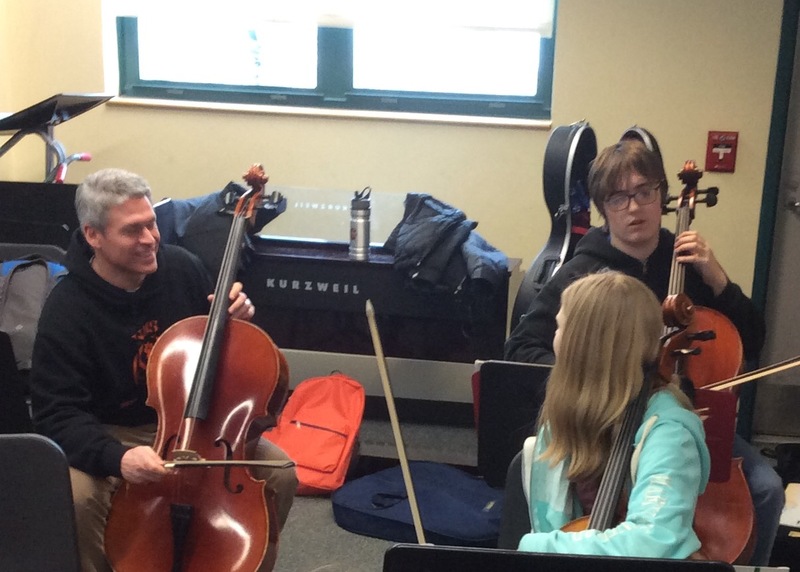 Relevance to students’ learning is such a big piece to whether they will want to learn it. 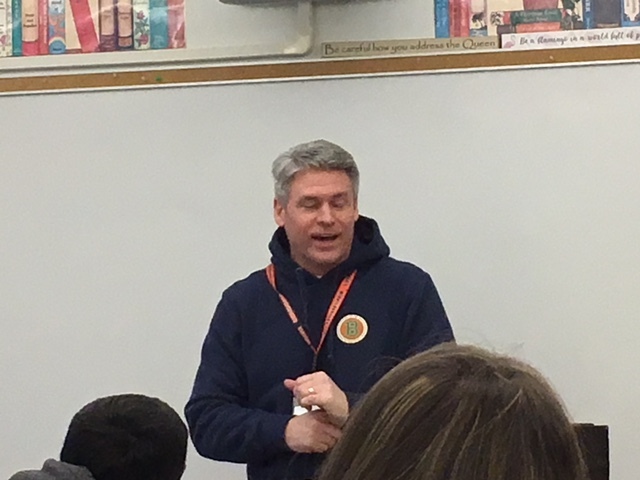 Just think about how many times students say or ask, “Why do we need to learn this?” Mr. Redpath was showing and then the students were excited to try to figure it out themselves. This was so awesome and impressive to see and experience. My biggest take-away from the day was from all the classes taken in unison. I am always so impressed with how our teachers have been trying to make sure they have a relationship with their students. This was clearly evident from the second I stepped off the bus. 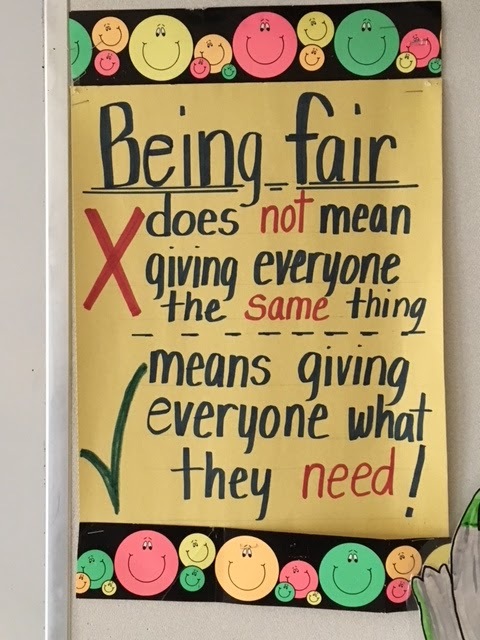 Every adult is here for our students, and one can see this. 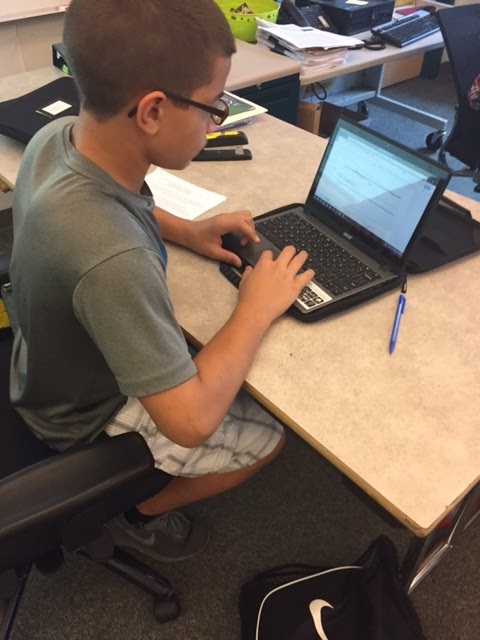 A student’s day at NMS is filled with voice and choice. 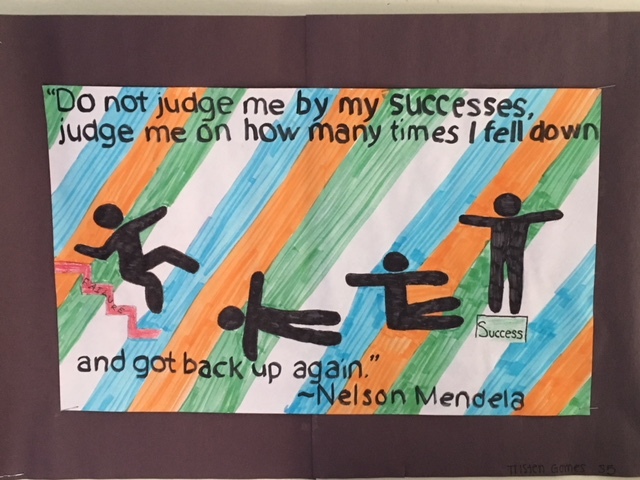 Our NMS teachers are continually trying to let our students pick and display how they want their learning to be shown. 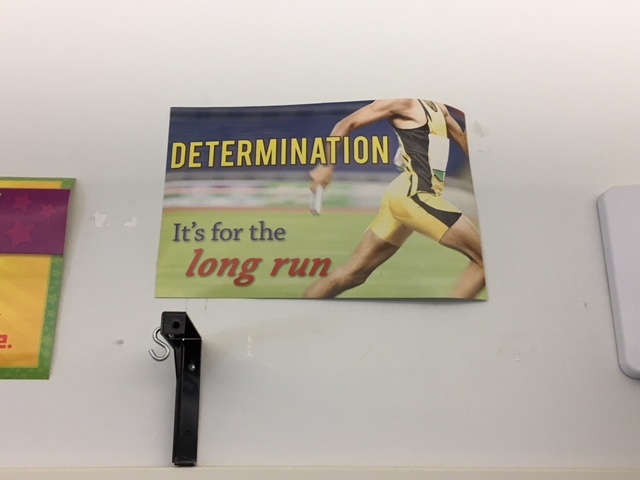 I saw this in Ms. Flaherty’s project, Mr. Converse’s activity choices, and what one wants to do in DIAL. 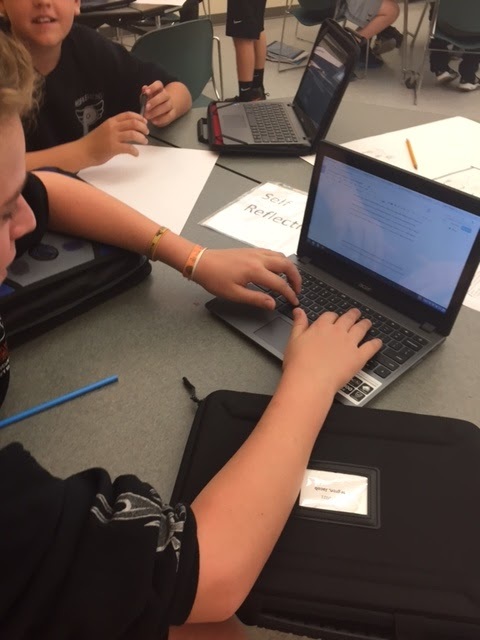 We continually try to make sure our students are engaged in the 4 C’s of 21st Century Learning, or otherwise called “Super Skills” of Communication, Collaboration, Critical Thinking, and Creativity. One could see this in all the periods but this day I could see it most in Ms. Gowan-Chung’s. 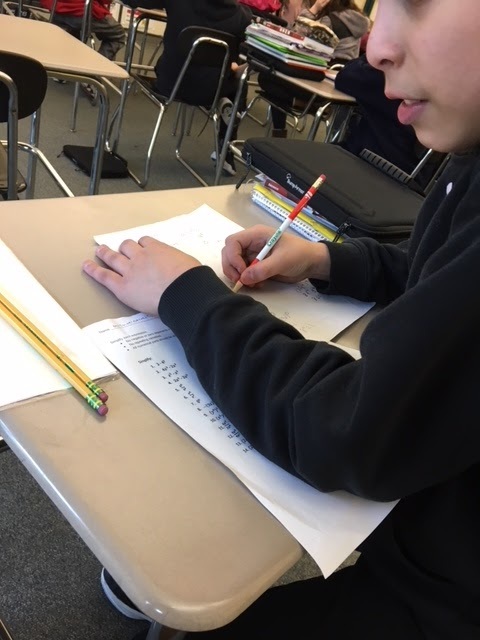 Then there was our students figuring out the learning and being at the center of their own learning; this was most evident in Ms. Delano’s DIAL and Ms. Macquarrie’s Algebra class. 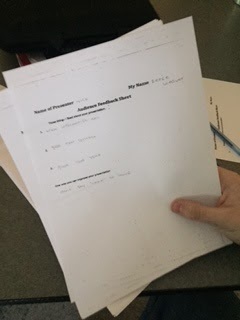 Students were figuring things out themselves and asking each other for support. 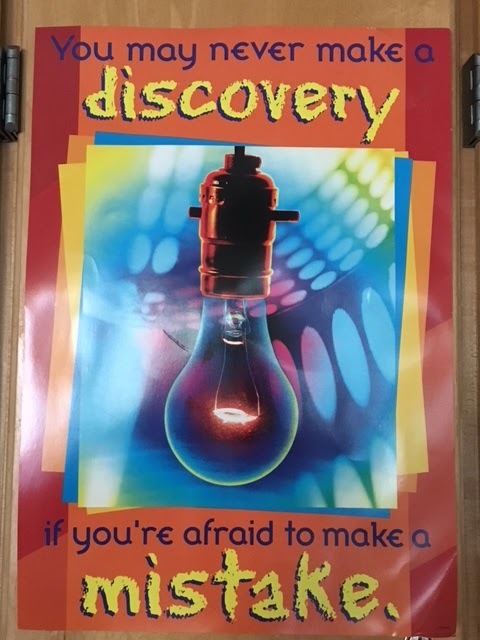 And then there’s relevance to the learning, and this was certainly evident in Mr. Redpath’s Science class. 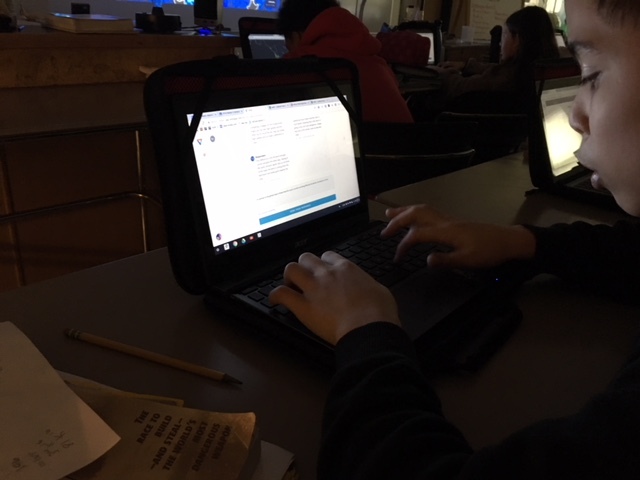 We talk all the time about how do we get our students engaged in their own learning, and in this class, students dove in because they wanted to learn more. 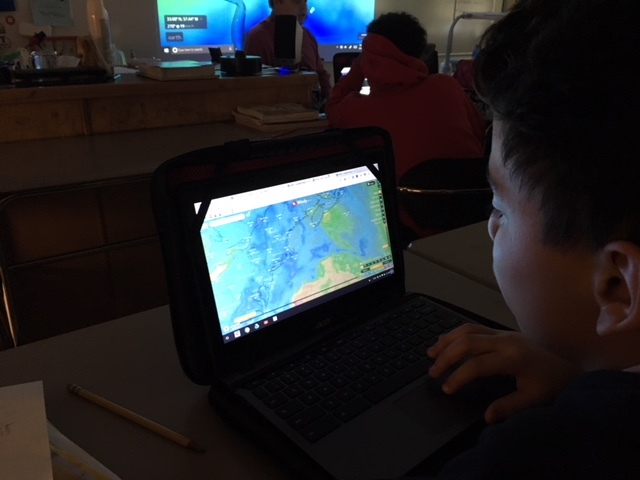 They were empowered to want to figure out the weather for themselves. 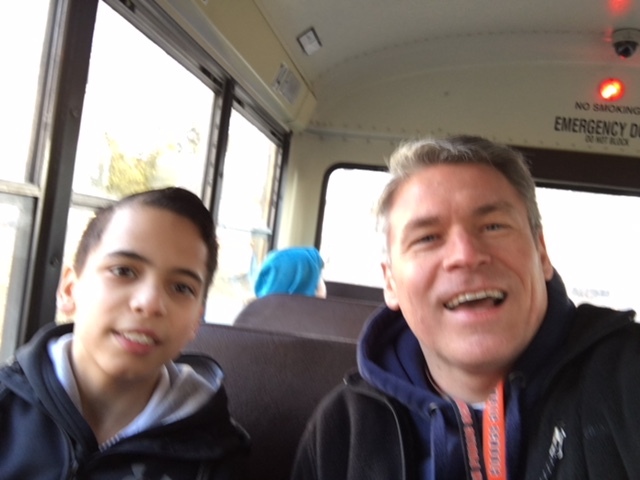 Mike and my day was done, and I headed home with him on the bus ride. 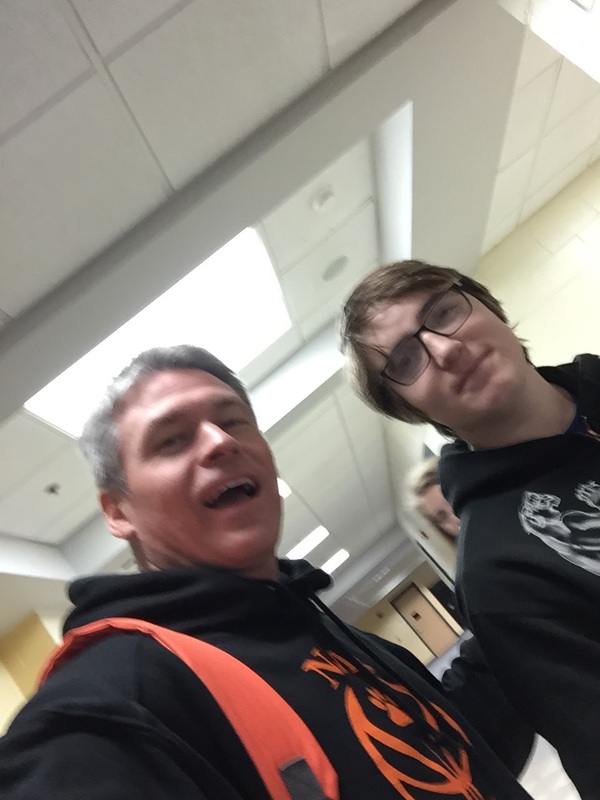 I, of course, took some more selfies with him. Thank you, Mike; you were awesome throughout, especially with my incessant selfies. 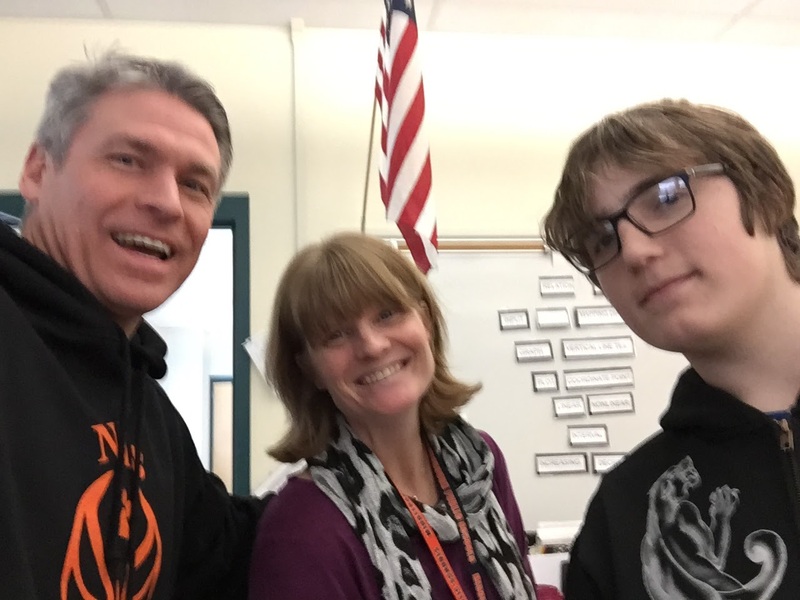 Ms. Rae and Mr. Thomas are going to #ShadowAStudent in grades 7 and 6 in the next few weeks. I will post their reflections and will ReTweet their experiences as they have theirs as well. What an awesome experience. I am looking forward to next year’s already. 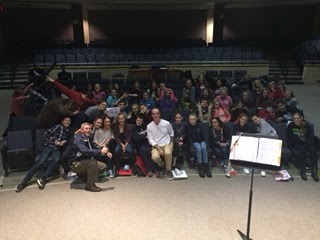 Love our Nichols Middle School; what an awesome experience! 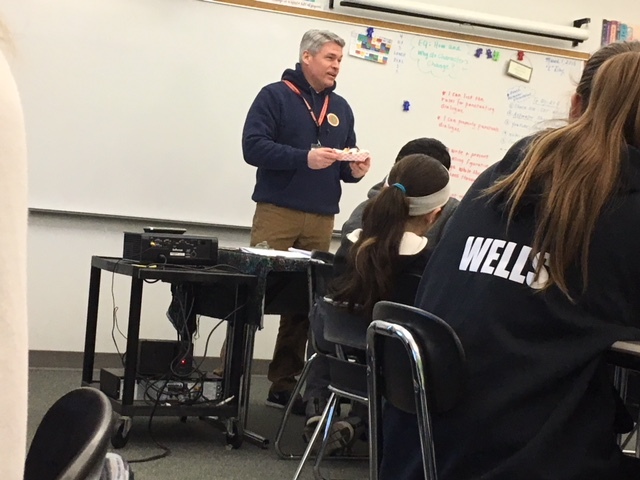 As I walk through classrooms around the building each day, every once in a while I get caught up “reading the walls.” This strategy was something I, and probably every other Massachusetts administrator has been taught to do from the Research for Better Teaching Administrators’ course “Observing and Analyzing Teaching” (RBT’s OAT, as we would call it). 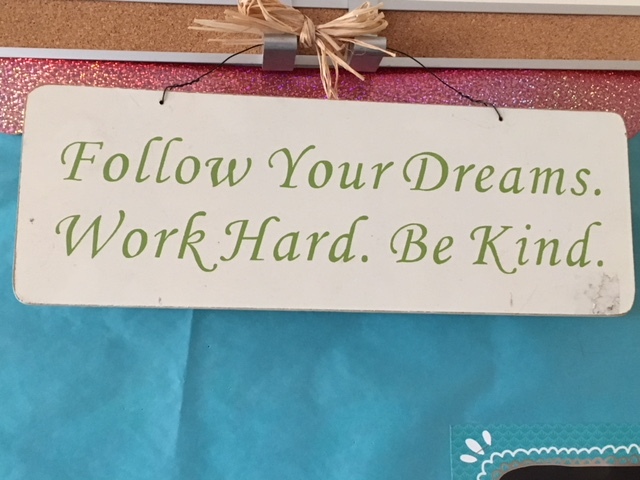 The messages within our classrooms tell our students what we expect of them; what we want for them; and what we hope they think about us, our classrooms, and our school. 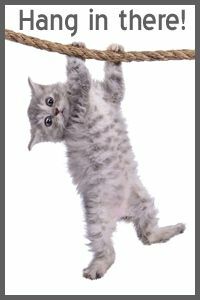 Sometimes the messages are as simple as “Hang in There” with that iconic kitty hanging on a string. 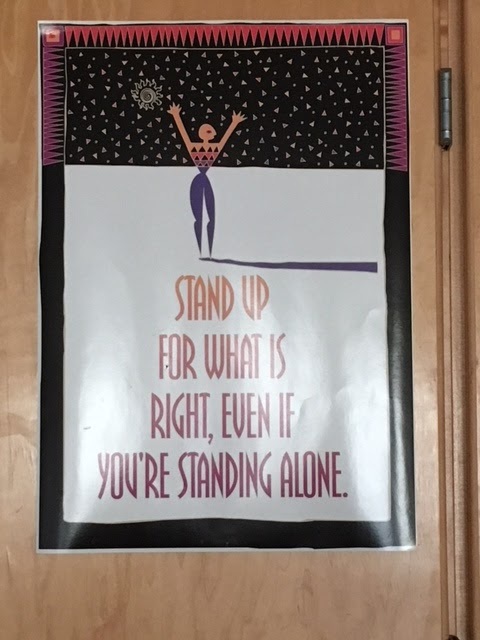 But then there are more posters that say so much about what we believe, what we care about, and what we want to instill in our students. 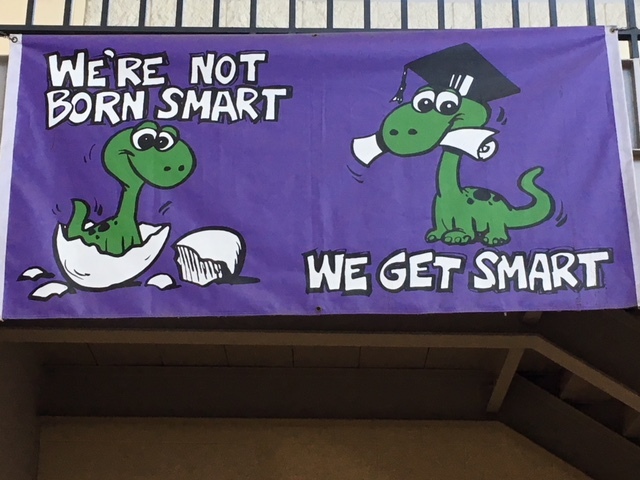 We discuss Growth Mindset, Effort Over Talent, and how Education Can Be the Key to Their Success. 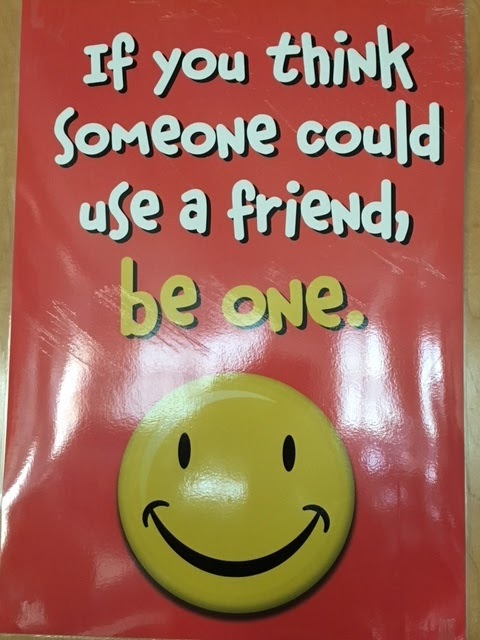 Small little sayings and cute, catchy pictures can have a huge impact on making a school culture and climate something positive for all of our students. 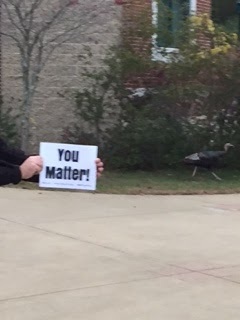 Please check out some of the messages we are trying to communicate to our students from the walls of NMS. 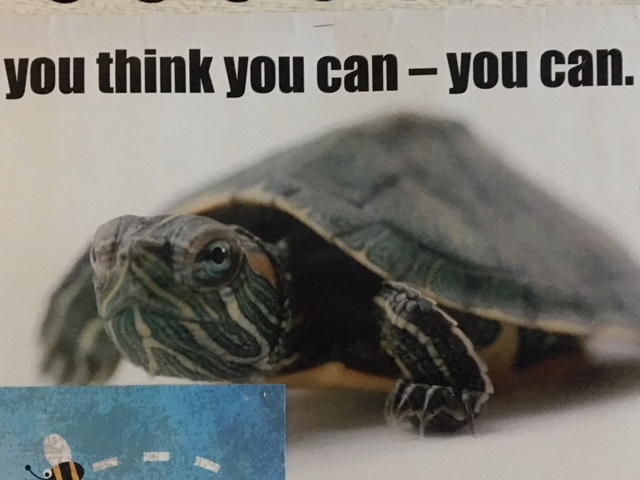 I think they are pretty strong, positive messages. 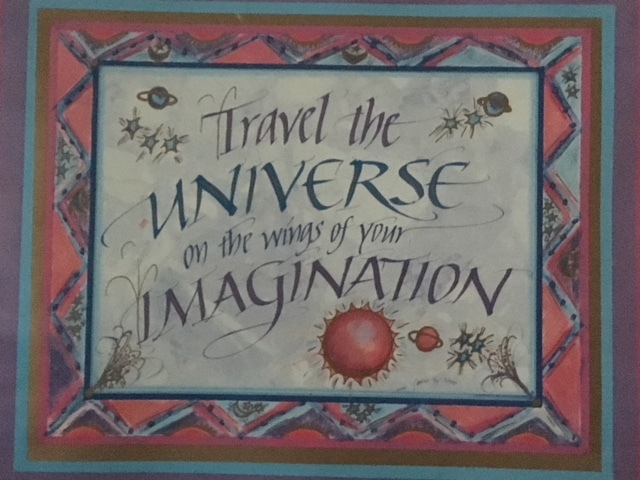 As we head into March, these messages should hopefully carry us to some positive results. 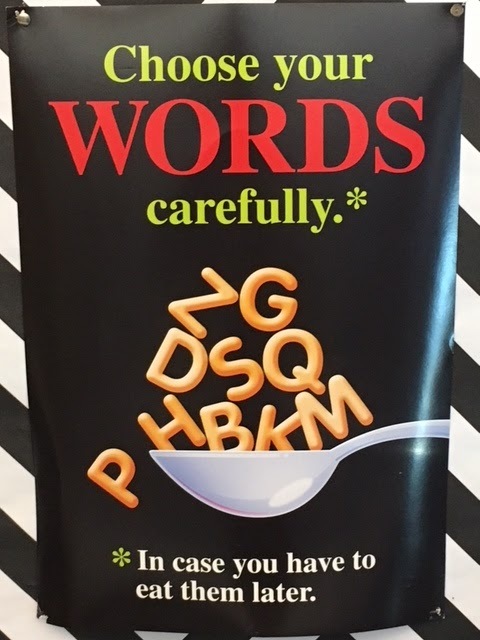 We want to speak to our students through everything we say and do, as well as what we have posted around them each day. I always love how during our #1st3Days of School our teachers choose to stress building relationships with their students and making sure they want to come back each and every day after that initial one. 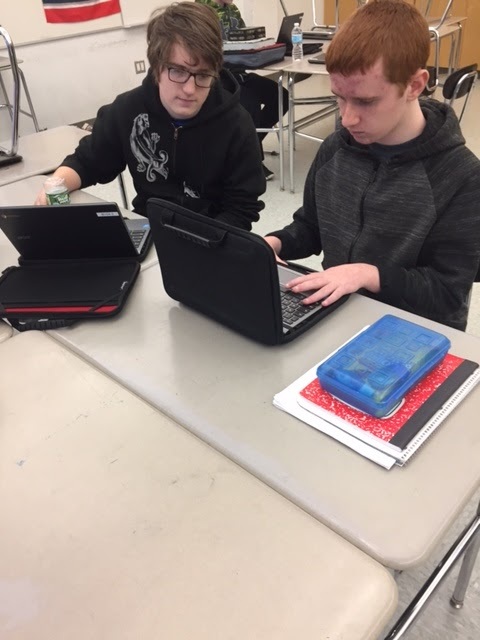 We have continued to build upon the amazing support our 1:1 Chromebook initiative has been to the learning going on in our building. 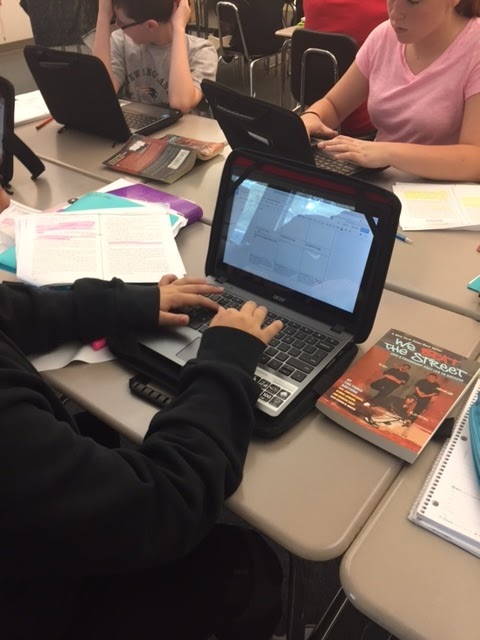 To see our teachers, staff, and students attack their learning through this educational tool is outstanding. 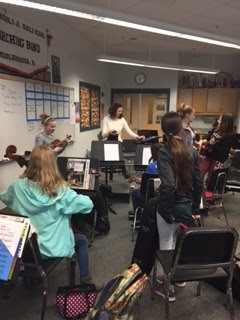 As one of my favorite highlights for me has been seeing our 6th Graders come in and fall right into the routine of being middle schoolers. They always seem to “get it” so much quicker than I can ever imagine. Our Fall sports participation in soccer for both Boys and Girls has been such a success for our students. Also amazing is our massive group of students running Cross Country for it has become a staple for our students during those first few months of school. 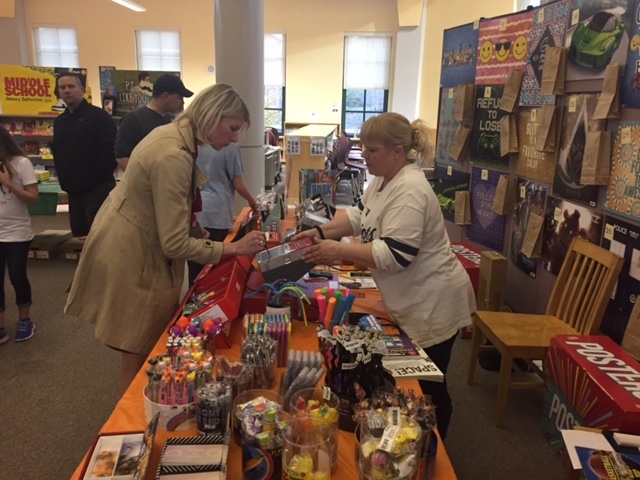 Our Fall Frenzy for 2017 was another huge success. 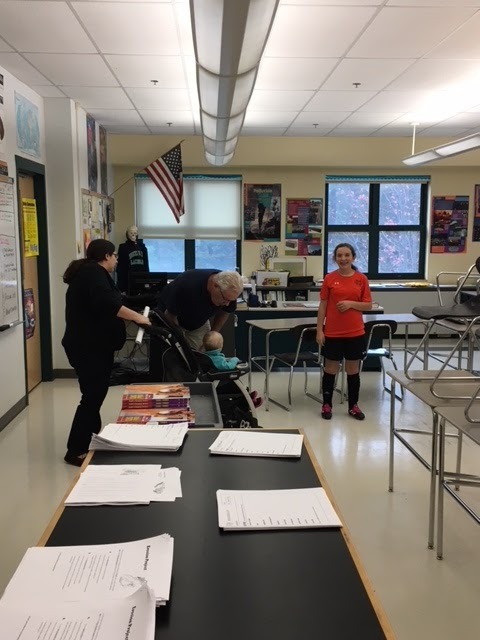 The NMS PTA and the MHS Student Council volunteers make this afternoon such a special event for students in all three grades. It is such a fun, wonderful experience to see and have. 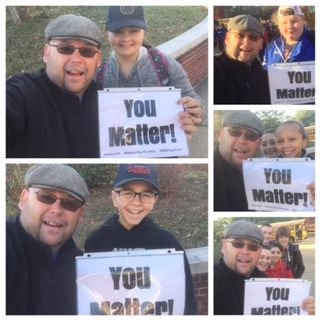 This Fall, we brought in with the support of our NMS PTA, a motivational, powerful speaker in Mr. Randy Pierce. His message of having a vision and seeing it through resonated incredibly with all of our students. It will be something I hope they always will remember and try to achieve. “Cinderella,” our fall/winter musical, showed such immense talent of our students. It was awesome. To see our students get on stage sing, dance, act, and all it takes to know one’s part and lines is incredible. 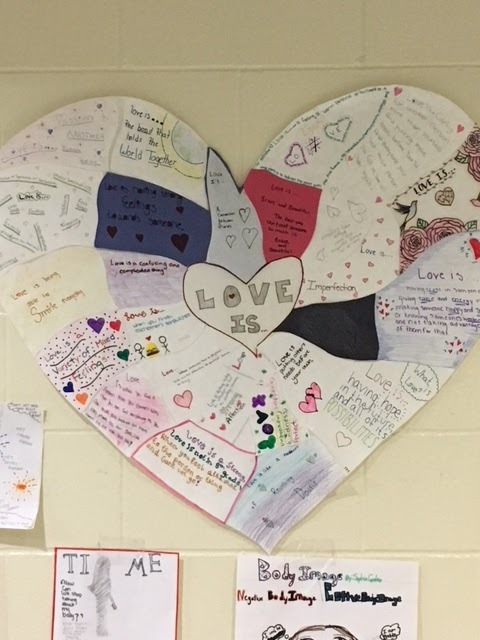 All of the NMS Student Council fundraisers for charities throughout the year display our students’ persistent want to help our community and make sure we give back as much as Middleborough gives to us. 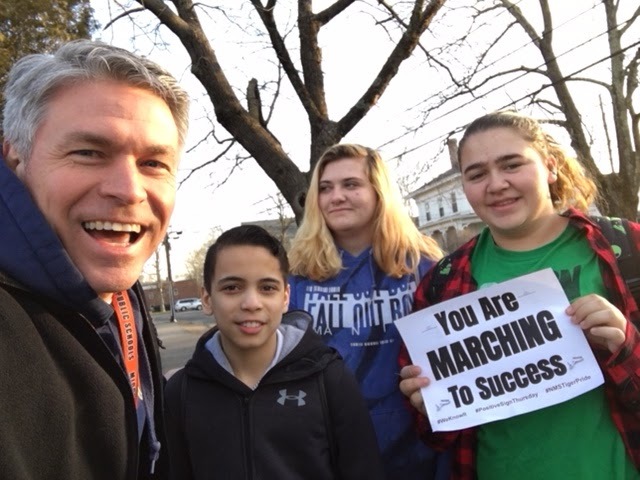 And, again, probably one of my favorites from the start of this year has been our greeting our students with #PositiveSignThursdays. Our First Friday Spirit Days with our grade level T-shirts with our school-wide TIGERS culture-building initiative is also another favorite for me. 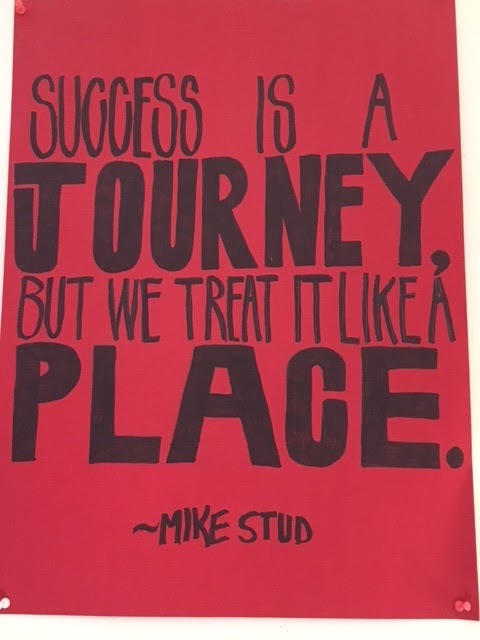 In the grand scheme of things, these really aren’t many “reflections” other than it has been a tremendous beginning to the school year; we remain steady in working hard to make NMS the best it can be; and we will be relentless in making sure we continue in this direction. Have a wonderful, restful, and joyous holidays from everyone here at NMS; see you on Tuesday, January 2, 2018 (Yup, it’s going to be 2018 already). 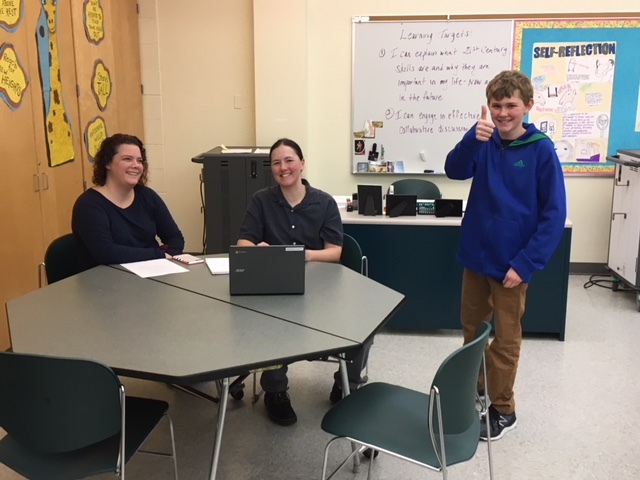 On Wednesday, November 1, afternoon/early evening from 4 to 6:30 PM we had a stream of parents and students entering and exiting all three floors of the Nichols Middle School. I can wholeheartedly say that it was a successful evening of conferences. 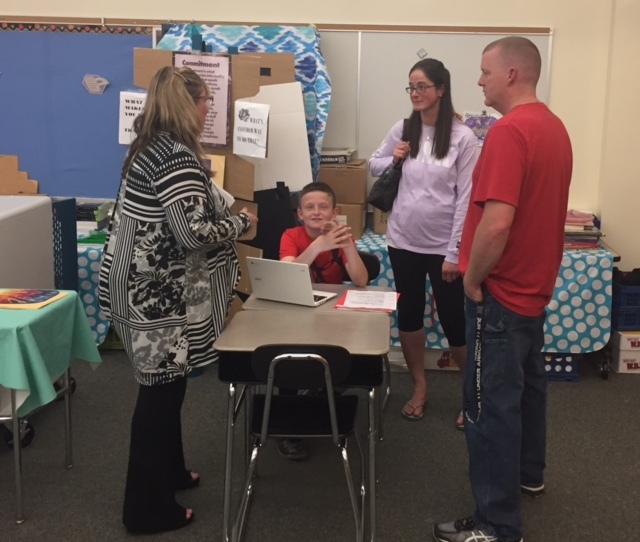 There were students talking with their parents about their learning. 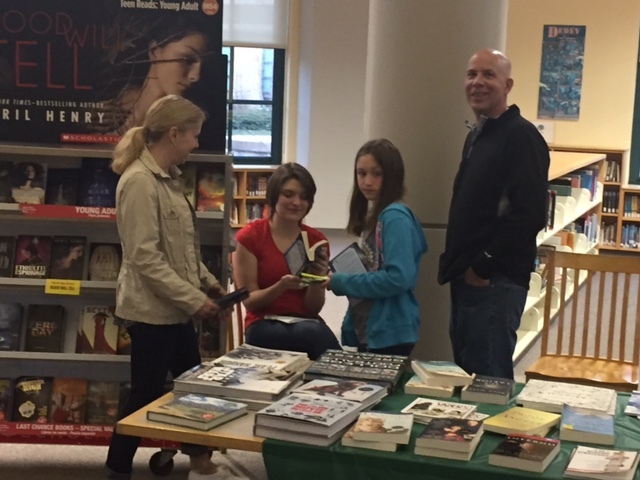 There were parents talking with teachers as their son or daughter listened and added insight. 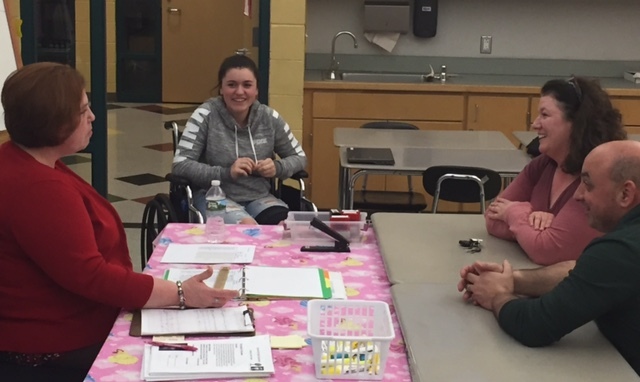 This is how Parent-Teacher Conferences should be. 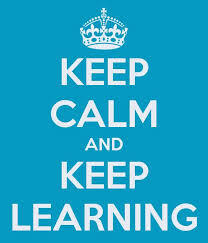 I heard many a student explain to their parent how they were doing, what they working on, and how they might improve. I heard many a parent ask their child, so what would you do differently? This is what conferences should be. 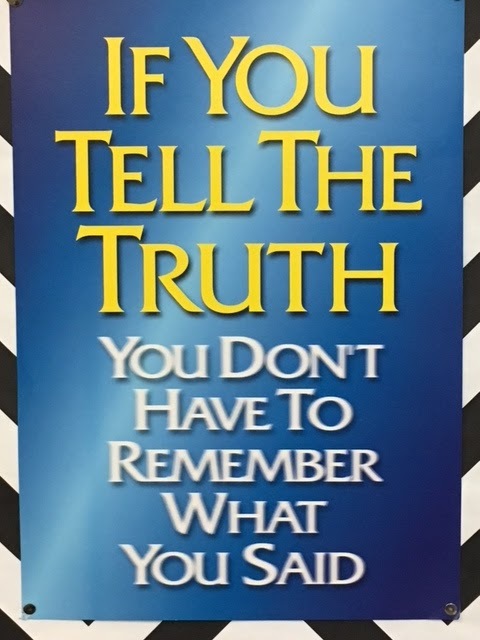 It should not be a “Telephone Game” where the teacher tells the parent how the student is doing, then the parent goes home and asks the child to explain, to then hear the child tell a different story. This is not productive. 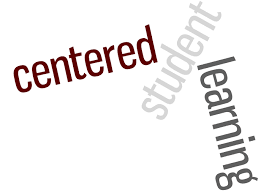 The student needs to be at the center of their learning, and Student-Led Conferencing helps achieve this. This is what we are attempting to do with every initiative we have done here at the Nichols for the past six years. 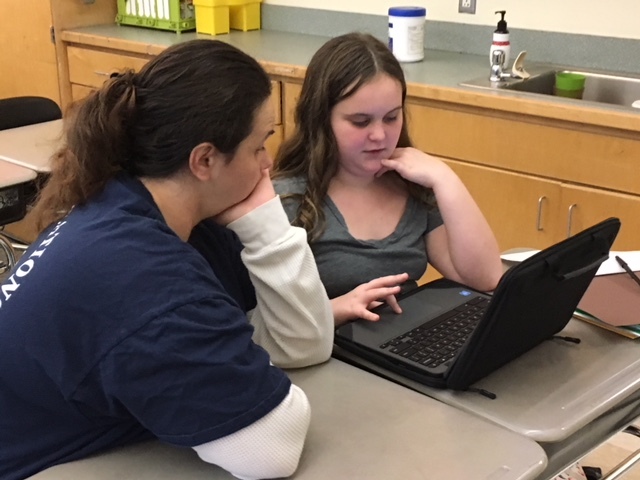 Whether it is utilizing technology in the form of going 1 to 1 with Chromebooks, having a culminating project in 8th Grade ELA2, or designing Student-Led Conferences, we want our students to be at the center. These nights are so powerful and give me a chance to see how we are moving in the right direction. I just wanted to let you know how great our conference experience was this year. 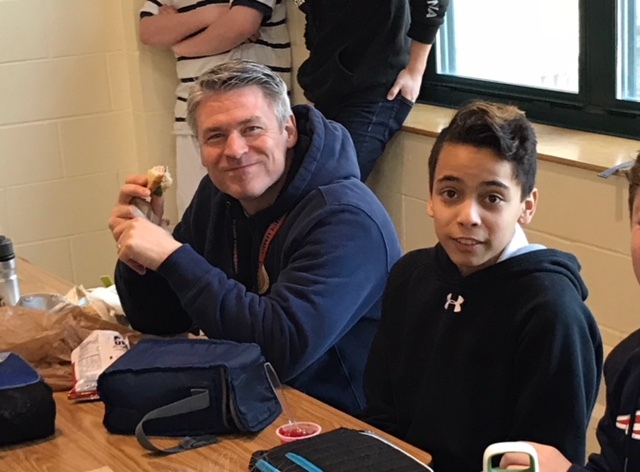 My son is in 6th grade and had some trouble with school in previous years so as you can imagine I was worried about how he would do moving to a new school and having to be more independent, but he is loving Middle School. 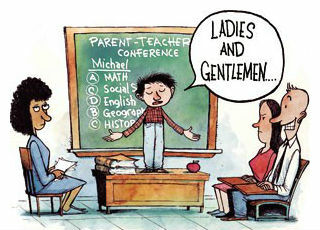 At past conferences we had a short amount of time with the teacher and we would learn things that came as a surprise to us, but it was tough not having our son there to discuss it with him in front of the teacher and it wasn’t very productive, and to be honest I always dreaded them. 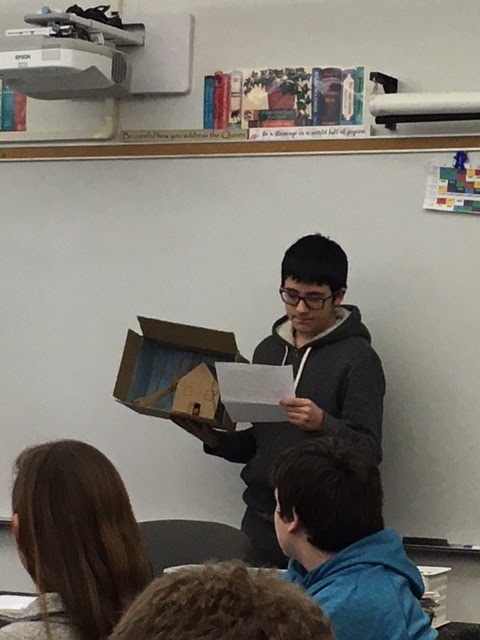 This year my son took us on an hour and a half tour of each classroom, he went through a typical day and presented to us how he felt he was doing and had an example for each category to explain why he felt he deserved the score he gave himself. In all honesty I was blown away. I have never seen my son so engaged in school and his progress. 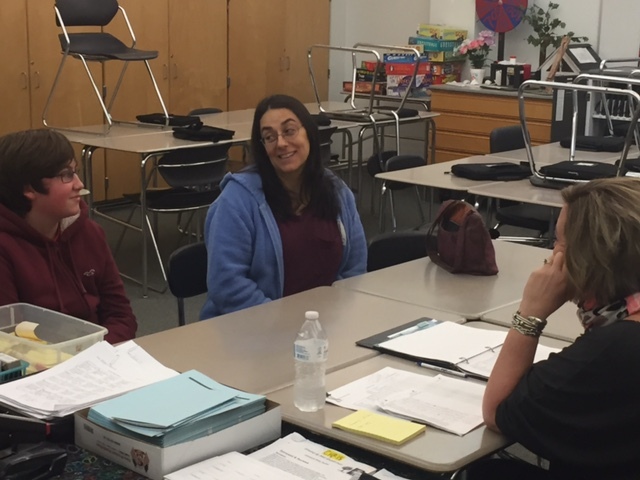 Each teacher was available in the classroom if we had questions and they all made it a point to come over, check in and give us an update. 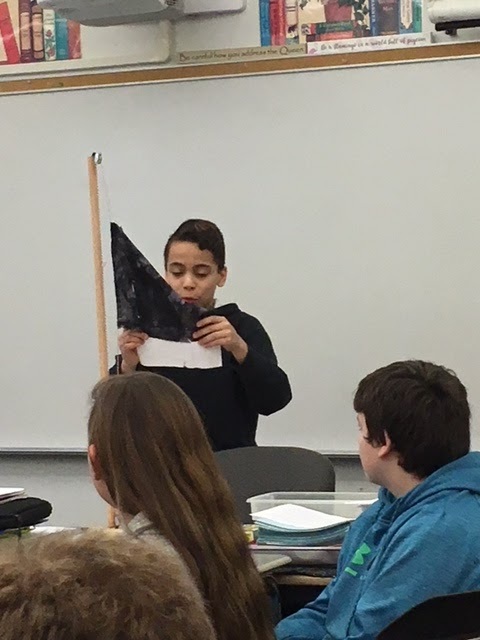 This was a much more enjoyable experience and gave me great insight into how my son is doing, it showed me how invested he is and I think it’s a great skill for the kids to learn to present in front of a group. 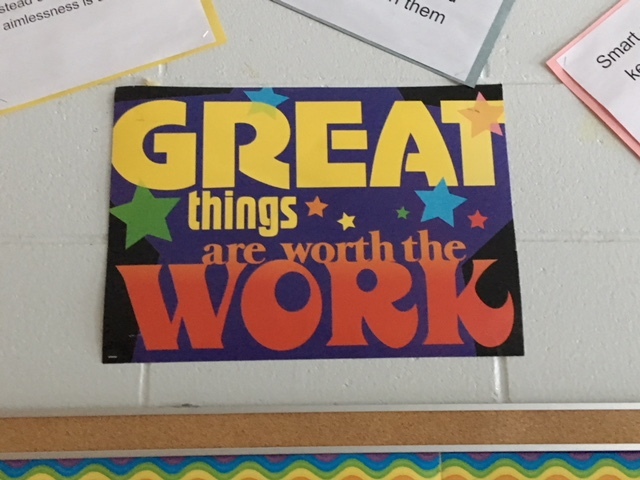 So from a new 6th grade parent who was worried and skeptical about the change, GREAT JOB and thank you for making school fun again for our kids! In Twitter, there are times when someone will write something and you think that is exactly what I wanted to say, so you write, “BAM.” Well, this is a definite “BAM” moment. Yes; this is exactly what we hope to gain with each initiative. Check out more of the pictures from the night. Power. The power is in our hands. That’s right; it is. I know, if you know me, you have a pretty good idea about what this post is going to center on. It is on Twitter. Most of you know the story. I and many others got onto Twitter from Bill Burkhead’s encouragement, as Brian McCann so classically puts it in our “Alchemy” presentation for many of us were there in the standing room only setting, lining the walls, and sitting on the floor in Race Point at the Sea Crest that 2012 Summer Institute. 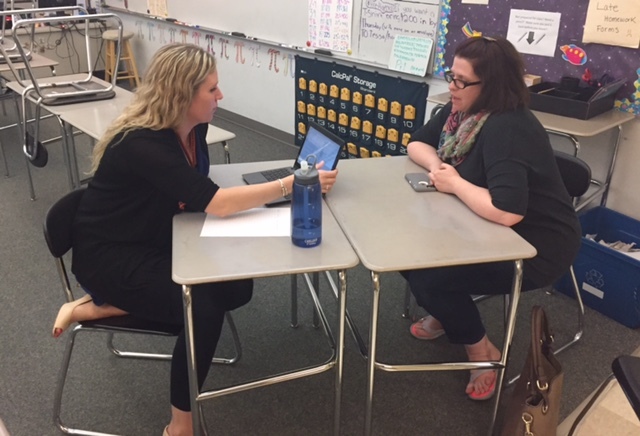 It was an incredible presentation on such a powerful tool for learning, leading, and connecting. Bill explained to us that Twitter harnesses the power we can use whenever we want. It’s there. He emphasized that you don’t have to watch it. You don’t have to worry about missing something because you might not be there at a certain time. It will be there for you when you log onto it. Well, needless to say, I loved it. I jumped right in with both feet. 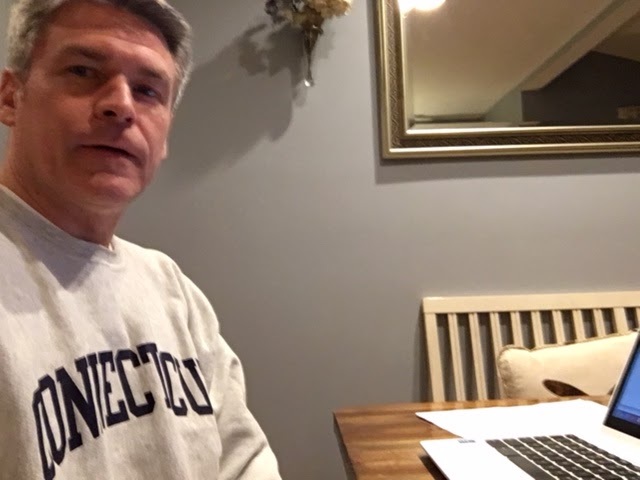 It was amazing to see the connections Bill and others around our state like Pat Larkin were making. It was phenomenal. One could not help but be enamored by the power Twitter held. 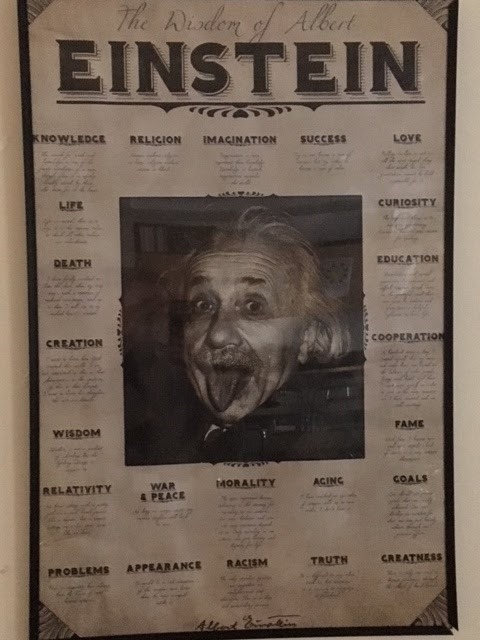 Art Dulong years ago started to refer to me as the “Twitter Man.” There would be the obligatory “Tweet that out, Marty” during every meeting or meet-up in Franklin. I presented multiple times at the Summer Institute and in Franklin an introductory exposition of Twitter’s power. I tried to carry forth what Bill did for me and others. I wanted to spread that word. I saw its power in so many ways. 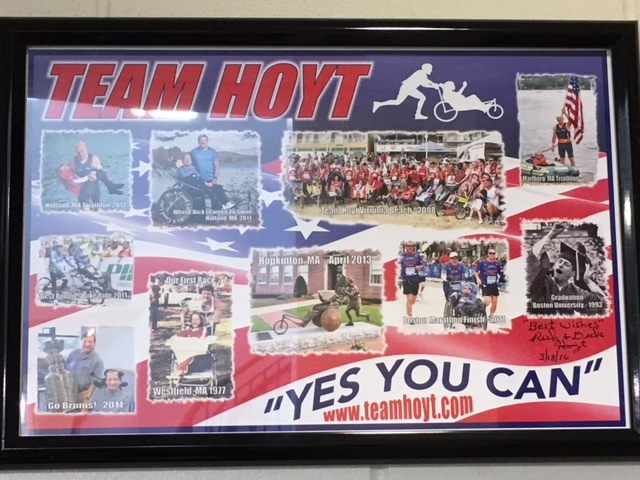 Whenever we go to committee meetings, regional meetings, conferences, or even just see each other out somewhere it gives me a tremendous lift. I can’t help but love these sometimes few minutes I might have with the likes of Brian McCann, John Clements, Tara Bennett, or George Ferro. But those few minutes are difficult sometimes to come by in the busy life of an administrator. For when you get a chance to tap into any one or our ideas, thoughts, or brains, you are amazed. 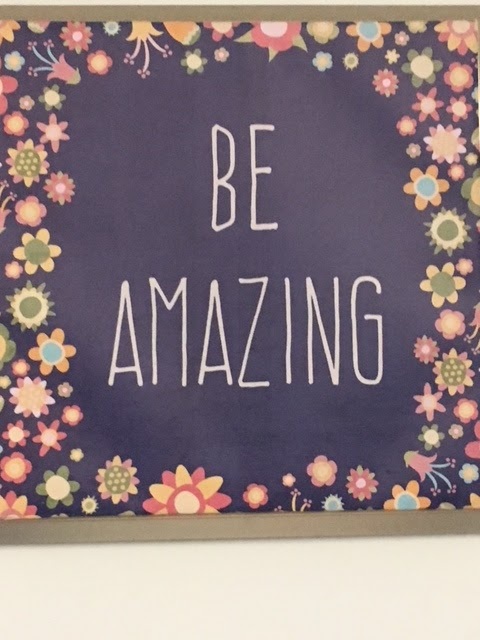 There are some sensational things going on in our schools. It is then that you realize why Massachusetts always scores so well on national and international tests: it’s the state’s leadership. It is the principals, assistant principals, and directors. We are doing some remarkable things. So I wanted to try to capture this. I saw Twitter as a way to do so when I Followed such incredible people, but I wanted more. 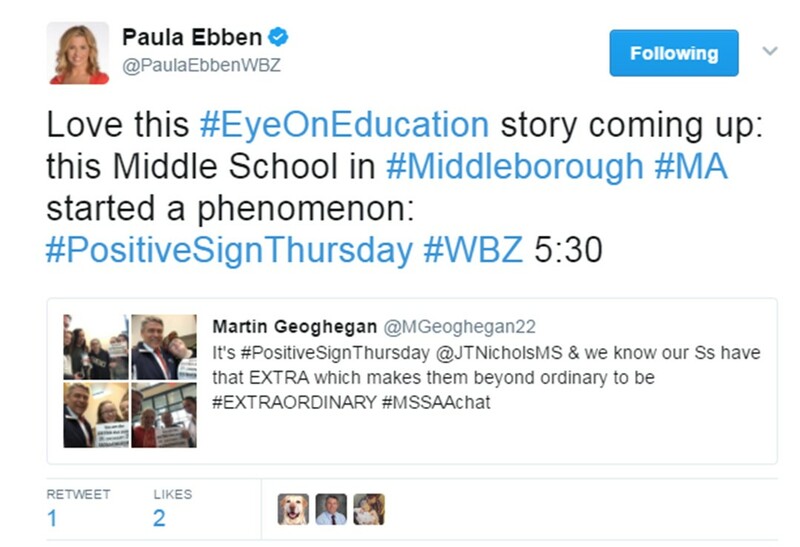 Then a few years ago, I started #MSSAAchat (now #MSAAchat) because after engaging in multiple Twitter chats I saw the enormous power it had. This took Twitter 1.0 to 2.0+; it was truly sensational learning. 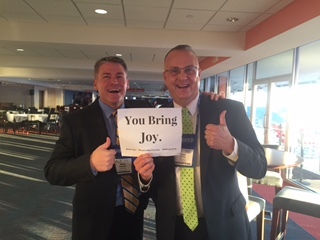 In my mind, I saw #MSSAAchat as an extension of Summer Institute conversations by means of virtually meeting up with all those Rock Star leaders we have in our commonwealth. #MSSAAchat started to break down those barriers of time and space. It didn’t matter if you were across the state, out west, down by Worcester, or up in the northwest corner; we could meet on Twitter in this chat. You didn’t have to just go to a conference, or Franklin, or the Summer Institute to tap into these incredible educational minds. This was that power Al Gore first discussed when he created the World Wide Web. It was there for us to utilize. 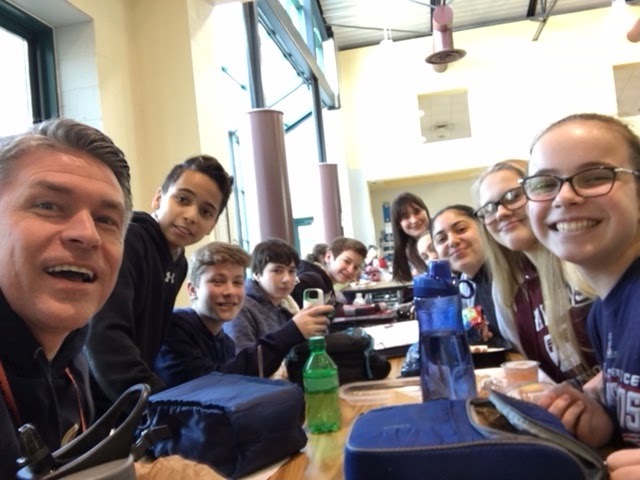 #MSSAAchat got the likes of Bob Silveira, Henry Turner, Kathleen Duff, Kelley St Coeur, Jeff Szymaniak, Ross Thibault, and other Case High alum to get together and support one another and each other’s schools. It was also where I was able to branch out with other leaders as well. It didn’t matter what level you were an administrator. The elementary leadership in the state is awesome as well. Do you know where I first met most of them? Through Twitter. Julie Vincentsen, Liz Garden, and Chris Dodge I initially got acquainted with on Twitter. 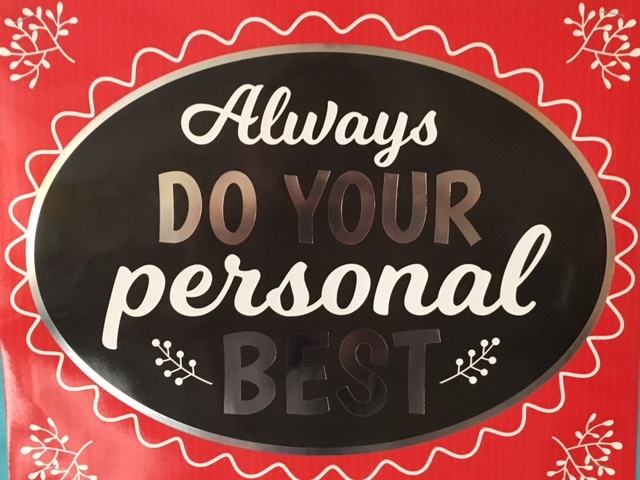 The conversations in #MSSAAchat (and now in #MSAAchat) were spectacular, but again, I wanted more. So I used Twitter to connect with authors of educational books. All I did was tweet, direct message, or email these authors to see if they would be interested in talking for an hour with Massachusetts leaders. And I have yet to have one say, No. Those are not all of them. Those are just a few. Check out the Storify of all our #MSAAchats to see some incredible educational discussions. It is a treasure trove of awesome authors, ideas, and discussions between these phenomenal writers of books and incredible educators, who are authors of their own amazing ideas in less than 140 characters. And the lineup of sensational educators continues every second Tuesday of each month with this coming November 14, we have an unimaginable night of learning. We have John Spencer and A.J. Juliani at 8 PM to discuss their book Empower: What Happens When Students Own Their Learning. It is going to be epic. And not to be done, but then in December, I have lined up Trevor Muir, author of The Epic Classroom: How to Boost Engagement, Make Learning Memorable, and Transform Lives and in January, Chris Dodge was able to get Jennifer Casa-Todd, author of Social LEADia: Moving Students from Digital Citizenship to Digital Leadership, and in February, Beth Houf, author of Lead Like a PIRATE: Make School Amazing for Your Students and Staff will be co-hosting #MSAAchat. We are stronger together, and #MSAAchat gives us a platform to show our power and passion we have for making our schools better. I can’t help but thank Mr. Bill Burkhead for leading me into the awesomeness that is Twitter. See you on Twitter, my friends. 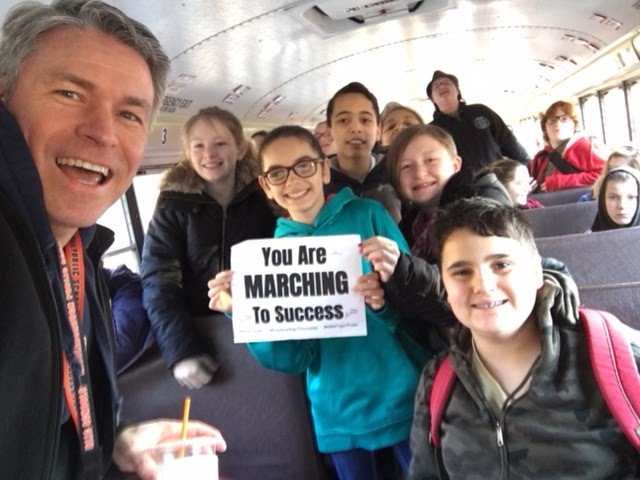 Martin R. Geoghegan is the Principal of the John T. Nichols, Jr. Middle School in Middleborough, Massachusetts. 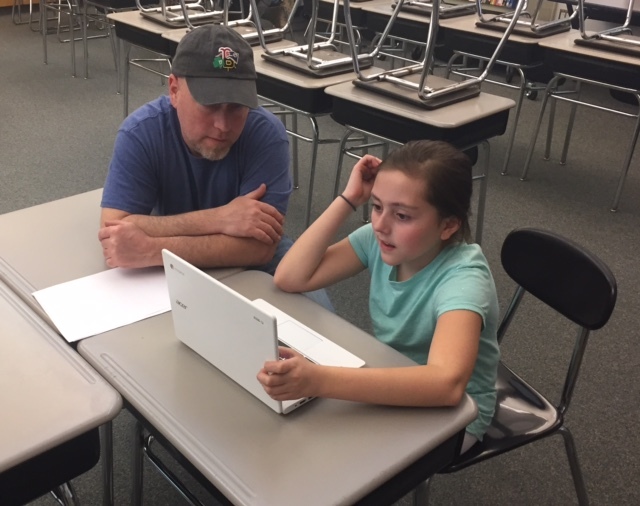 Since Marty started at the Nichols, it has gone from little technology to a 1-to-1 Chromebook environment, where he’s always searching for ways for greater student success. 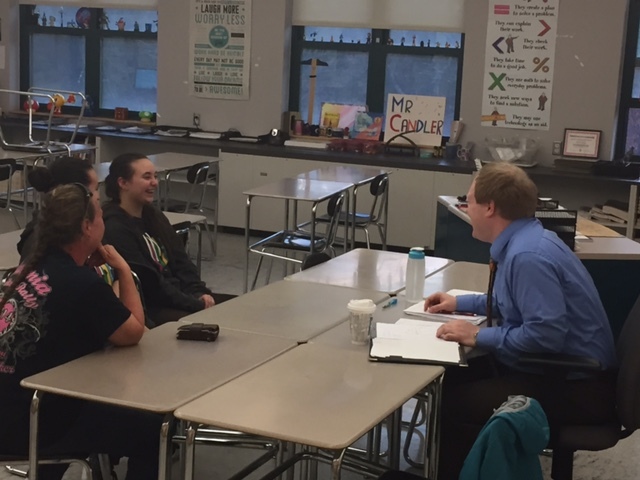 He is currently the Middle Level Chair on the MSSAA Board and the President of the Massachusetts ASCD Board of Directors. He founded and moderates the #MSAAchat on the second Tuesday of each month for all educators. 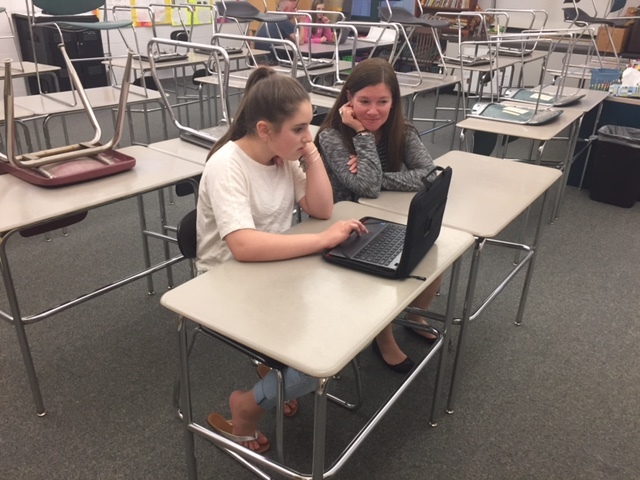 Last year, the Nichols Middle School was chosen as one of 35 Model Schools from across the country to present at their national conference in Nashville. 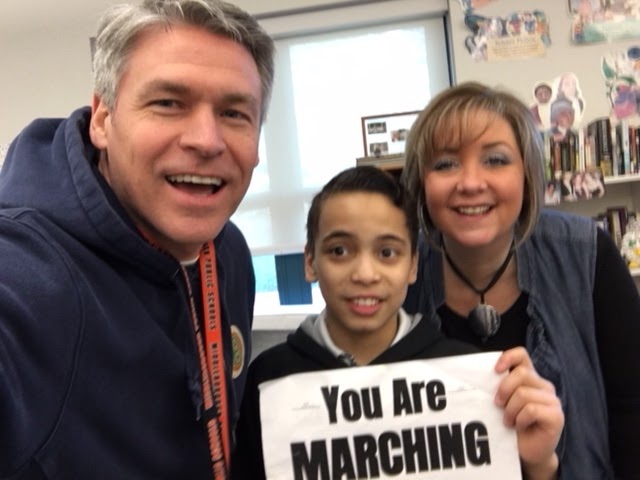 Marty was a MassCUE Pathfinder Award winner for 2016, and a Featured Speaker at MassCUE 2017. He tries to make as much time as possible for his wife and two high school sons in Scituate, when he’s not Tweeting at @MGeoghegan22. 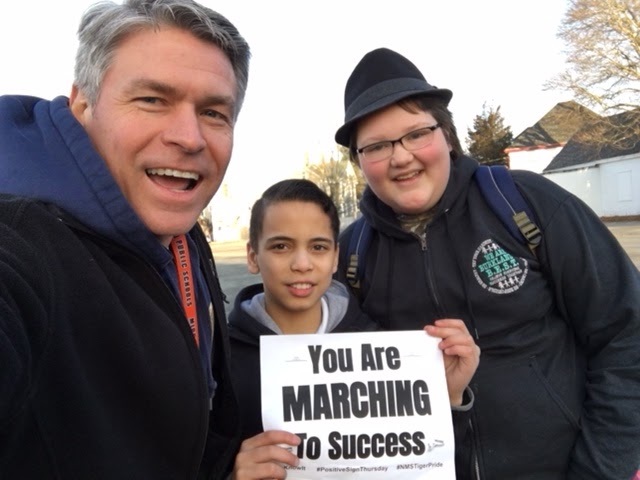 One of our main jobs as educators is getting our students to want to come to school. 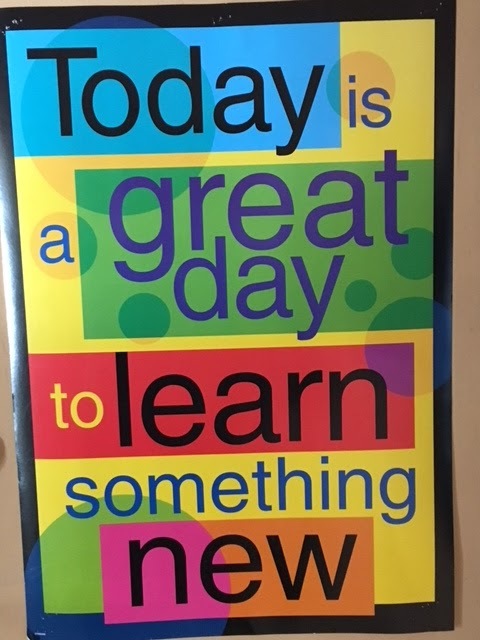 The first few days of school are imperative in setting the stage for this to happen as well as all of the learning that will occur for the rest of the year. 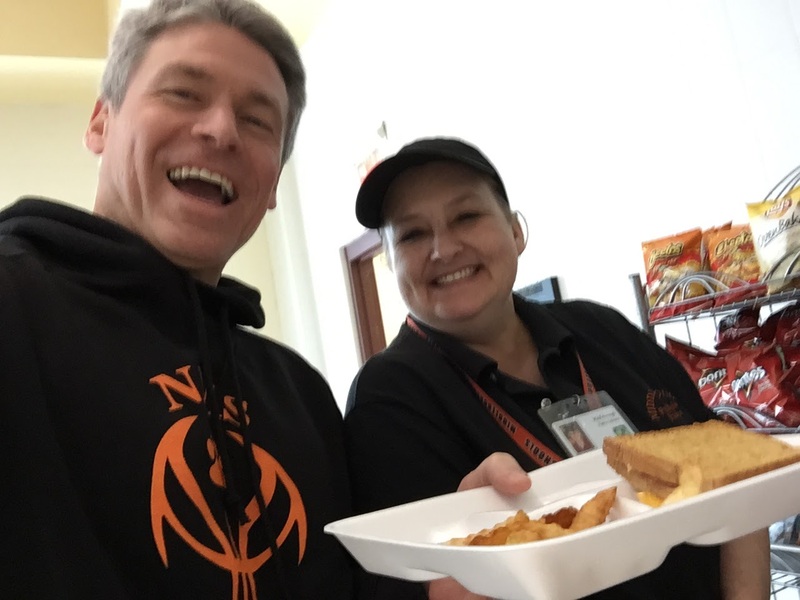 As I walked around the building during the first four days, getting into classes, I was so impressed with the work our faculty and staff was doing to build relationships with our students. I saw teachers doing exercises for relationship building, forming a culture of together and learning, and then after that, starting to get into the academics. All of these are important, and each holds its own individual importance, but research will say that a foundation of trust and a relationship is needed in order to build the academics upon. For me, it was so much fun to see our faculty and staff do all of these activities in the first three days. 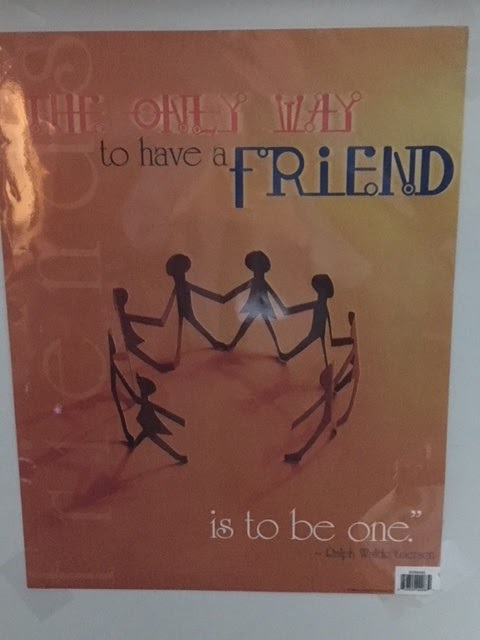 In our own first few days as a faculty and staff, last week, prior to students coming, we as a district and a school spent much of our three Professional Development days discussing this importance of building a relationship with our students. 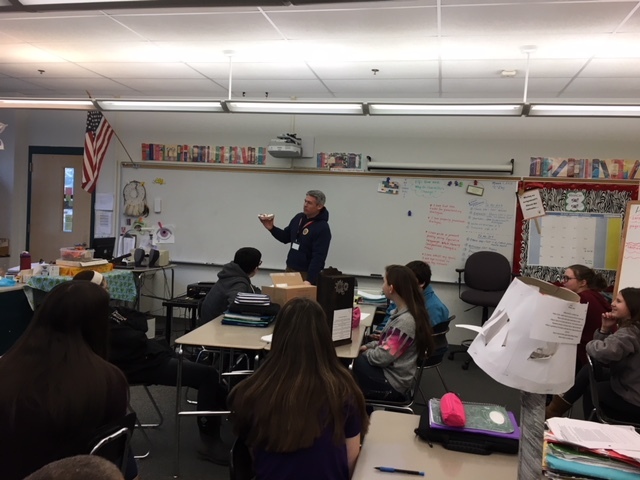 We had guest speakers, presentations, and also read many articles which all expressed how our students will learn and put forth more effort when they trust their teachers and have an established relationship with them. This is exactly what I saw in these first few days. 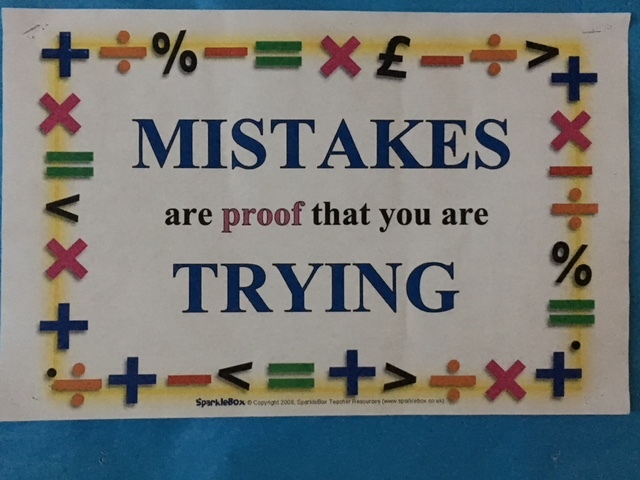 As a student so eloquently put on a sticky note in Ms. Macquarrie’s 8th Grade Math class in the picture above: What’s your opinion of school? “It’s a good to place to learn.” –> Yes. We nailed it. 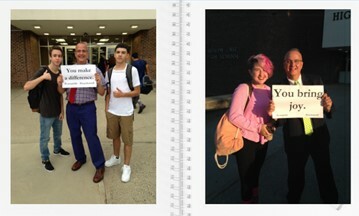 On the first day of school, Ms. Rae, Mr. Thomas, and I held a sign and took selfies with the students stating that “We’re here for them.” In a simple way, we wanted all students to see that they are wanted here at NMS. 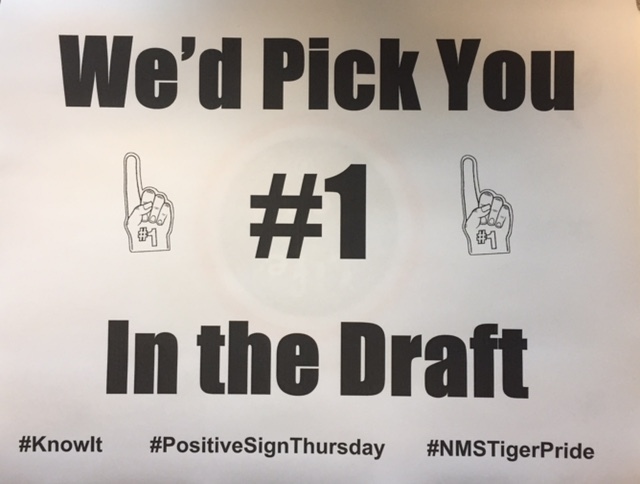 On the third day, Thursday, we held another sign explaining to all students, “We hope they have a Banner year” similar to the New England Patriots. 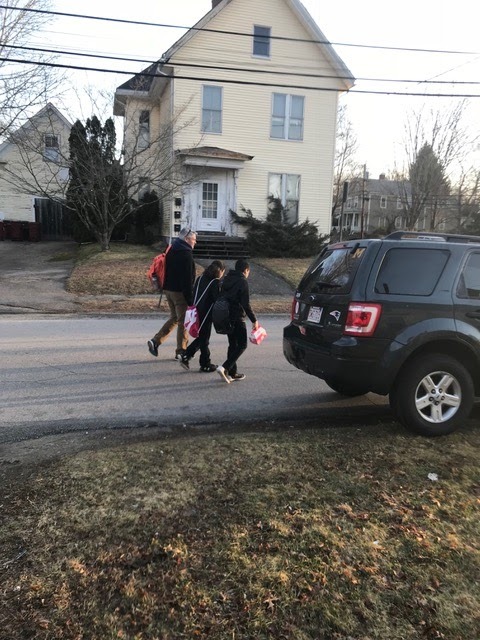 Again, this was what many of our students saw as they were dropped off for school or got off the bus. 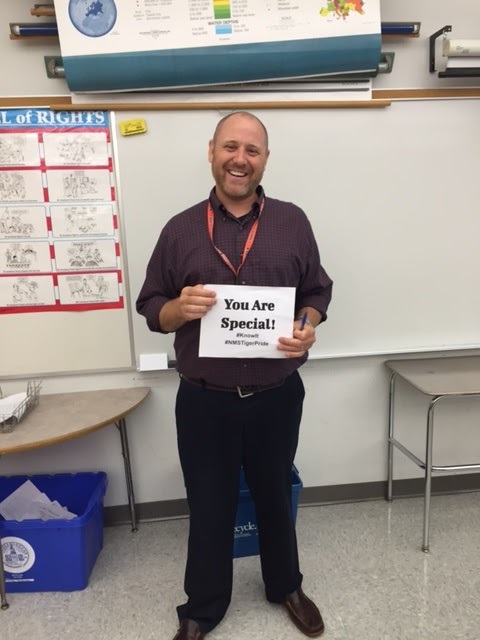 We want our students to feel special and know we care about them, and a little sign (inspired by my friend and colleague at Joseph Case High School in Swansea, Principal Brian McCann) can do this for our students. 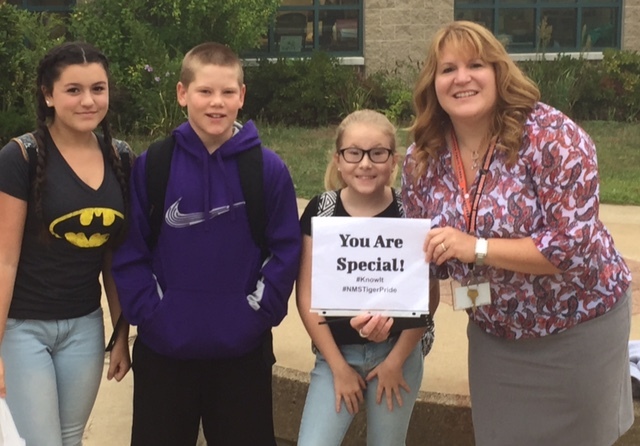 On Friday, September 8, it was the first day we had all of our students wearing their Class T-Shirts and our faculty and staff wearing their Staff Shirts. It was an awesome display of school pride and unity. 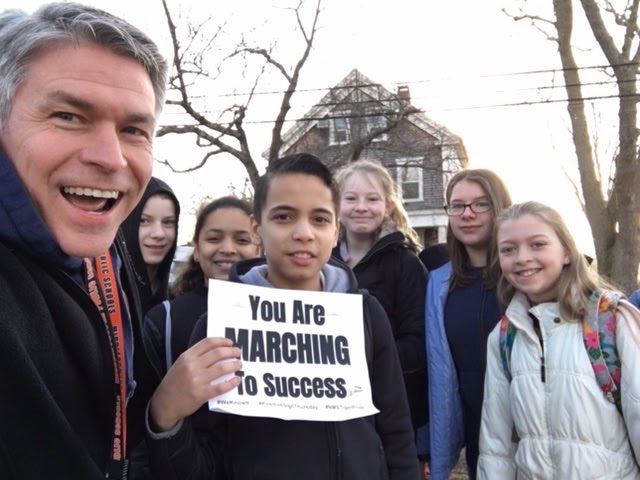 In 6th Grade classes you would see a sea of gray; in 7th an ocean of orange; in 8th grade, a bouquet of black; and all along side, a staff shimmering in black with the word “PoWErful” emblazoned across it. 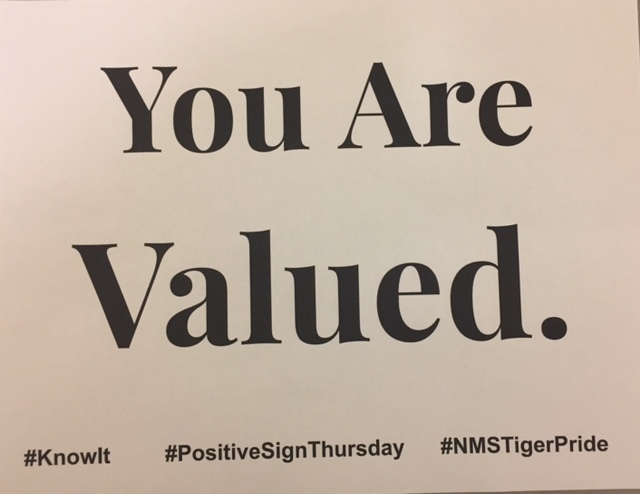 We are going to continue this tradition for our signs on #PositiveSignThursdays and on the first Friday of each month, we will wear our T-shirts. 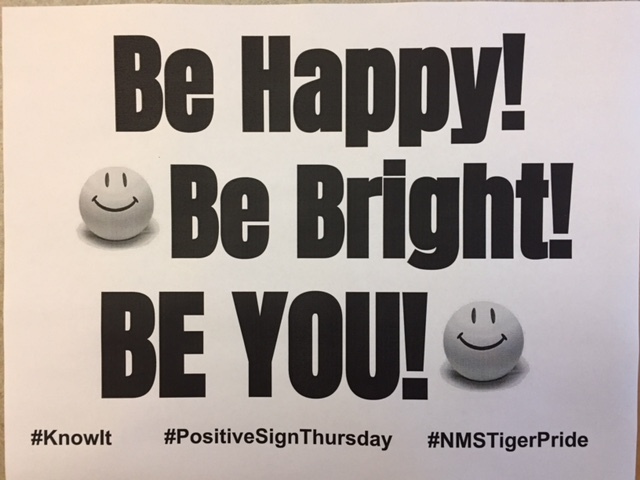 Our next #NMSTigerPride Spirit Day will be Friday, October 6. 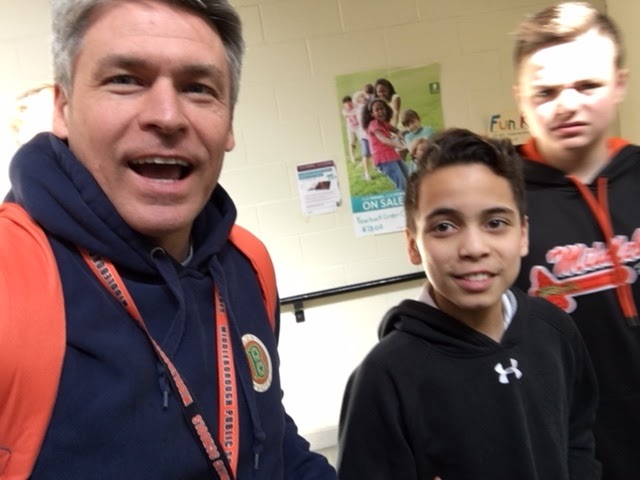 Here is a “Storify” of my @JTNicholsMS Tweets of the week, which tell the story of welcome, unity, relationships, and school spirit. Please check it out. 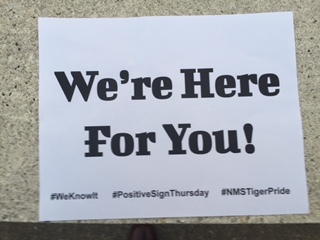 Since the first day of school, Mr. Geoghegan, Mr. Thomas, and Ms. Rae have been holding up a sign to greet our NMS students as they come in the door to welcome them to school and show that we are all here caring about them and how they do. 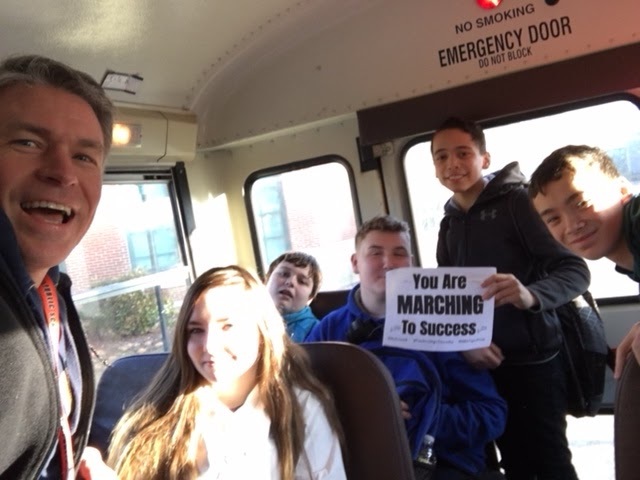 We hold the sign, tell the students “Good Morning” and ask if they would like a “selfie.” Most students partake, and even some look forward to these Thursday mornings. 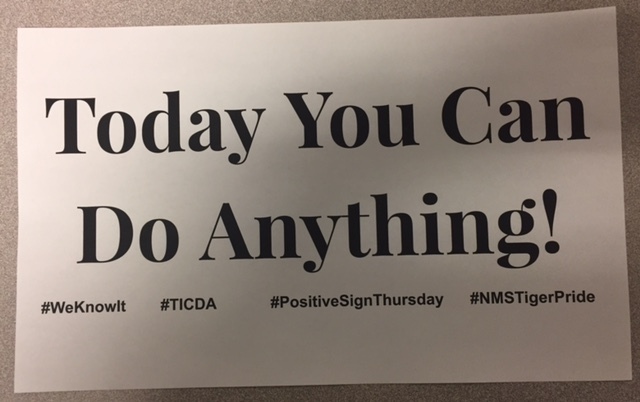 All three administrators then Tweet out these pictures with the hashtag #PositiveSignThursday on our personal Twitter pages as well as the@JTNicholsMS Home Twitter page. 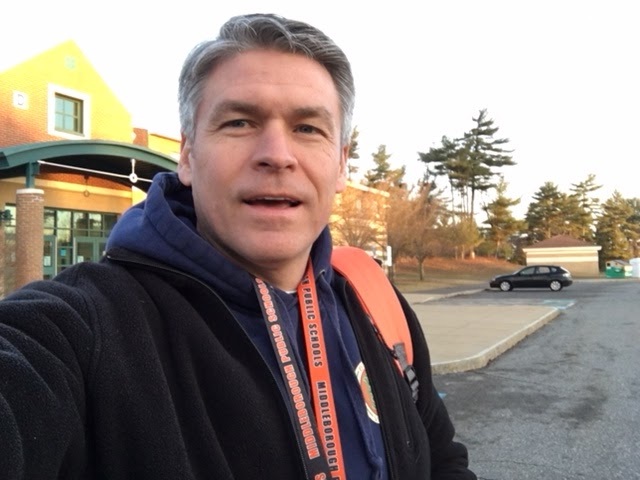 A gentleman, who Follows Mr. Thomas’s Twitter account, went to college with Mr. T and also happens to work for CBS Boston WBZ. He loved the idea and loved the pictures. He knew it would make for a great story. He got in touch with us a couple of months ago to say that he would like to do a story on the idea. 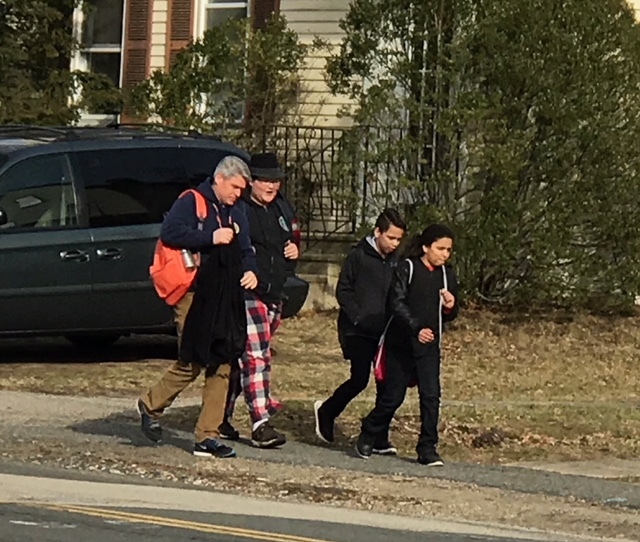 On Thursday, May 4, a cameraman from WBZ Boston came to the Nichols that morning prior to school to set up his camera and shots to get the story documented. Then on Thursday, May 11, the story appeared on WBZ Channel 4 at 5 PM, and then again, at 8 PM on MyTV 38. 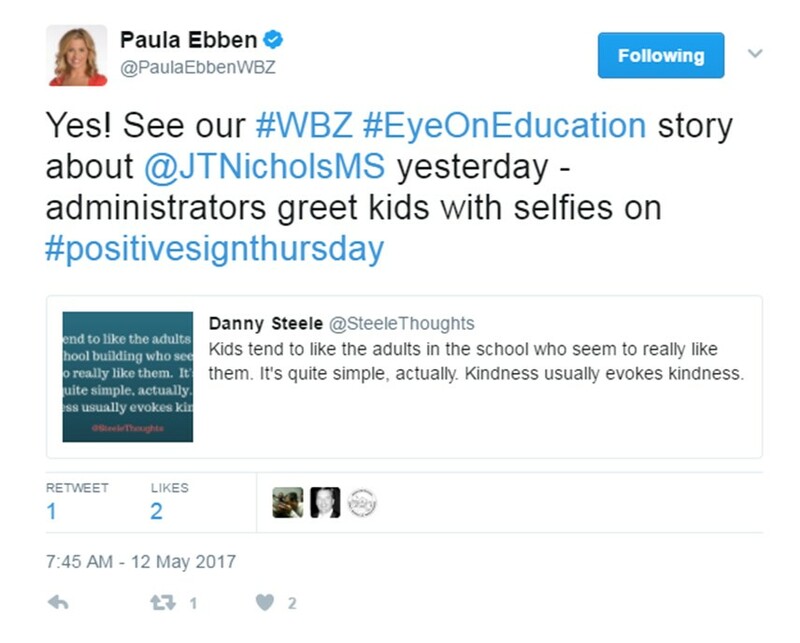 Ms. Paula Ebben, anchor for CBS Boston, Tweeted out that the story was going to come out early in the afternoon on Thursday. 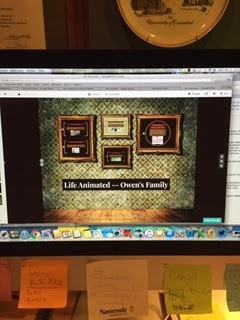 Then at around 5:55 PM, our story appeared on the News. 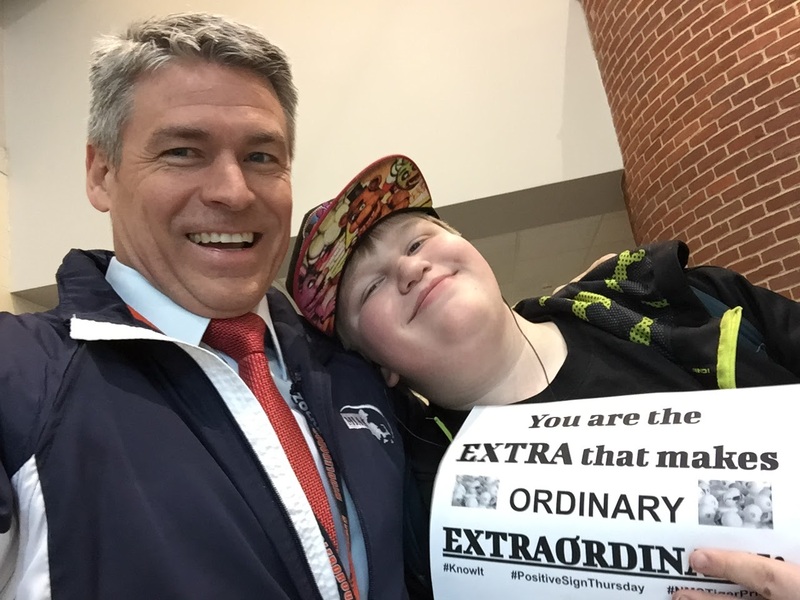 Administrators at one school are making Thursdays “picture perfect.” WBZ-TV’s Paula Ebben reports. The reaction on Twitter, Facebook, and through emails has been incredible. 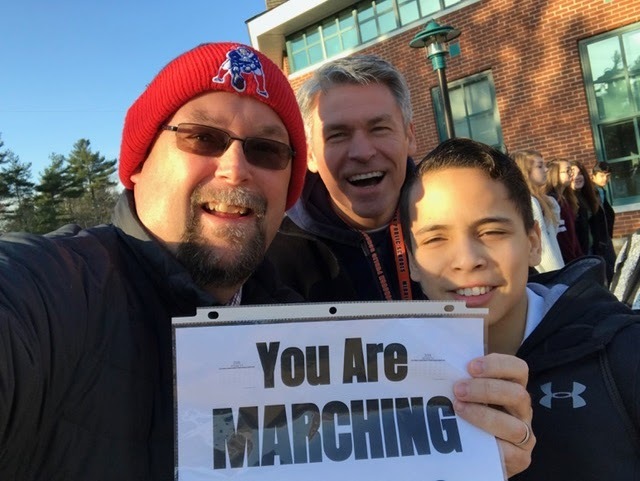 People are just loving the story and the practice of #PositiveSignThursday. 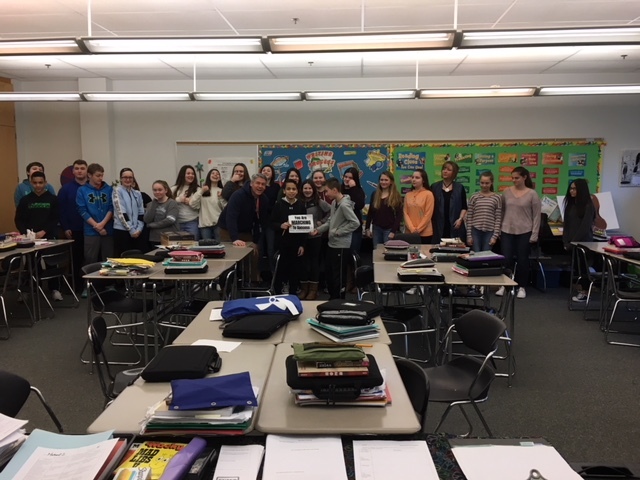 This practice was presented to Mr. Geoghegan from Joseph Case High School Principal Brian McCann. 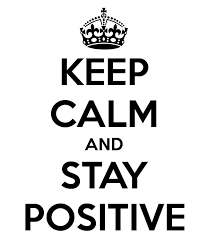 This is his second year of Positive Signs. 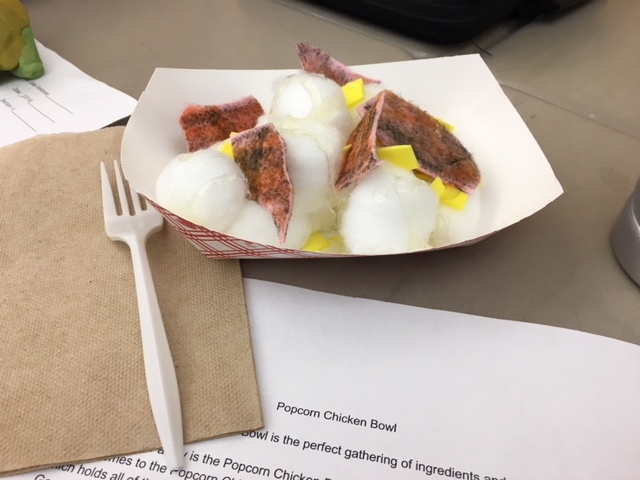 Mr. Geoghegan and Mr. McCann have taken this idea on the road and have presented it together at conferences and will continue to do so this summer. 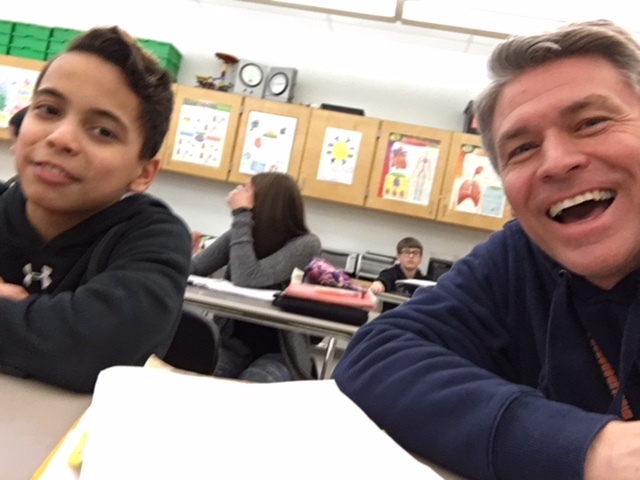 The two of us believe that relationship building with our students is one of the most important things we can do. 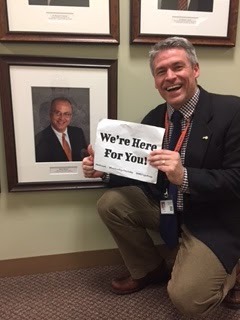 We have fun doing the signs and I know we will continue until we create a different, more innovative way to show our students we care about them. Here are just a few of the fun shots we have taken from this year so far. 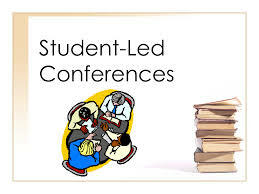 On Thursday, April 6, and Wednesday, April 12, NMS parents and students with the help of their teachers engaged in Student-Led Conferencing (SLC) and Parent-Teacher Conferences. 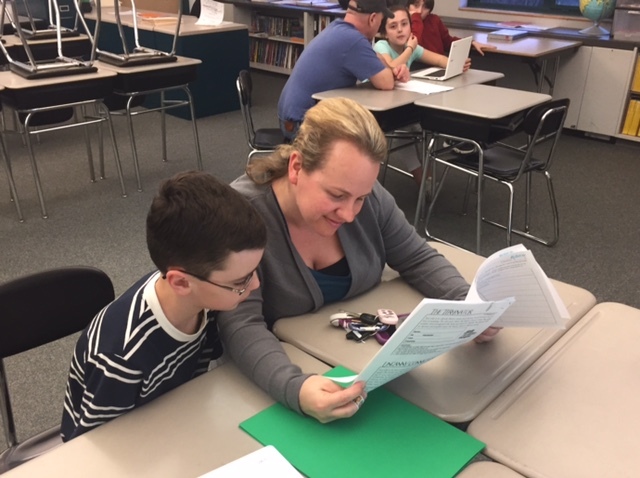 Students in all grades explained to their parents how they were progressing with the standards. 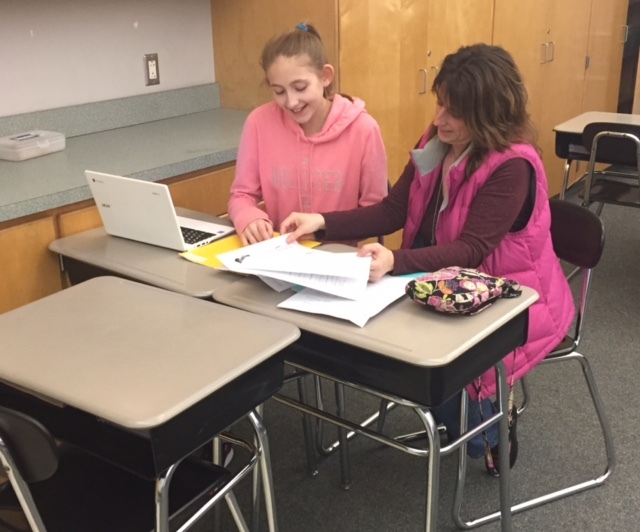 They would grab their Chromebook and show their parents their work examples and talk them through where they might have been in the beginning of the school year, how they improved, to where they are now. I was super impressed with all the families who came during these busy spring evenings. With the rain/weather, baseball, softball, soccer, lacrosse, dance, twirling, scouts, homework, work … life … there are many things that can take up our time. 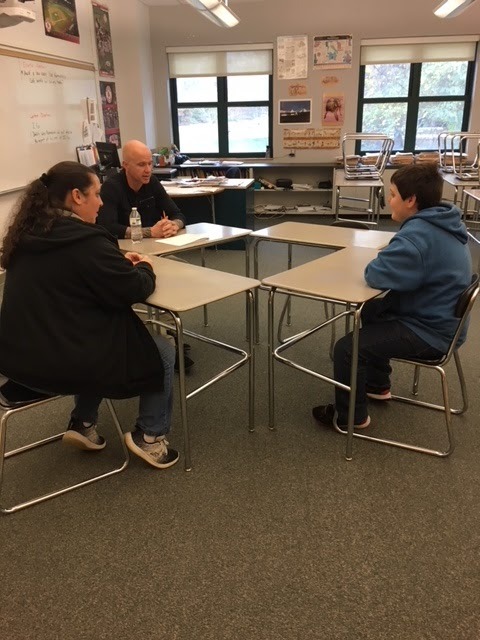 But parents and students came in batches as cars drove in and out of Tiger Drive to listen to their children explain their learning. 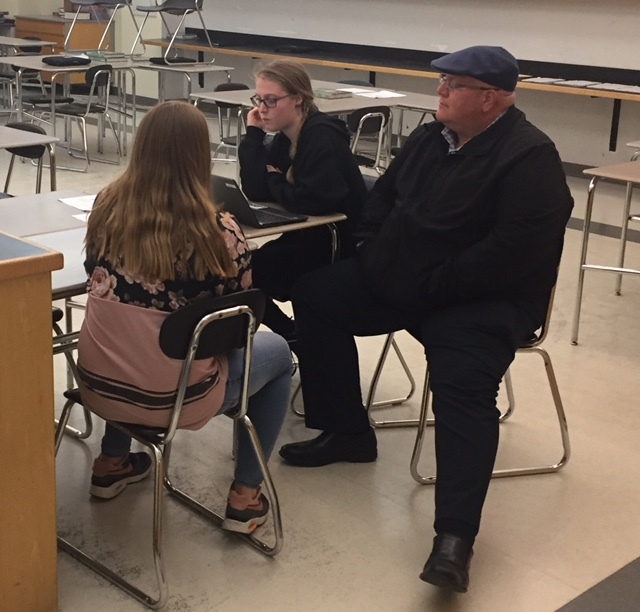 As I was walking around, there were so many conferences going on where I would see the student, the parent or parents, a sibling or two, and the teacher right there at the side supporting or guiding the conversation as well. This is what we hope for. We want our teachers to be the “guides at the side” for our students’ learning. 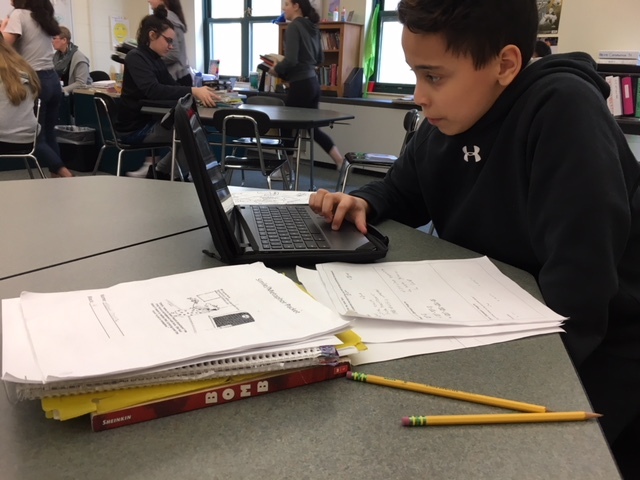 We want our students to be at the “center of their learning” and be able to explain how they are doing, and what they are going to need to do to improve. 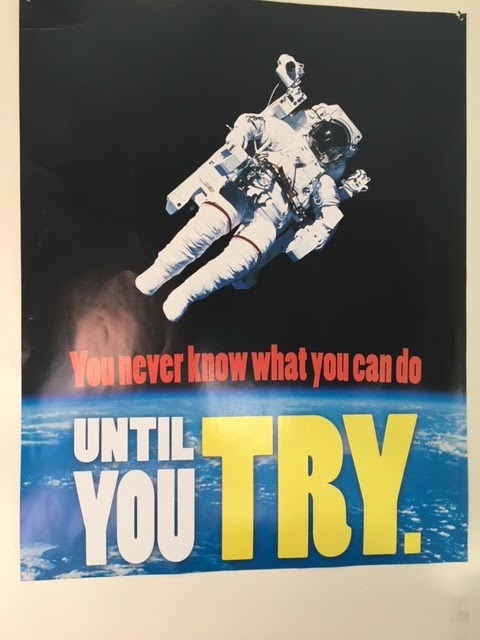 Our teachers are here to support them and help them with that improvement, but it will be their, the students’ challenge to get to their eventual goal. This is what is so tremendous about these evenings and why I cherish them as awesome displays of academic achievement and celebrations of learning. 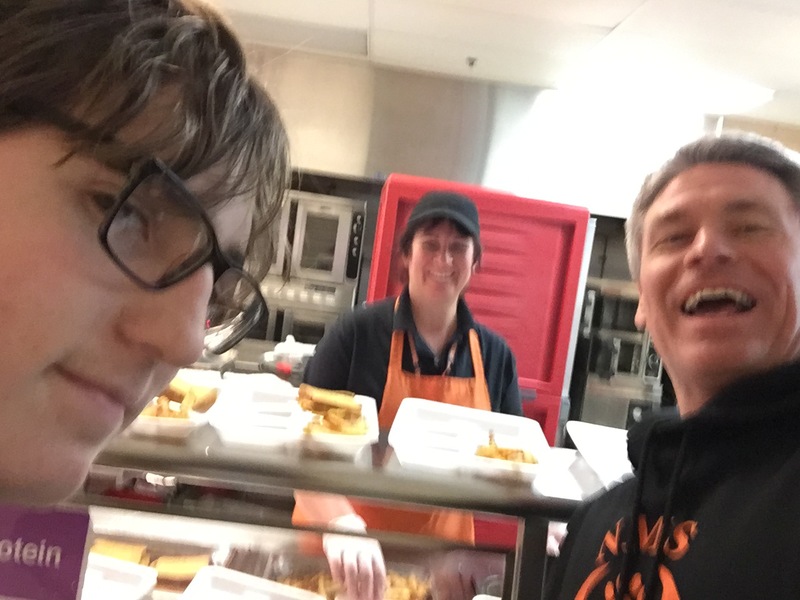 I have to thank all our faculty for making these nights possible, and our NMS PTA for supporting us with dinners/coffee/snacks and the Spring Book Fair. So much great stuff going on. 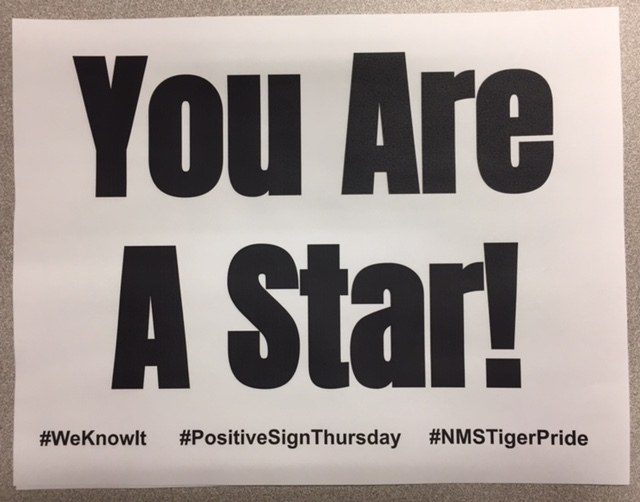 Thank you all for all that you are doing to help us keep learning at the forefront for our students here at NMS. 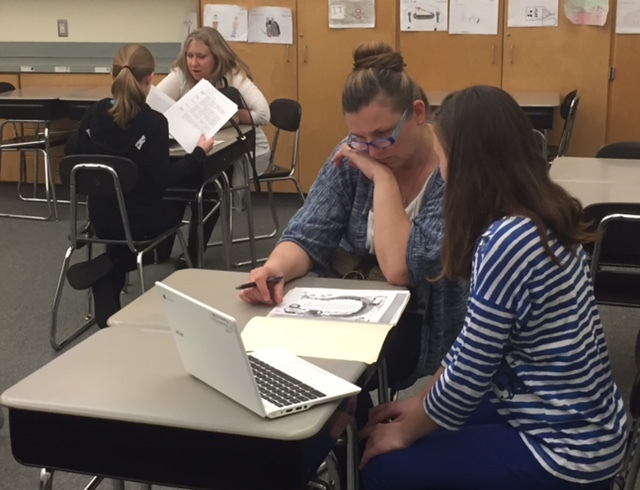 Please check out some more of the pictures from the evening on Wednesday, April 12, and pay specific attention to how many conversations had faculty involved and how intent parents were to listen to their child. Very cool. Thank you again. Last year, when I went to the NASSP Conference (National Association of Secondary School Principals), there were these principals from all over the country, who I could say I sort of knew through Twitter. I followed them and they followed me. 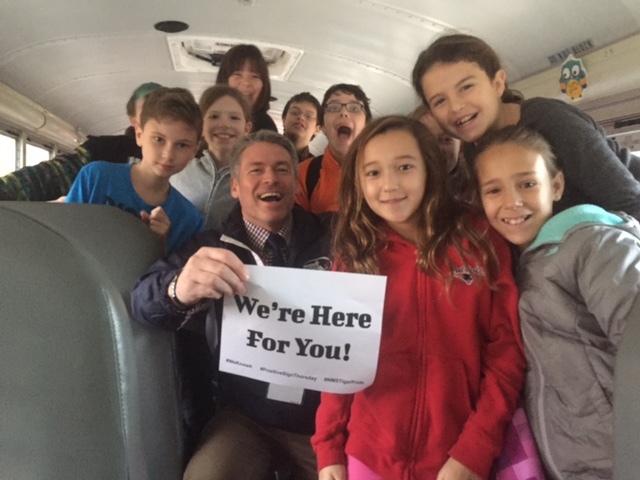 There were a few specifically from Ohio, who were handing out postcards talking about #ShadowAStudent Day. 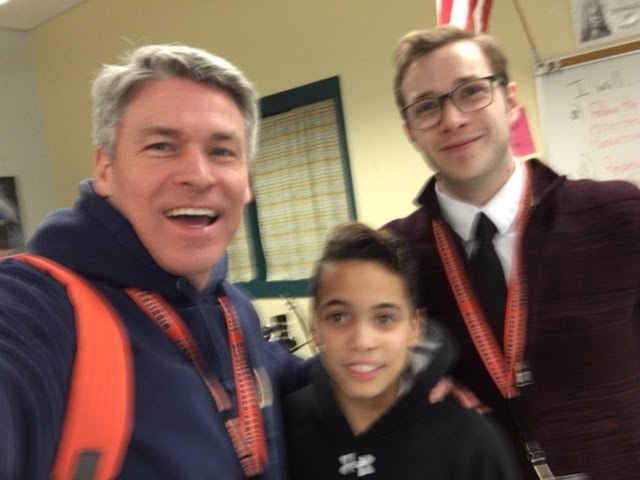 I again worked with the faculty to decide which grade and team I would shadow, and it turned into an 8th Grade Comets encore day for this year as well with Nick on Thursday, February 16. With the teachers knowing what to expect from having me in their classes, they gave me the homework the night before. I had a school event I had to go to, so I did not get a chance to start my homework until later, and worked late into the evening. 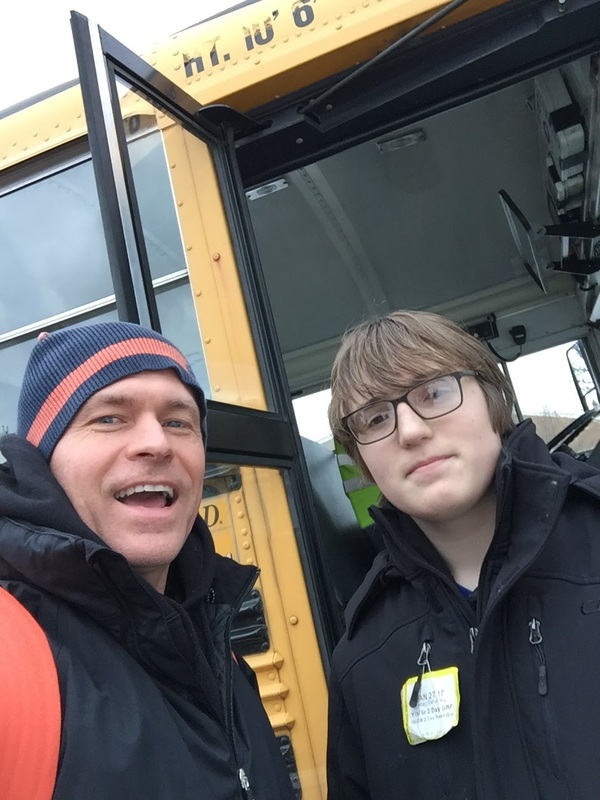 As I did last year, I met my student, Nick, at his home to head to the bus stop. 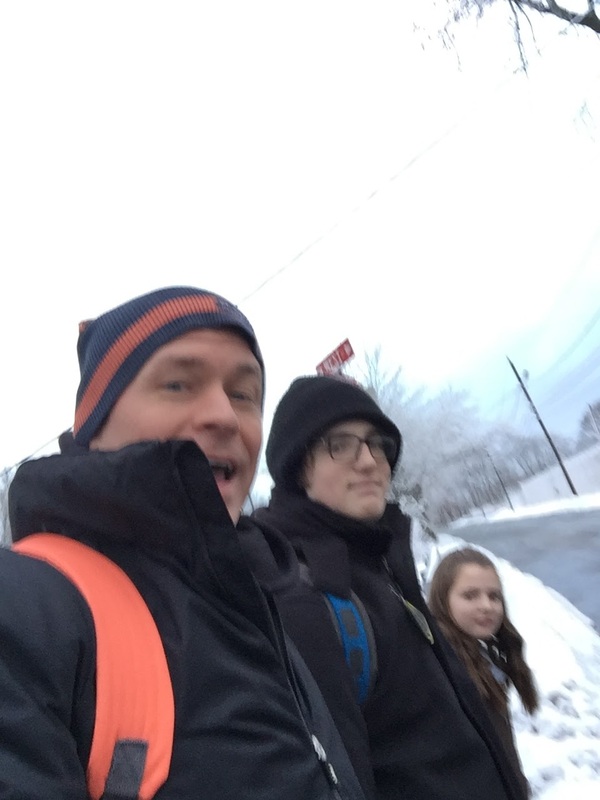 My same reflection as last year was that a household with students is a busy morning for all. Nick and his sister were ready to go, though, but they informed me that we didn’t head out to the stop until 7:02 AM. 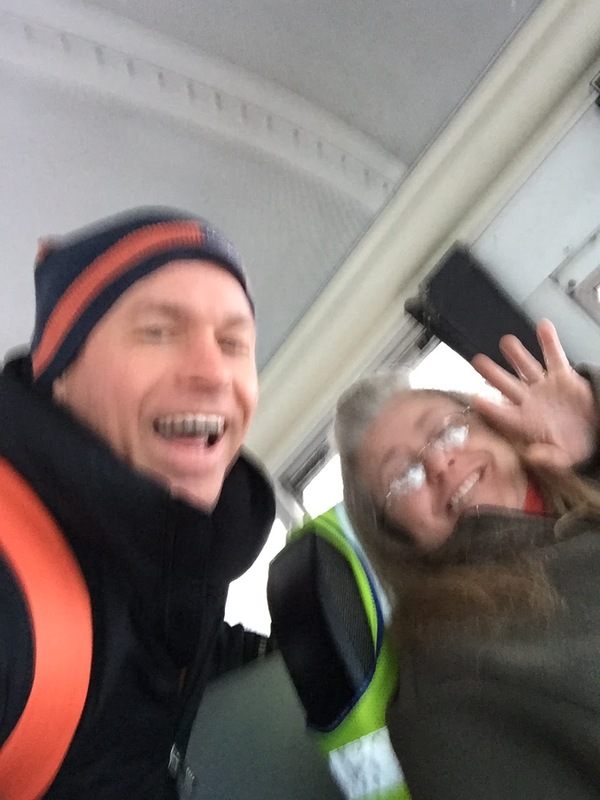 We made our way to the bus stop, and Karen, the bus driver greeted us with a great smile. 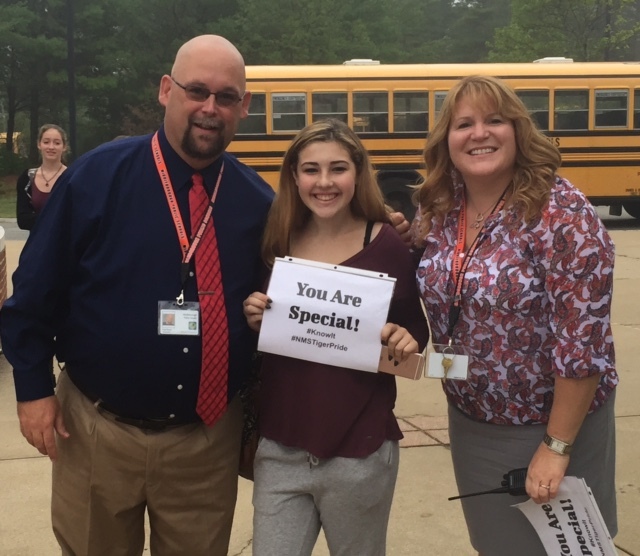 Some might think that this was because she was seeing the Principal as a Student getting on the bus, but what I learned from the students is that she is always so friendly with them. 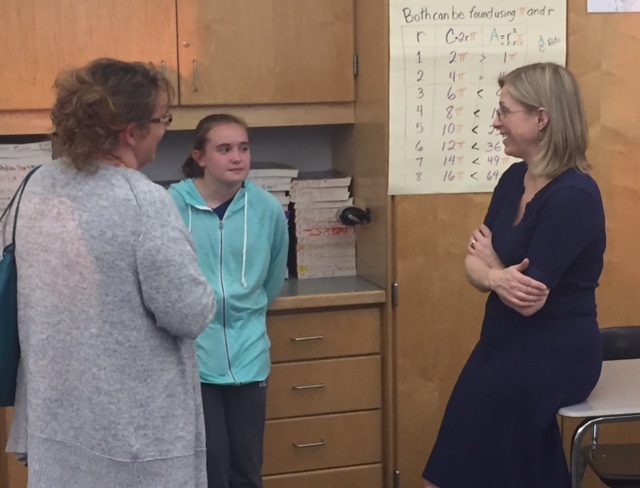 We talk all the time about how “Relationships Matter” and how they should be “First and Foremost” established in the classroom, and here it was lived out by the first person our students see in the morning. She is setting such a great stage for their learning. Excellent job, Karen. 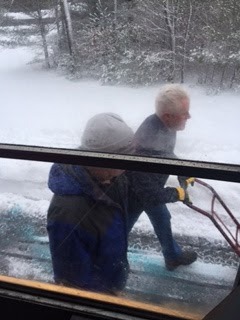 The morning was a snowy one, so I got to see from the bus how much work and preparation our custodians and maintenance staff put in to make sure our students arrive safely. 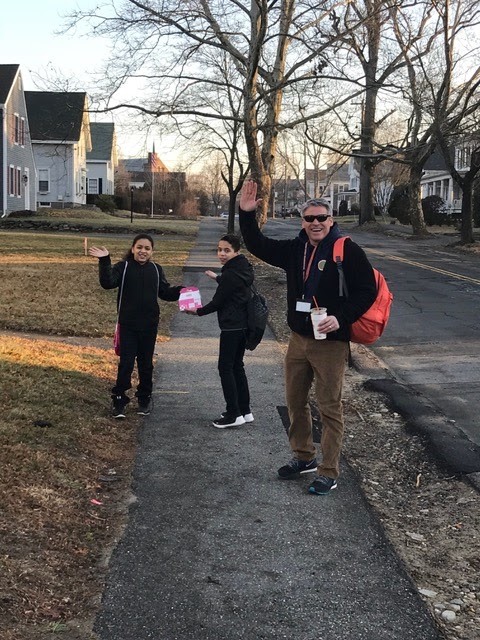 Our two Assistant Principals, Ms. Rae and Mr. Thomas, were at their normal spot greeting students as we got off the bus. 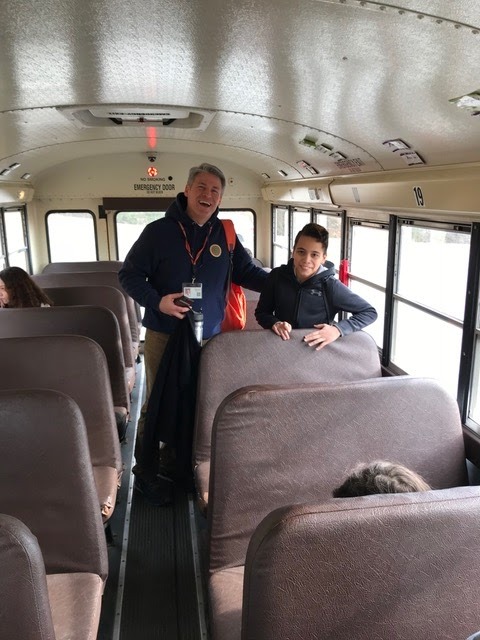 Again, giving that welcome to students is so important; I can’t thank Karen enough for being that person for everyone on Bus 13. 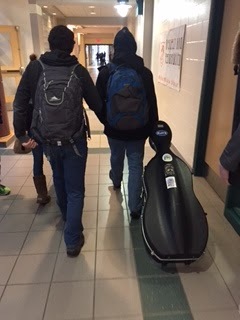 My trip to Homeroom with Nick led us first to head to the Music wing to have him put his cello case in the classroom for later. 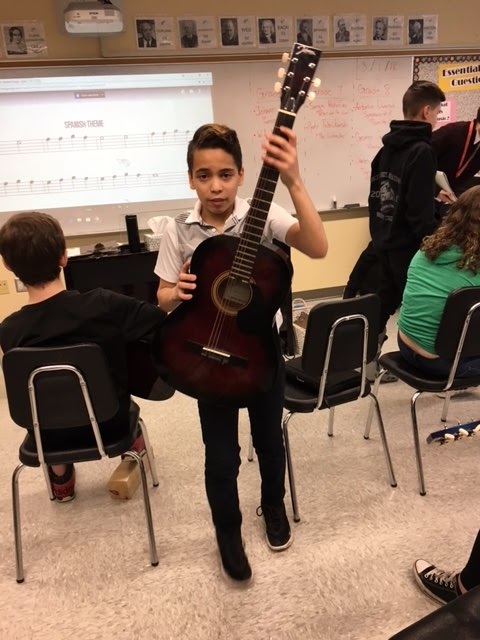 Our music students put in so much time, effort, and handle so much responsibility to make sure they are prepared for their class. It is impressive. 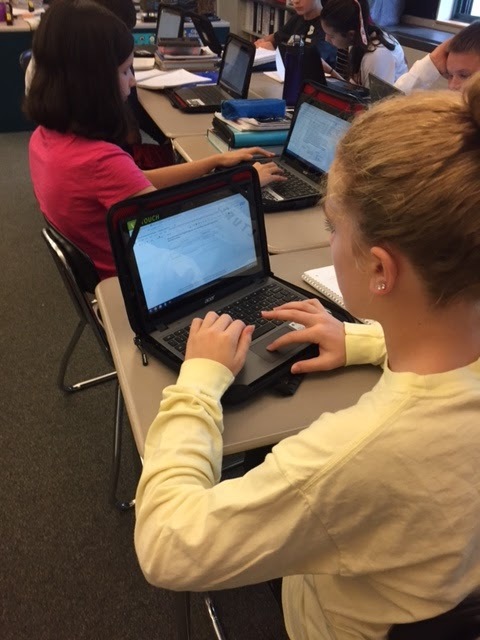 At Homeroom, the first major difference between this year and last was evident, as students grabbed their Chromebook for the day. 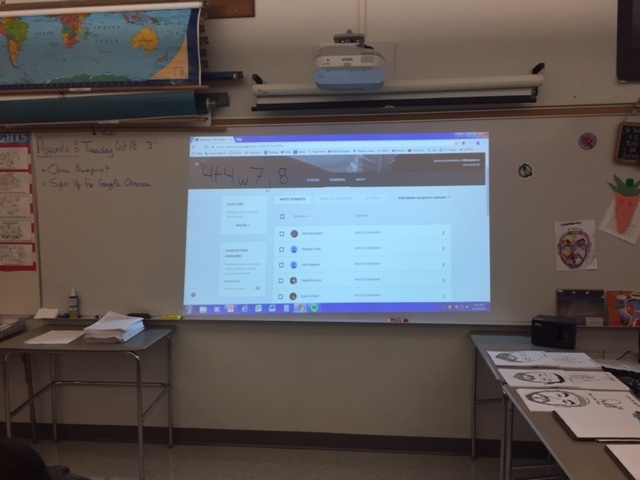 I have spoken about this in countless other posts, but it is such an awesome tool for learning and is teaching all of our students digital responsibility, which they all need to learn in this day and age. 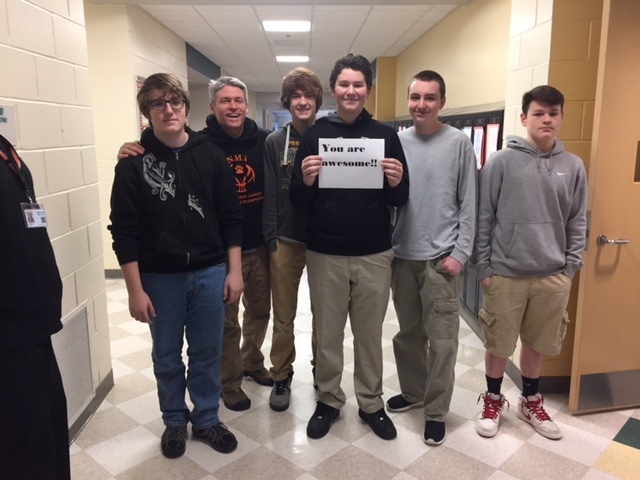 During Homeroom, a few of my #PositiveSignThursday boys made a sign for me, which I just thought was “Awesome” as well. A common theme, which happened in Homeroom and every single period after, was how our teachers greet our students at the door of each class. Again, #RelationshipsFirst are happening multiple times a day and through multiple means. 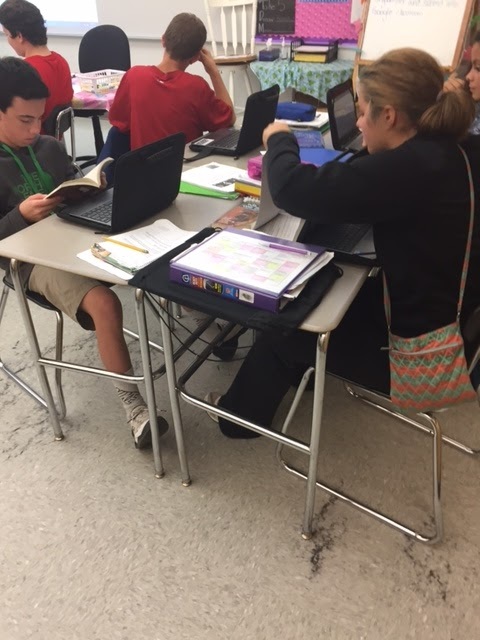 Ms. Kubek’s ELA class got our day rolling first block. 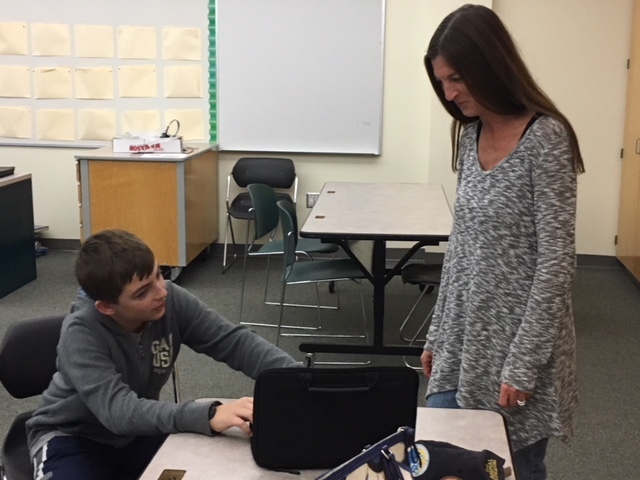 She started the period by walking around and talking one-on-one with each student. She was checking homework but she was also checking in with them for the day. 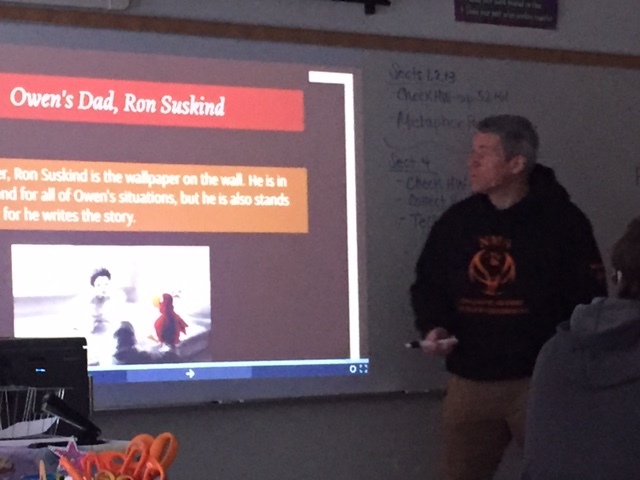 While I made my presentation, I enjoyed myself, but I tried to think as an 8th grade student, and even though I have zero problems standing in front of people talking, presenting, and being the center of attention, I could see how this could be tough for some of our students. 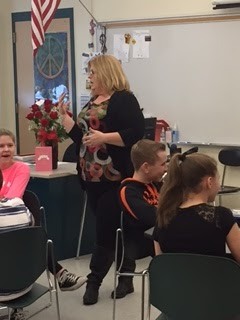 But Ms. Kubek was there with encouragement and positive affirmations to each student. Our next class was right next door, ELA2 with Ms. Evans. 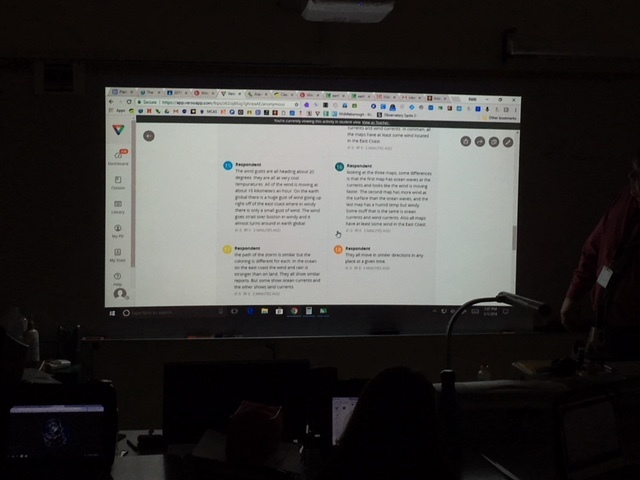 To begin the class, Ms. Evans stressed to her students how important it was for them to speak clearly and emphasize the ideas in the presentation more than the information on their Google Slides. 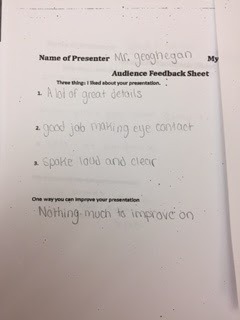 After each presentation, students wrote evaluations of their peers. 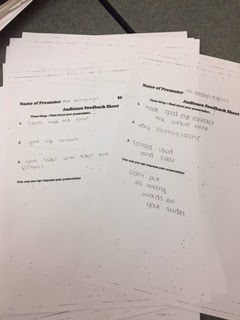 These evaluations discussed specifics of what students did well and maybe what they didn’t do so well. They were honest and true. Such a great activity for all students to give as well as receive this feedback, and the ability to take it and reflect upon it. 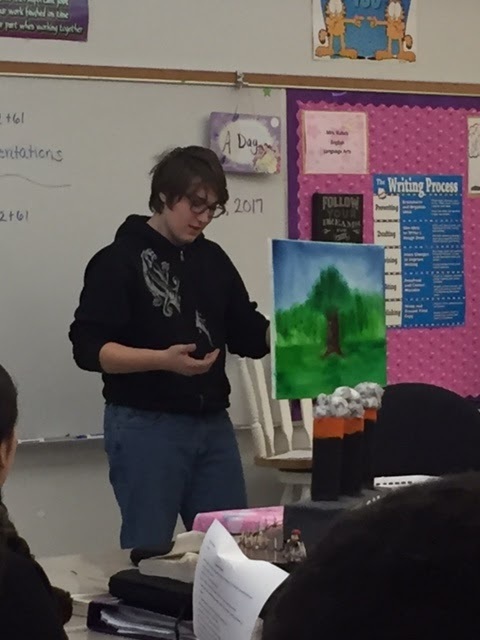 Third block was Nick’s first Unified Art class of the day with STEM. 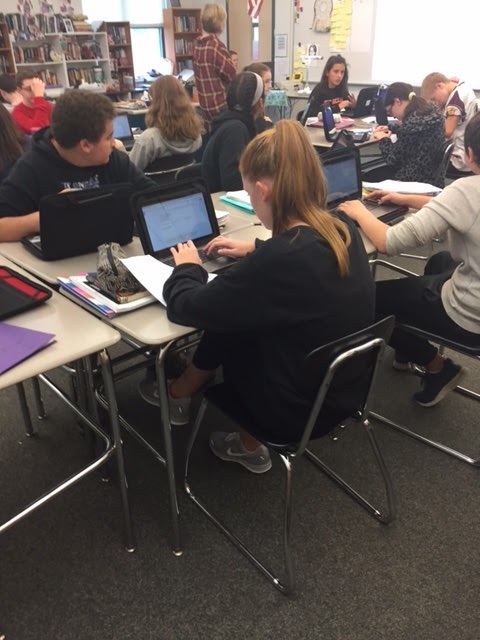 As was evident in the first two periods, the students had the ability of taking advantage of the 1:1 initiative as students again used their Chromebook to do the warm-up Ms. Mayeski had set up for them in Google Classroom. 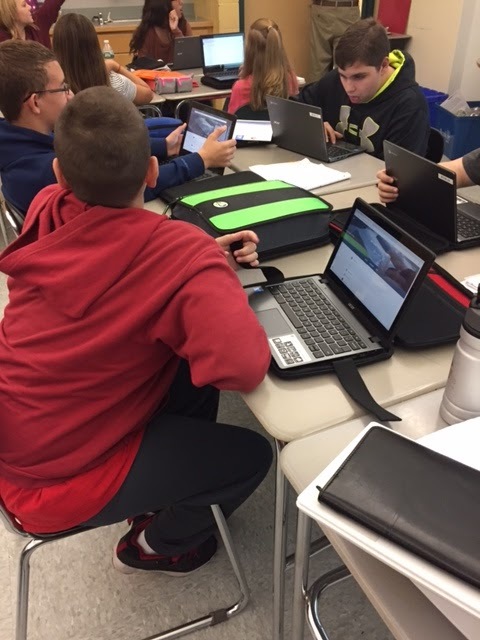 I was very impressed with how the students were engaged in a real-world discussion of fossil fuel use. 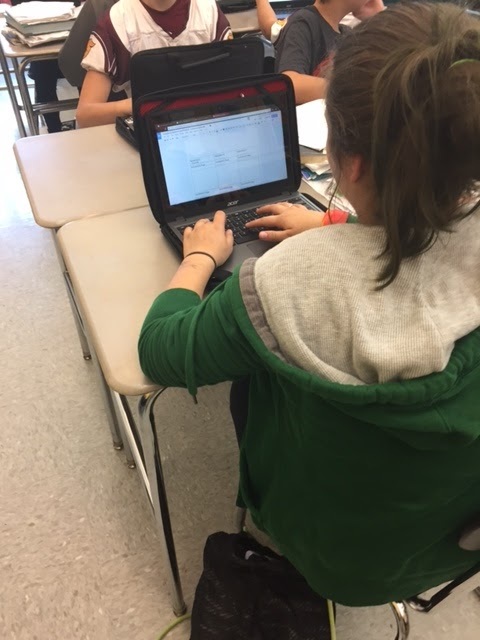 Ms. Mayeski had the class reading an article and then entering their answers through a Google Form. 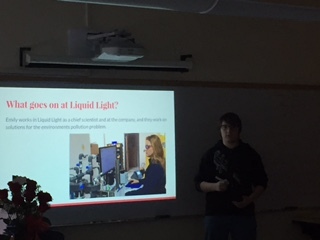 Students wanted to participate and show what they learned and express their own knowledge on this scientific subject. 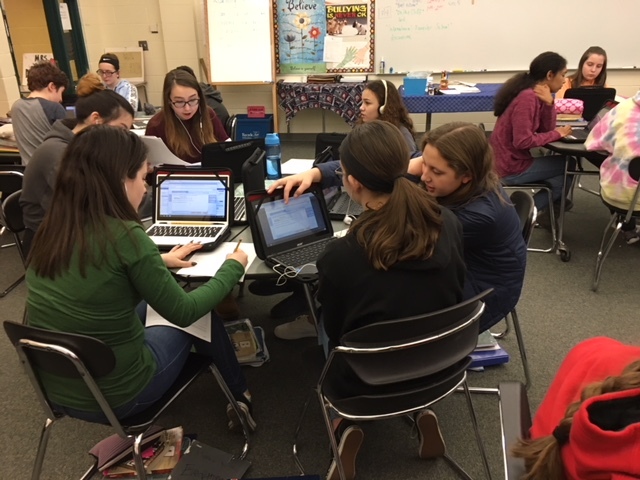 Many of the students in this class were female, and even though there is the thought that females could be wary of going into the STEM fields, this was not evident in this class. 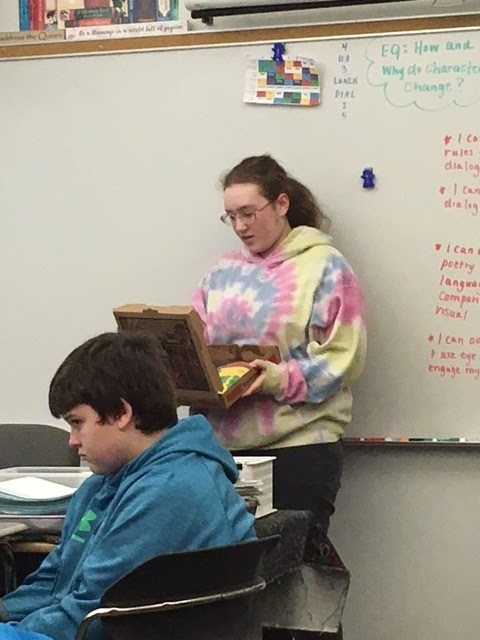 All students were openly participating and free to give their own personal opinions on renewable resources and how we can support our Earth better. 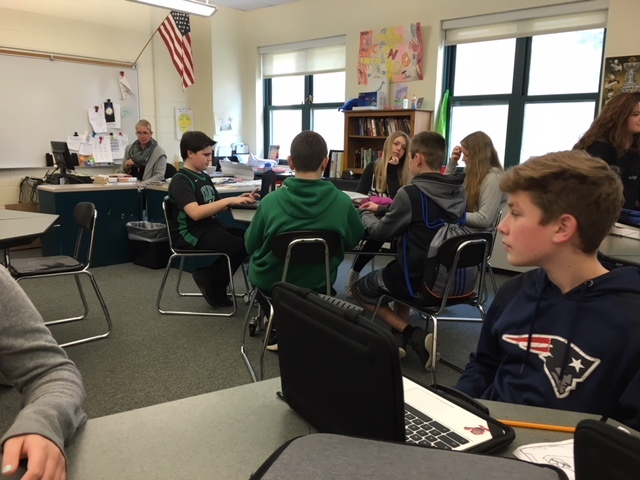 Post lunch, Block Four was Math with Ms. Anderson and Ms. McMahon. 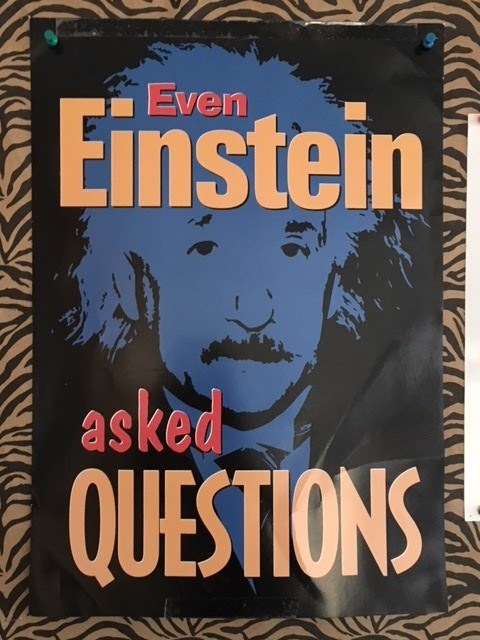 I did not study the night before and our lunch conversation when I brought it up turned away from “shop talk” to more general non-math conversations, excluding taxes. I was a little nervous to see how I might do on this test. 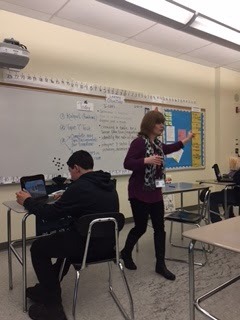 Fortunately though, Ms. Anderson had the opinion and better teaching strategy of reviewing with a Kahoot with the whole class prior to the test. 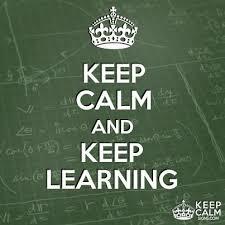 When I taught, I was of the opinion that students should have “studied on their time before ‘test day. 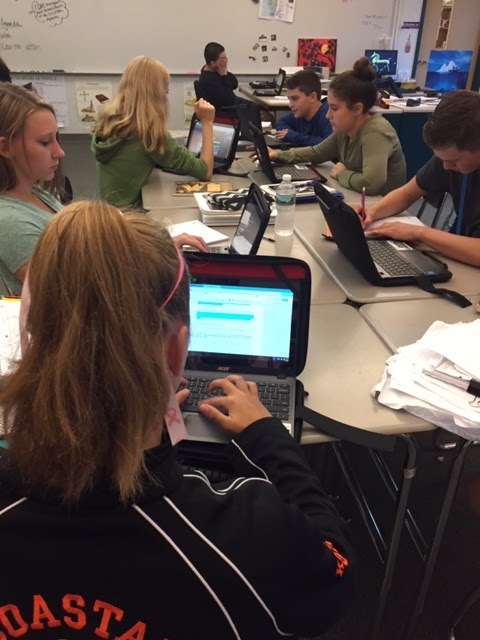 '” Again, I was so thankful for Ms. Anderson and Ms. McMahon’s lesson design. 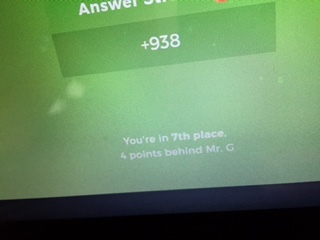 By the end of the Kahoot review, I felt confident and ready to show what I knew. So smart on their part. 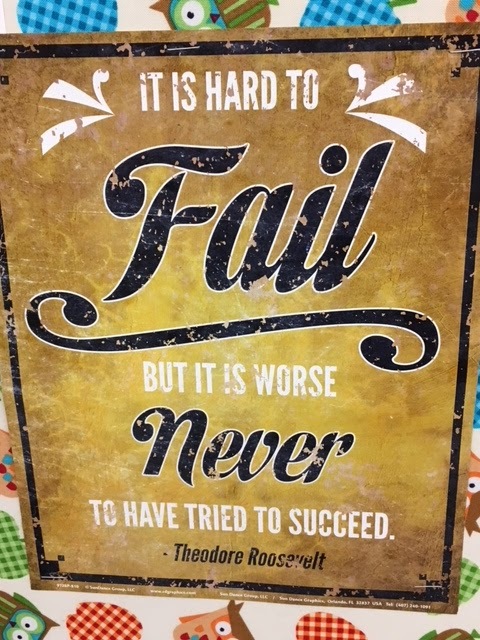 Isn’t that what we are supposed to do as teachers? Let our students show what they know; not document their deficiencies. 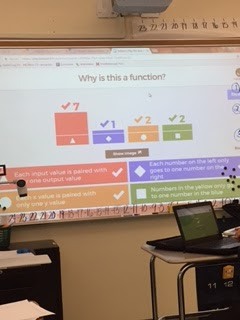 Such an awesome utilization of the Chromebooks as well with the Kahoot program. 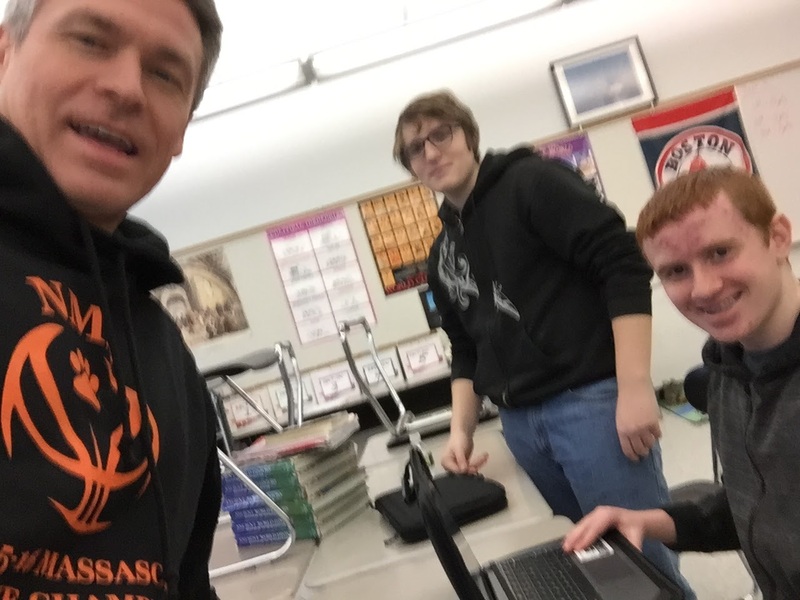 Nick and my next class was Social Studies with Mr. Jesman. 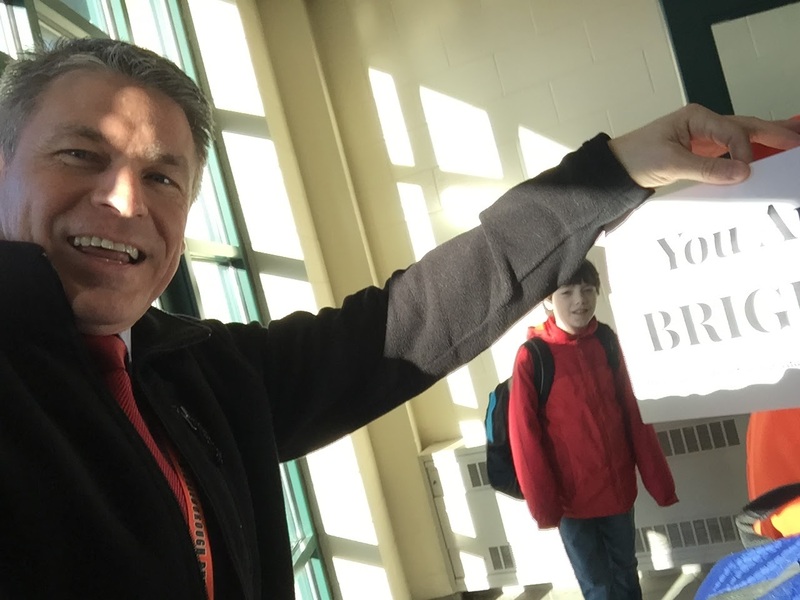 Again, Mr. Jesman met and greeted all students at the door. 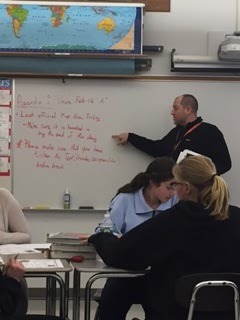 Mr. Jesman then reviewed the Learning Target and agenda for the period. 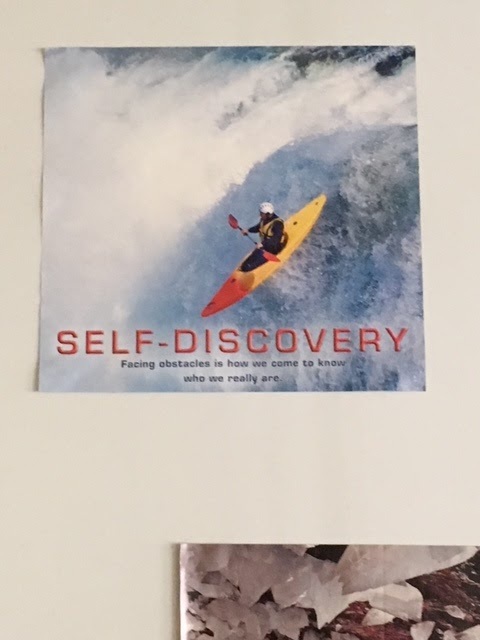 This was something we worked on as a faculty a couple of years ago through our book study of Leaders of Their Own Learning. 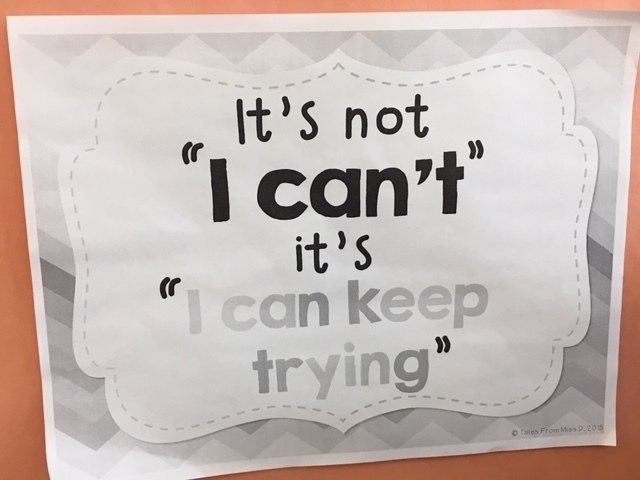 We want our students to know what is expected of them; to present to them the Learning Target in the form of an “I Can” statement, which students and teacher can check in on during the period. 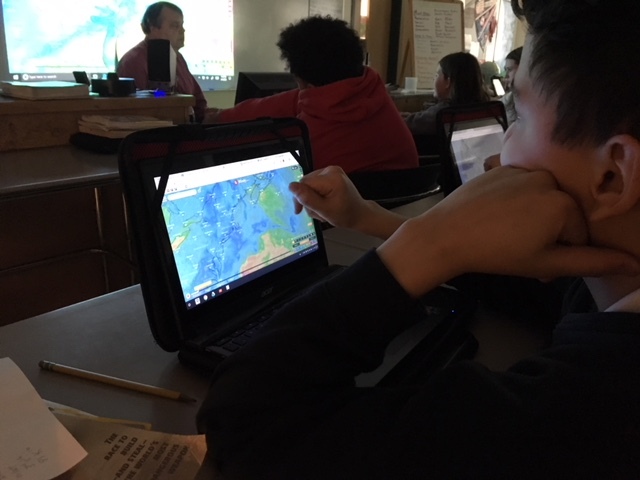 This was something that each teacher did throughout the day, but Mr. Jesman got everyone started with this as they then went to work on making a map. 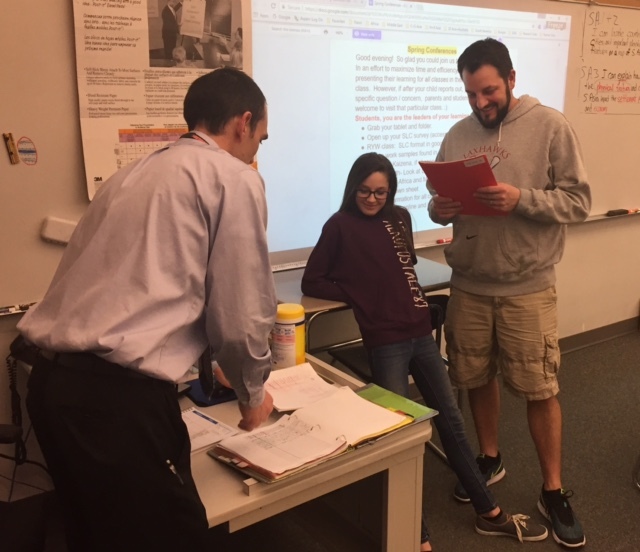 Students worked at their own pace and had the opportunity to seek support and help from not only Mr. Jesman but their peers as well. 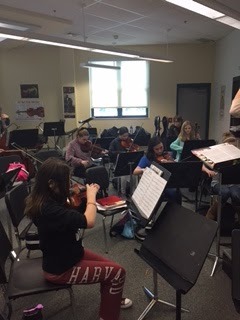 Our final class of the day was Orchestra. 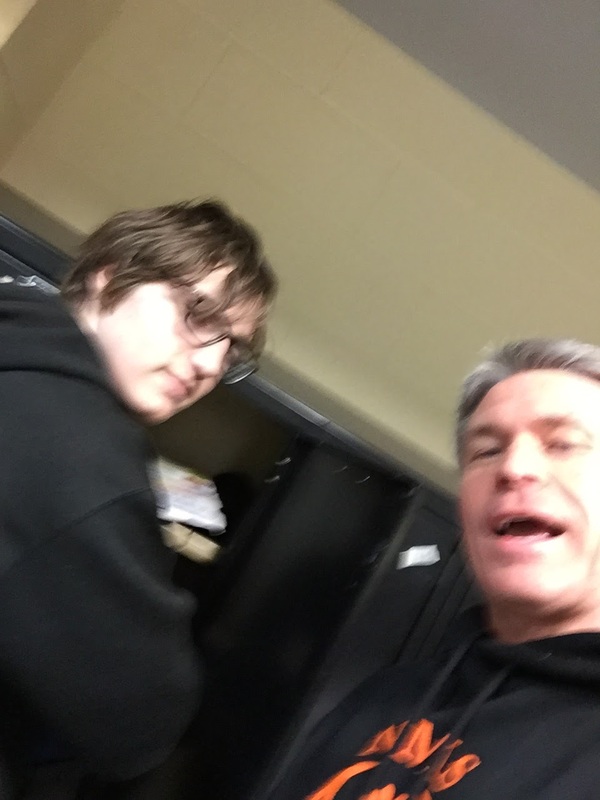 Nick and I made our way to his locker to grab his gear to go home and then head to the Music wing, where we had started our day. 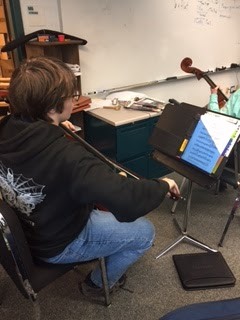 Ms. Thornton had grabbed me an extra cello to play along with Nick. Let me just say what a humbling experience it is to try to play an instrument. 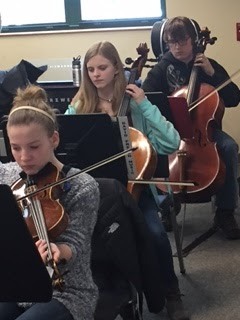 I was nervous about the math test, but nothing compares in trying to play a stringed instrument (or any instrument, for that matter) cold. 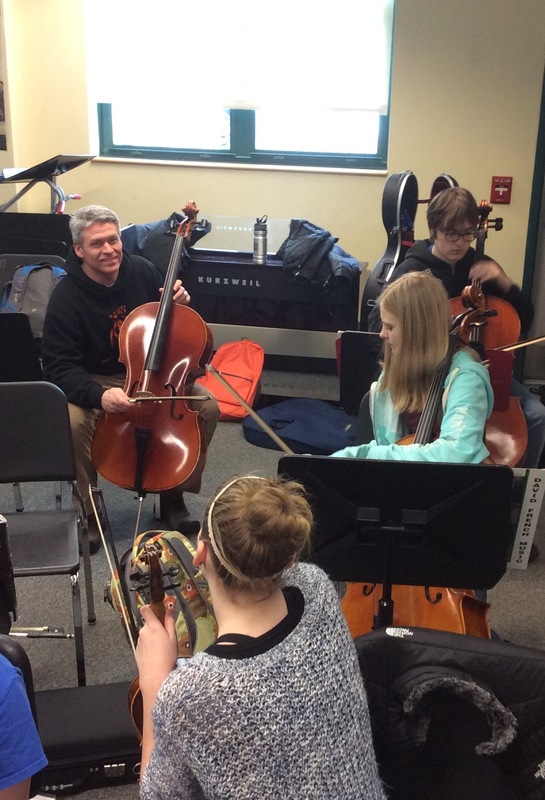 My own attempting to play was just part of my experience with Ms. Thornton’s Orchestra. The students are incredible. I have watched, listened, and heard them grow so much over the course of the last three years. They are talented. I’m not saying that they should be recording albums right now, but the “magic” that happens when they start putting bows to strings is inspiring. To think about all the dedication, practice, persistence, and grit, they put in to making themselves better is awesome. 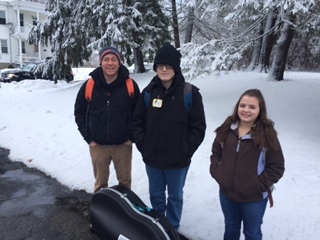 To think about Nick and his classmates, dragging their instruments through the weather and elements, practicing when they probably don’t want to, and their parents shelling out extra funds to do more individualized lessons is impressive. 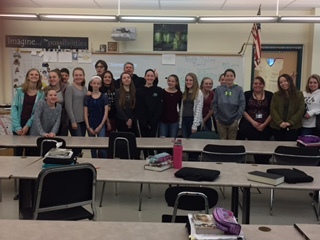 My biggest take-away from the day was from this class. 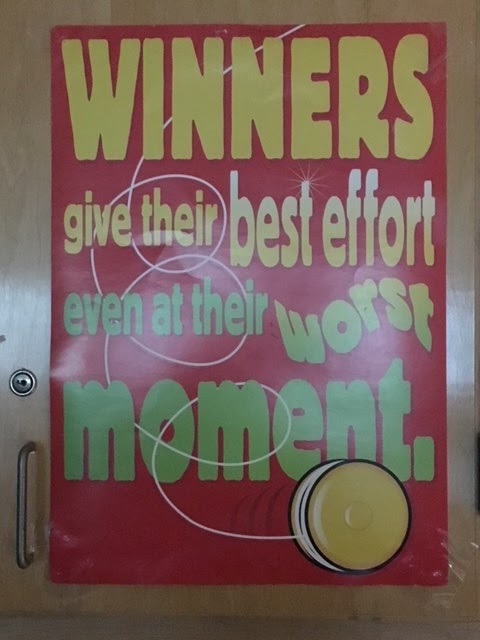 It wasn’t just the students’ tenacity to get better, but was more how they showed a “growth mindset” in their learning. 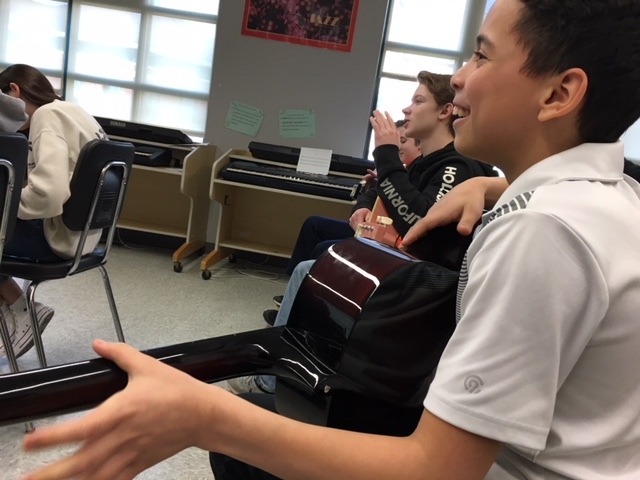 These music students showed in their mistakes how willing they were to learn from them; sometimes laugh at them; reflect on them; and then try again. 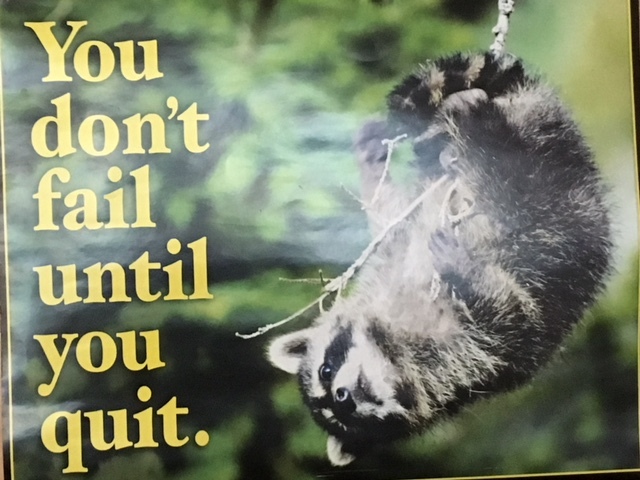 This is the perseverance we need all of our students to display with every academic learning situation. 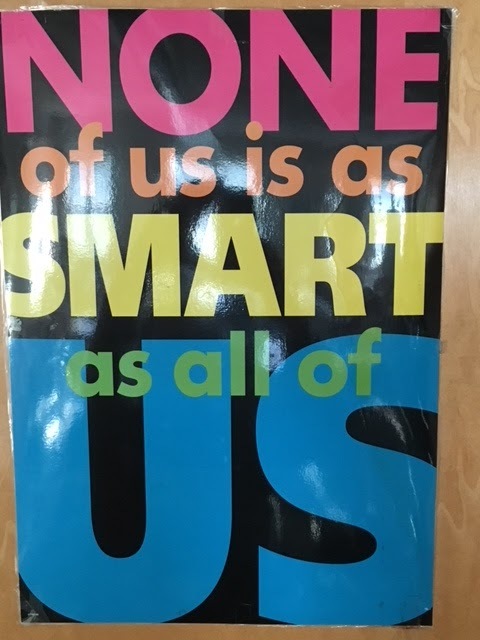 We can see it sometimes in sports, music, and other activities; we need to engender this same thinking in math, science, reading, writing, speaking, listening, and all the other subjects and skills we are trying to teach in school. It was such an excellent day. 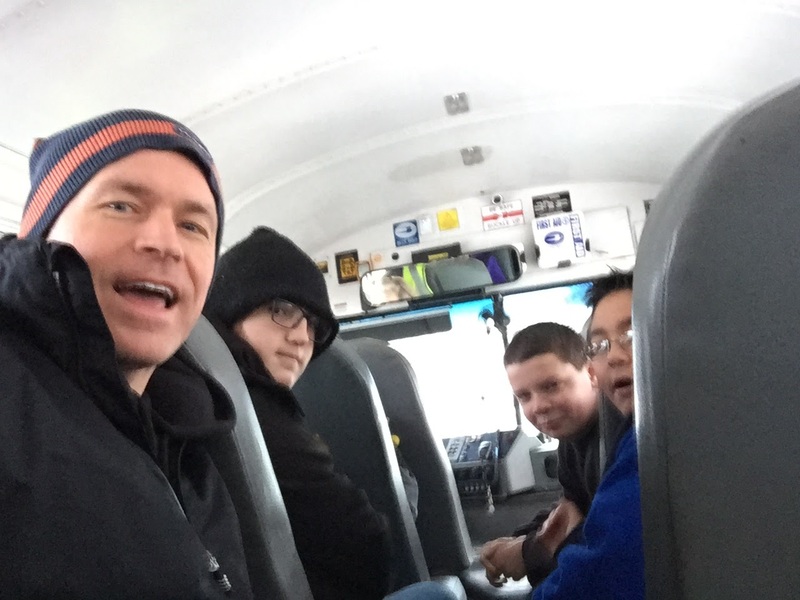 I loved all of it — the sloppy snowy walk to the stop, the shocked looks on the bus, the frenetic nature of the day, and all the great learning experiences I got to be a part of were tremendous. So much fun. Nick, of course, had to stay after for lessons, but we shared a handshake and had a quick word on how much fun it had been for him as well. 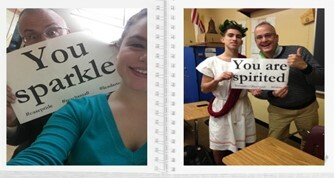 Thank you, Nick; you were awesome throughout, especially with my incessant selfies. 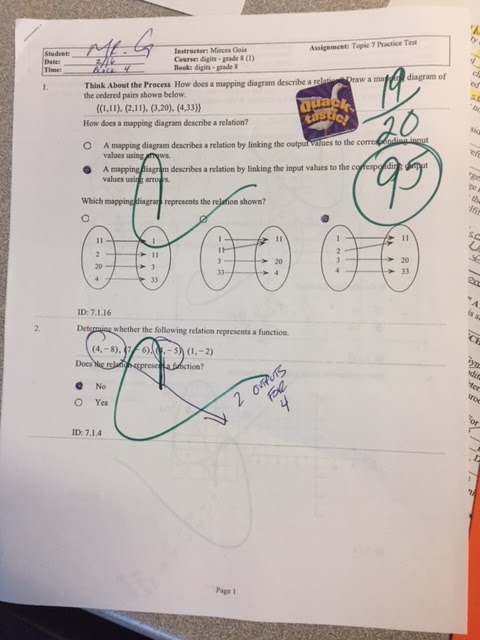 And by the way, I got a 95% on the Math Test. Woohoo. 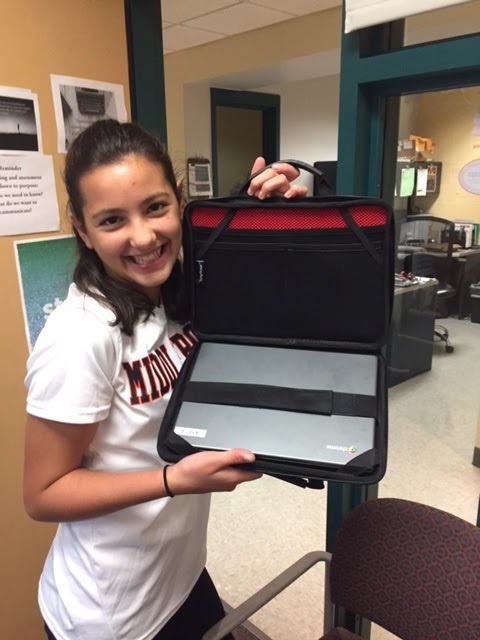 On Monday, October 17, our Nichols Middle eighth grade students were handed their Chromebook to utilize throughout their school day. It was something we had hoped to start on Day 1 of the new School Year, but these advances take time. 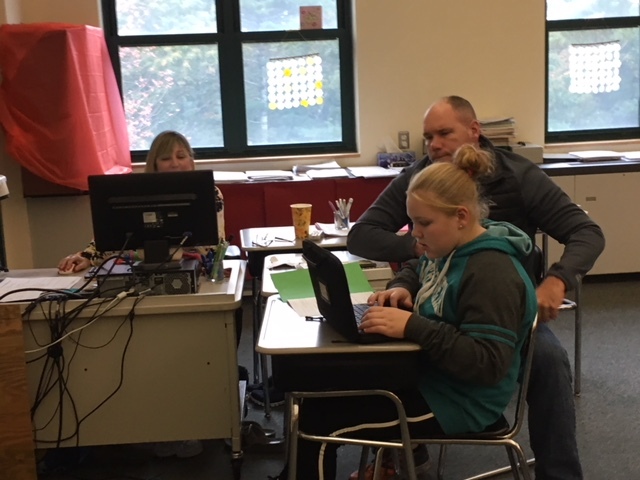 There was a whole lot of behind the scenes work that needed to be done by both the Technology Department as well as our NMS teachers with Administration. I can’t believe I’m saying this, but in retrospect, it might have been better this way. 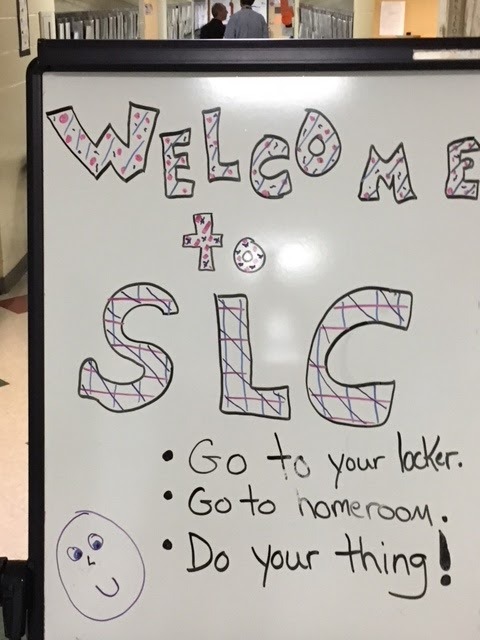 We got the initial “first days of school” introductions and guiding routines already imbedded with our students. They know what we expect and they have fully worked within this schedule for a few weeks. 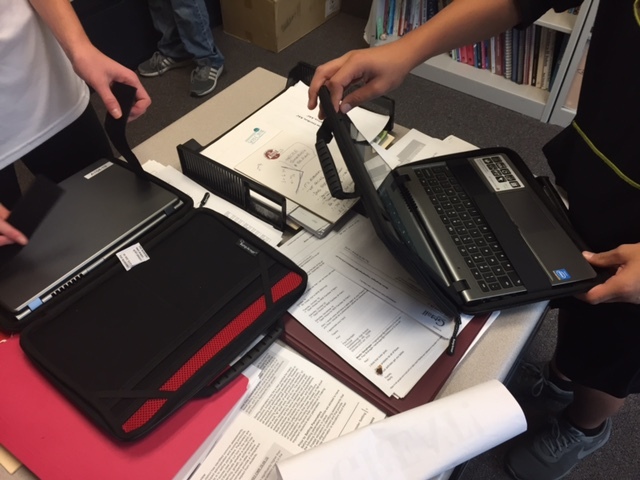 But now, we have the technology, and now it is our time to start utilizing the 1:1 Chromebooks to their fullest. Parents will notice more assignments coming home that take advantage of this technology. 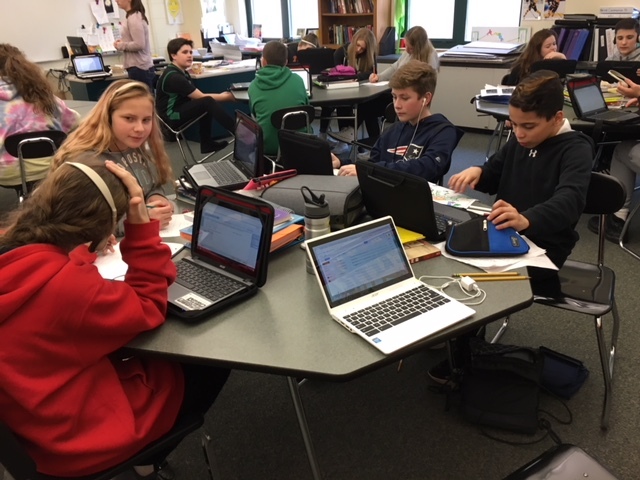 Students will be asked to go to their Google Classroom or might be cooperatively collaborating with peers on projects through the Google Suite of Applications (formerly known as GAFE = Google Apps for Education; it is now referred to as “G-Suite”). Our teachers, our students, and our principal have been dying for this day to happen, and we are here. 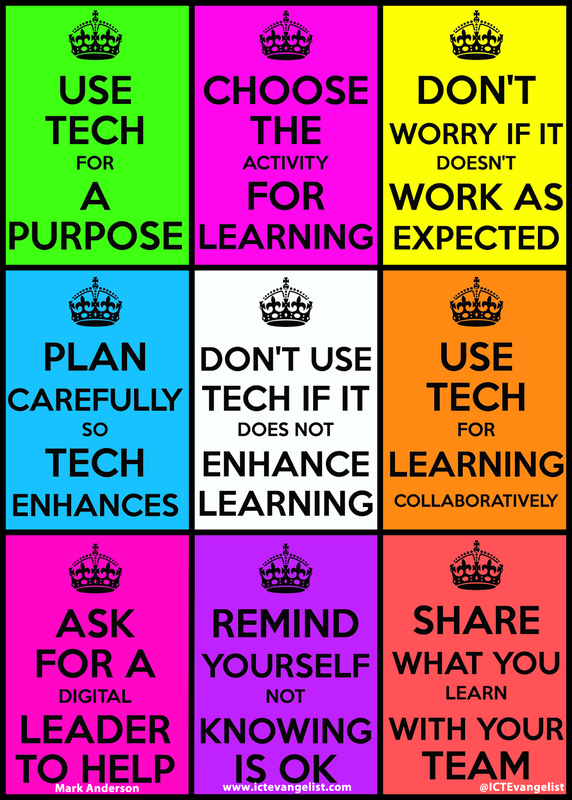 We are going to take advantage of this technology to support learning and make sure that the technology aids in our achievement. 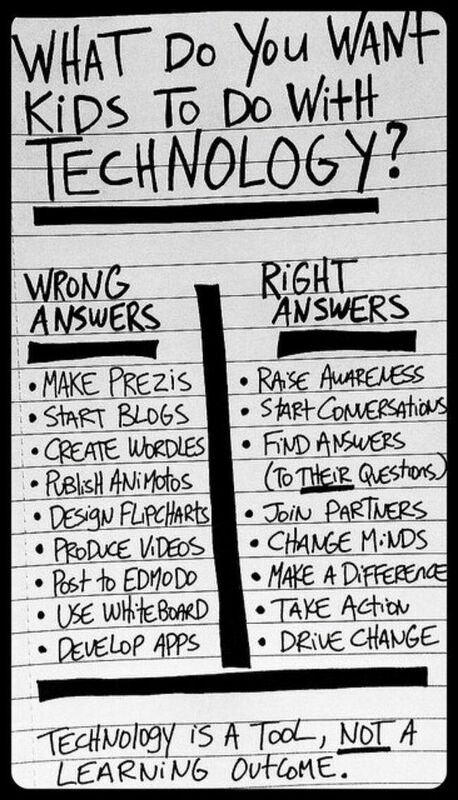 New toys in the form of technology does not always equate to more learning. 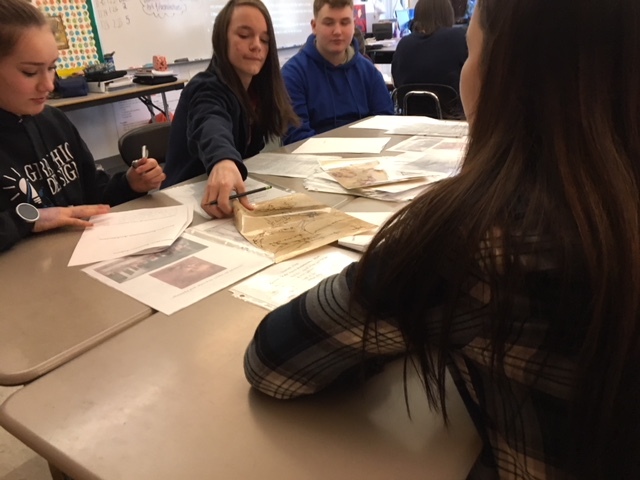 It takes a skilled teacher with detailed preparation and creativity to make these tools work for our student learning. 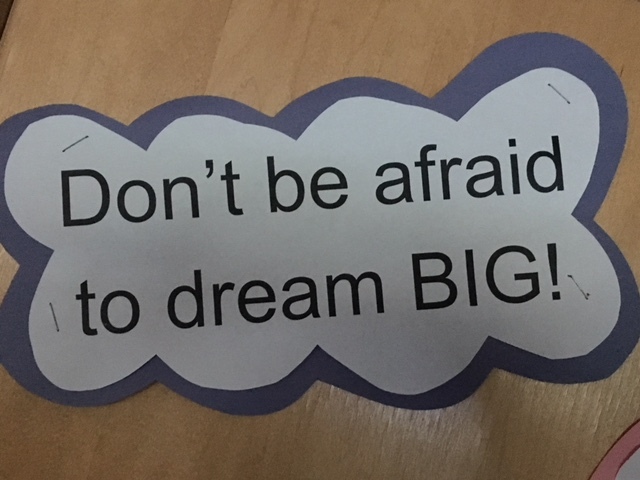 This is what we as a school community are aiming to do. This is the work our teachers are doing, and the support of the district in the form of Professional Development (PD) we are engaged in. 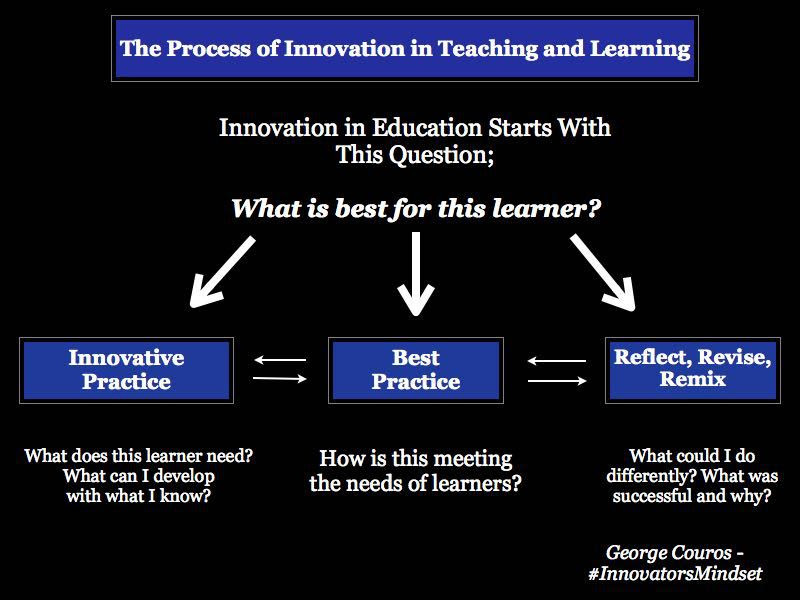 Here you see that it is the part of the educator and how the educator will use the technology which will help in seeing what is best for our learners. This is what we are working on with all of our educators in PD time, PD days, PLC blocks, and faculty and department meetings. 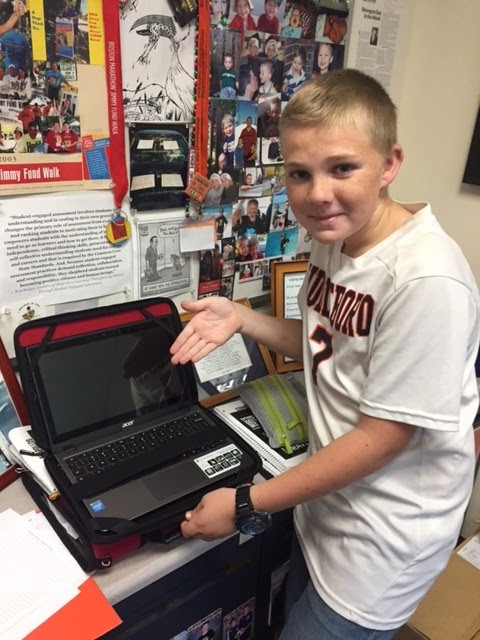 We want to help our teachers and staff to support the learning of our students with the aid of our new Chromebooks. And this is what I have seen in just one short week of it in our Eighth Grade. This is why we made it such an important budgetary decision. 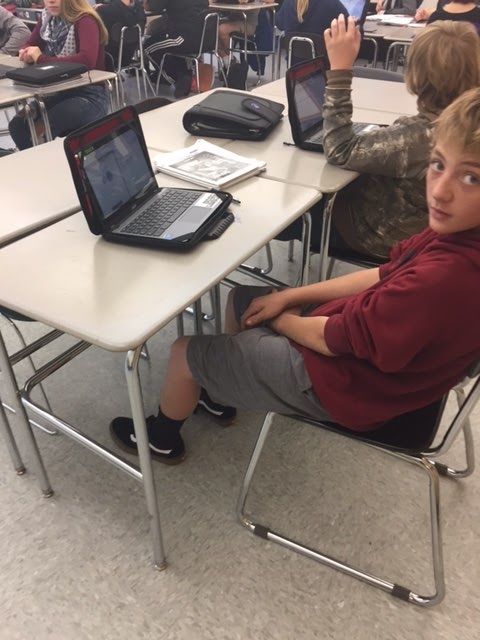 The gaining of time where students don’t have to log-in and log-out each period has given us back golden learning time. 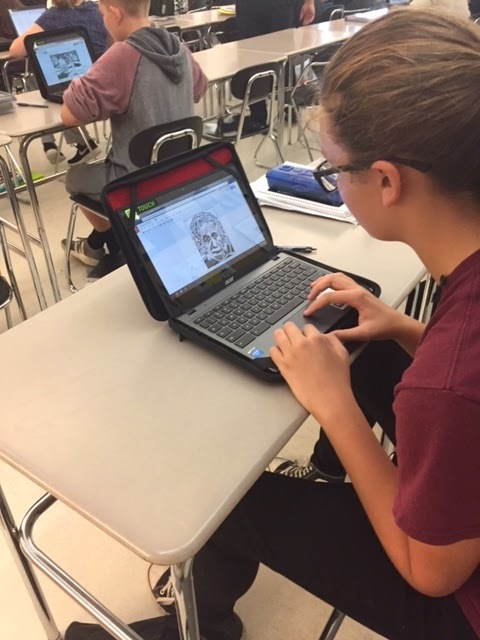 Teachers can now prepare and plan knowing that all students will have the Chromebook in their hands during their block to make their lesson better. Seventh Grade will start this week, and Sixth Grade will not be too long after. It has been a process, but believe me, it is worth it, if we continue to do it right.